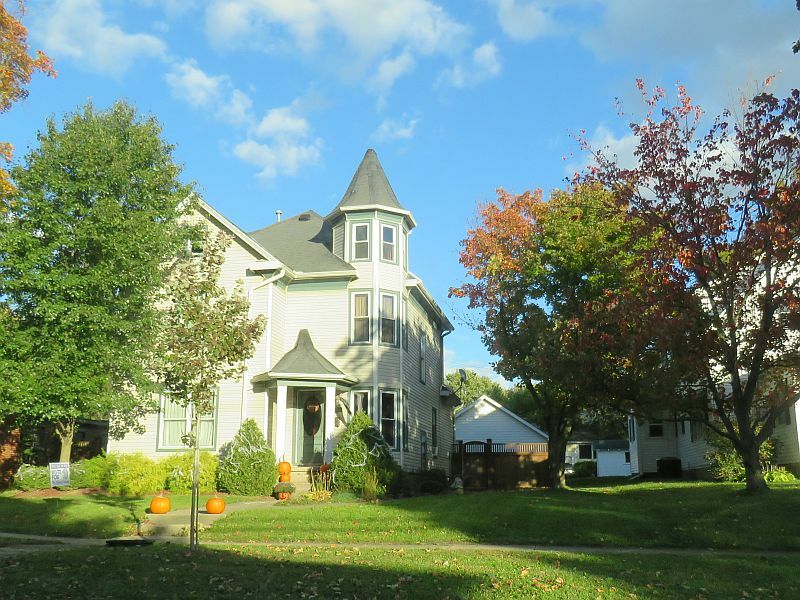 Last autumn, I spent a few days traveling around northwest Ohio. 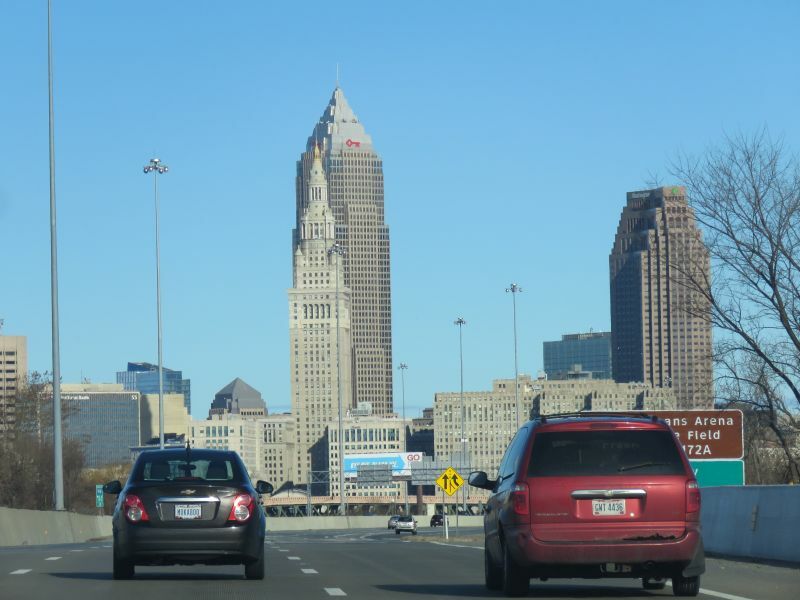 I was seeking out birding spots and historical sites, playing the tourist from Columbus. 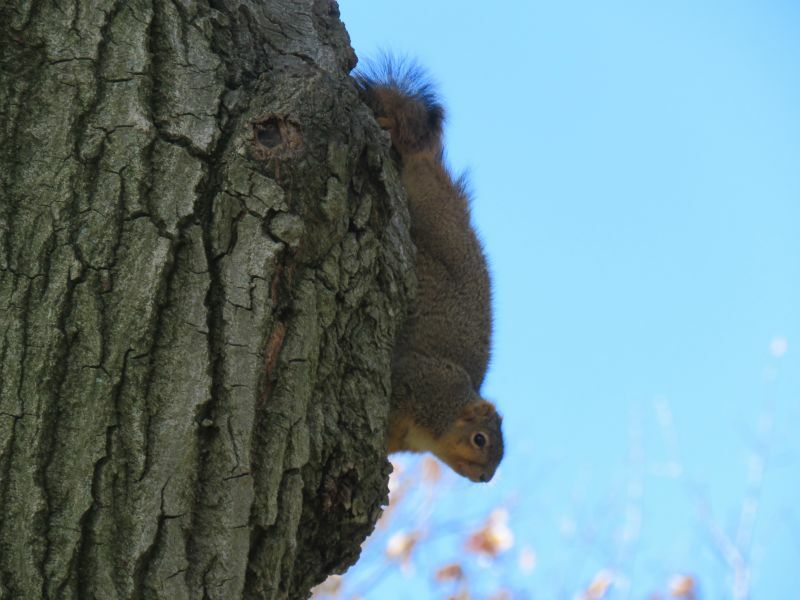 I had a good time- here’s some of what I saw. 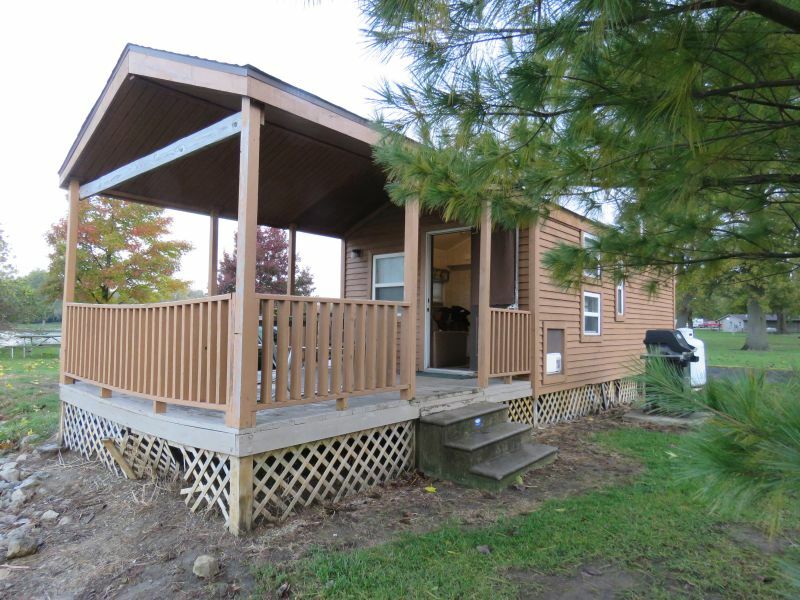 I stayed a couple nights at a small cabin at Grand Lake Saint Mary’s State Park in western Ohio. 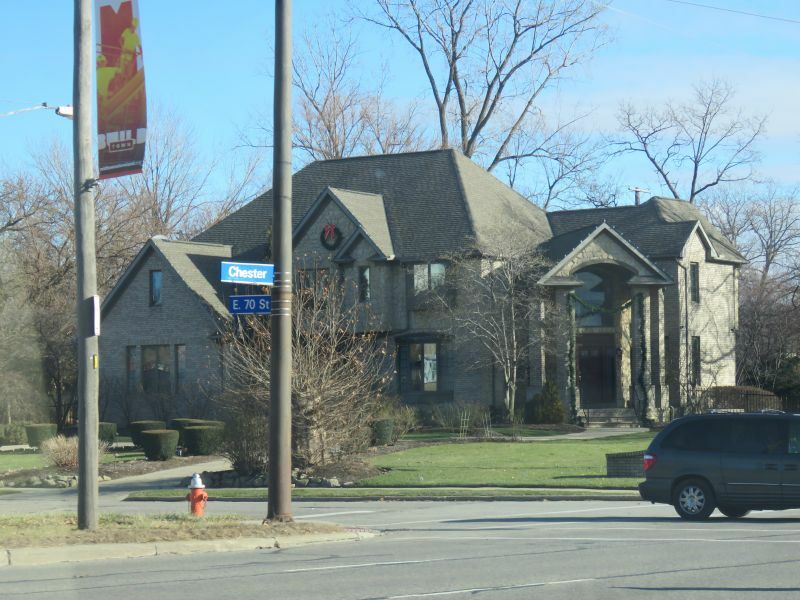 This was my base of operations for traveling through northwest Ohio up towards Michigan. 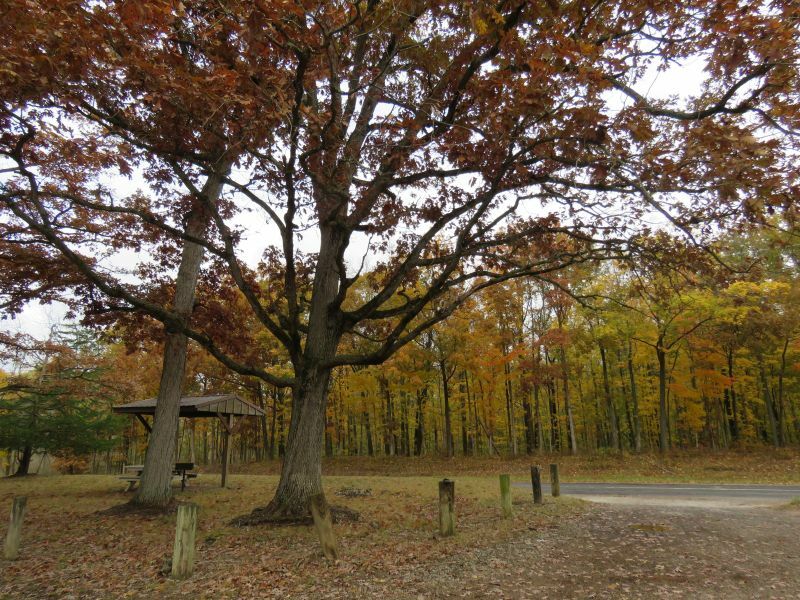 Grand Lake St. Marys State Park is a public recreation area located on 13,500-acre Grand Lake in Mercer and Auglaize counties, Ohio. 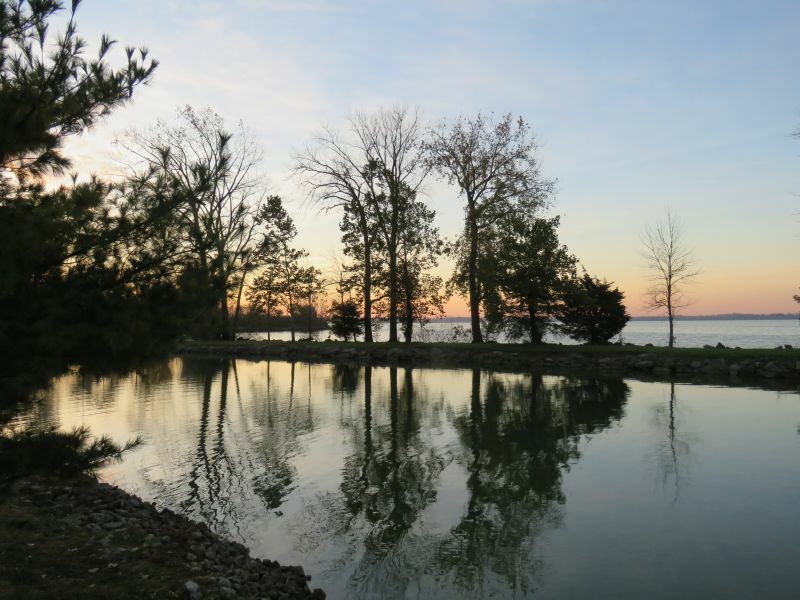 Grand Lake is the largest inland lake in Ohio in terms of area, but is very shallow, with an average depth of only 5 to 7 feet. 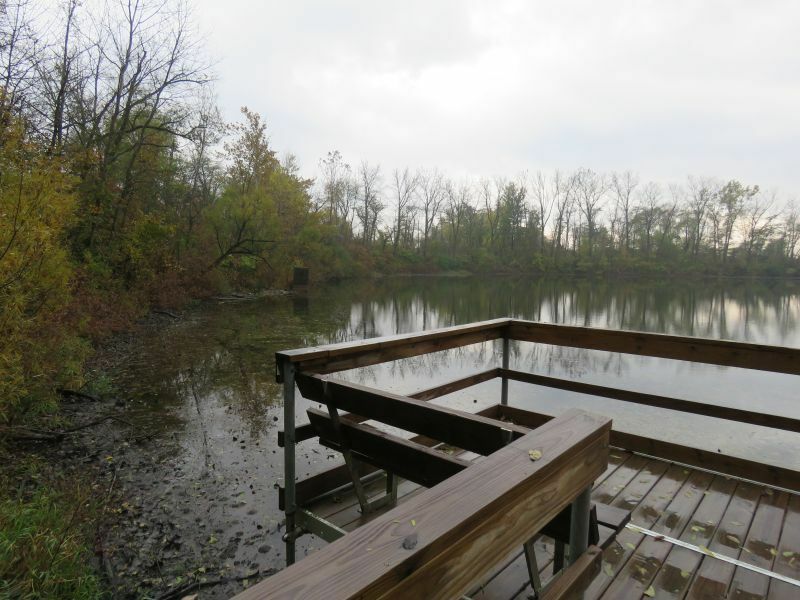 The state park is open for year-round recreation, including boating, fishing, swimming and hunting. 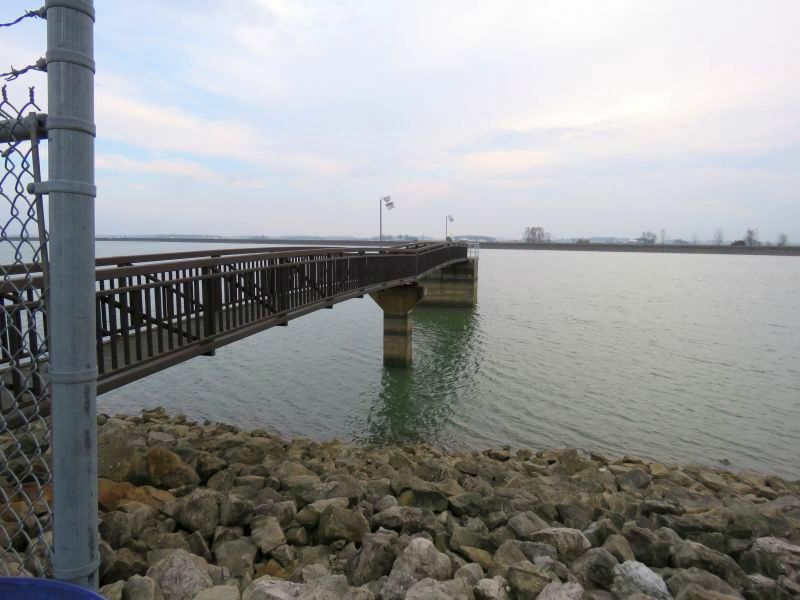 The park consists of the lake and park facilities scattered all around the shore intermingled with private property and a facility operated by Wright State University. 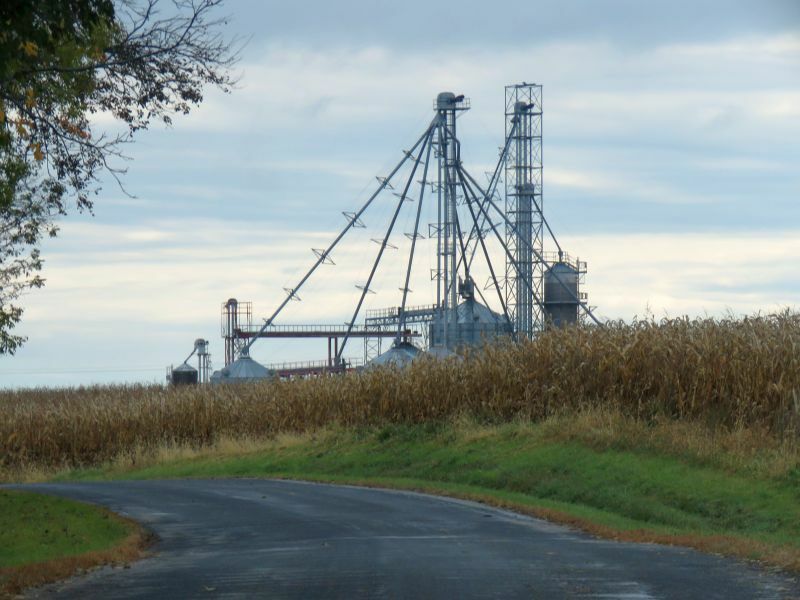 It is west of St. Marys, and south-east of Celina. 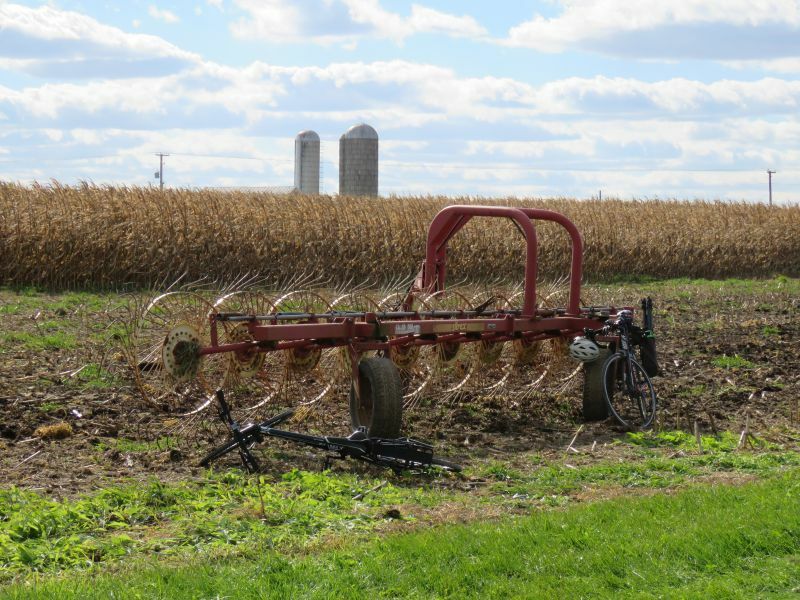 Northwest Ohio contains a lot of flat cropland- this is the till plains (and lake plains) region of the state. 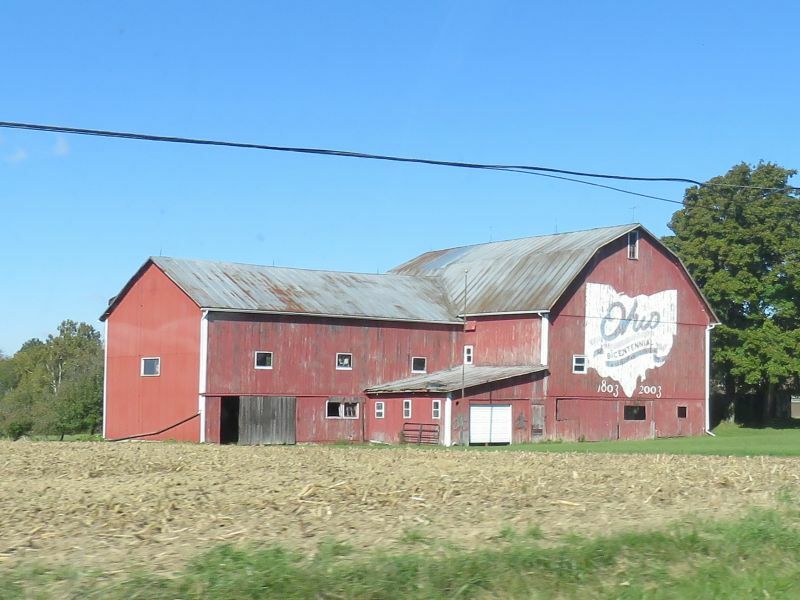 Western Ohio is largely farmland, while eastern Ohio has a good amount of forested hills. 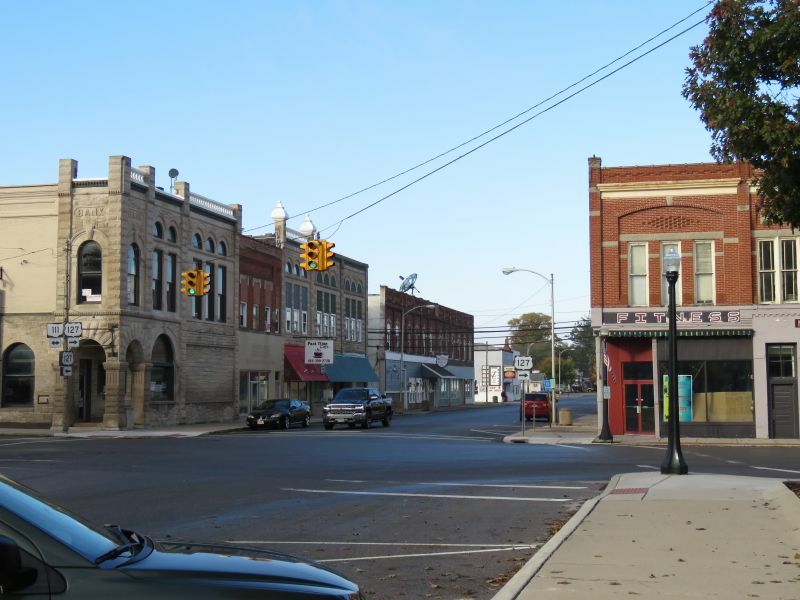 As always, I enjoy the backroads and visiting small town Ohio. 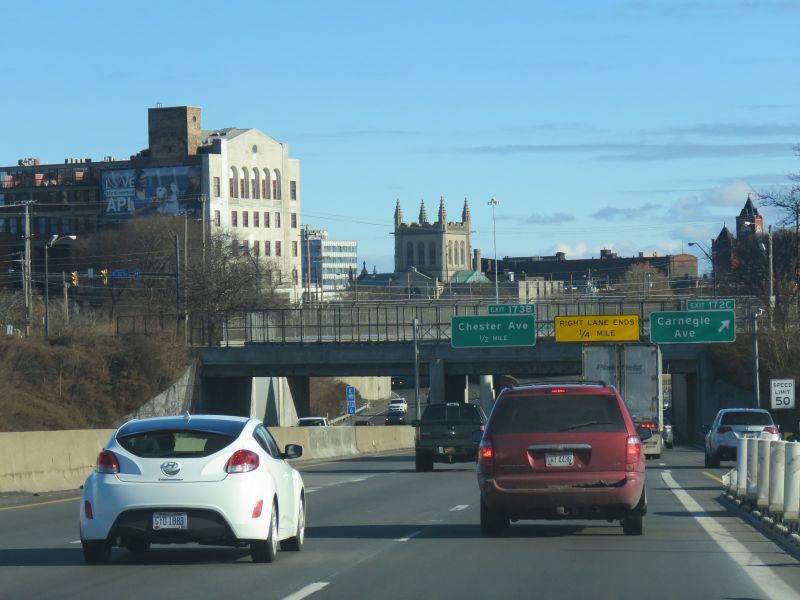 I spent a lot of time on Route 127, which went south-north through the area I was visiting. Here’s Paulding County’s courthouse. 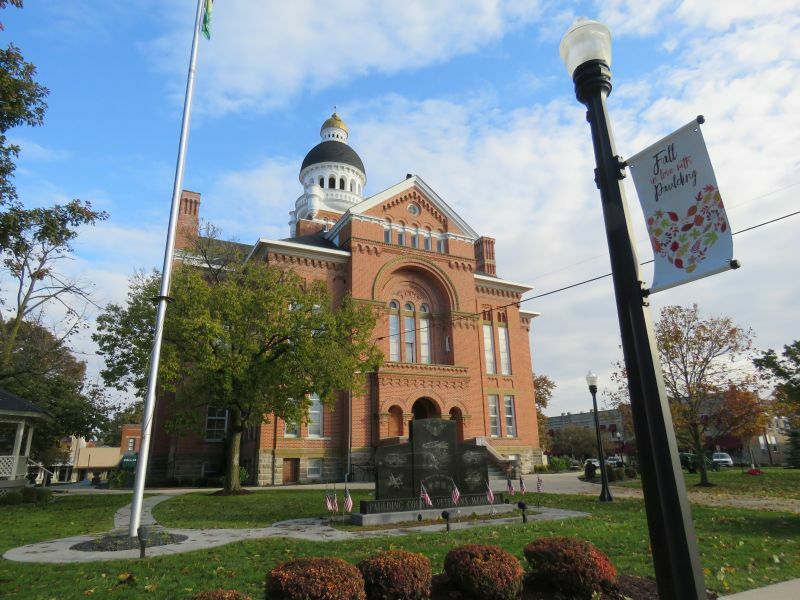 I’m going to do a post on Ohio’s county courthouses some day- they are excellent studies of 19th-century architecture. 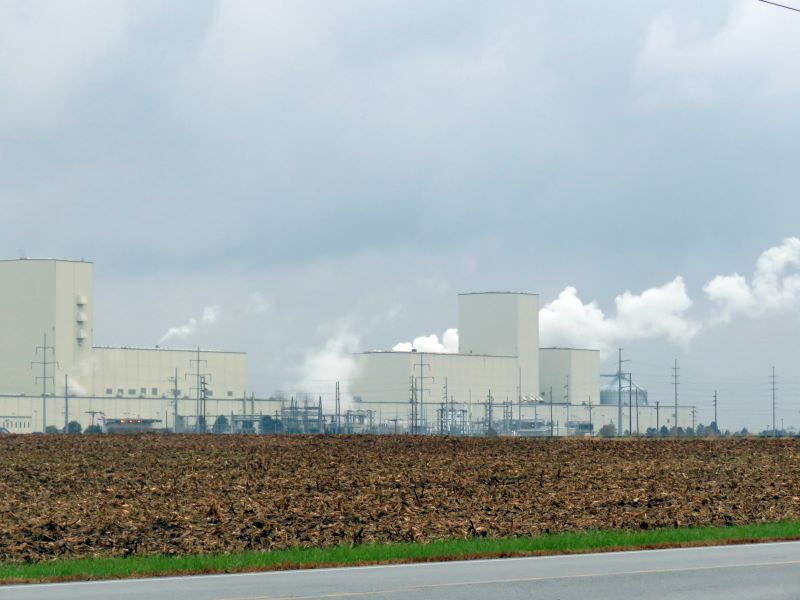 Occasional industrial facilities dotted the rural flatlands. 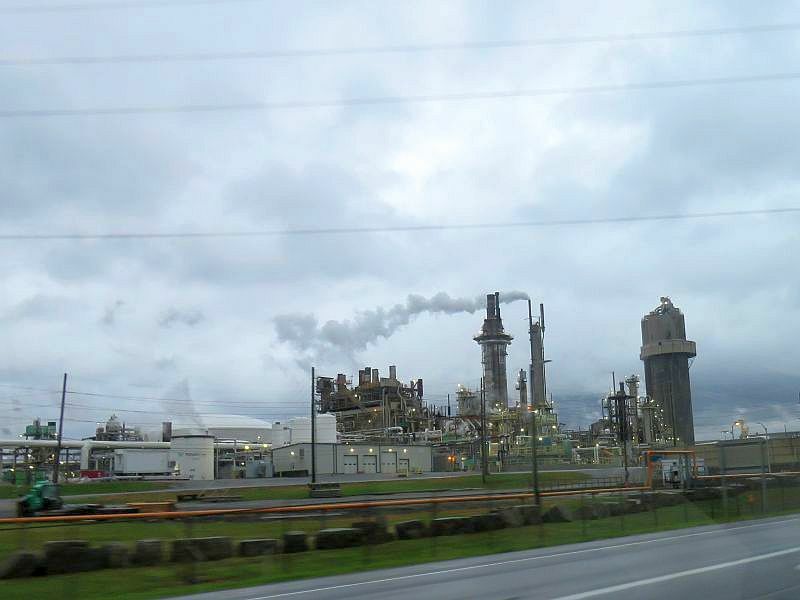 Lima’s oil refinery was of particular interest. 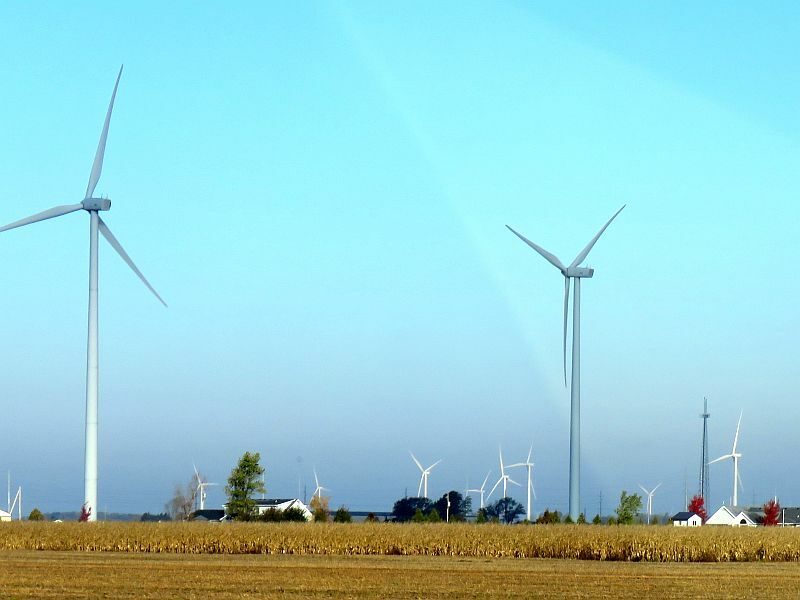 Paulding and Wan Wert Counties had large wind farms out amidst the farmlands. It’s hard to get a feel for how tall the wind turbines are without being directly under them. 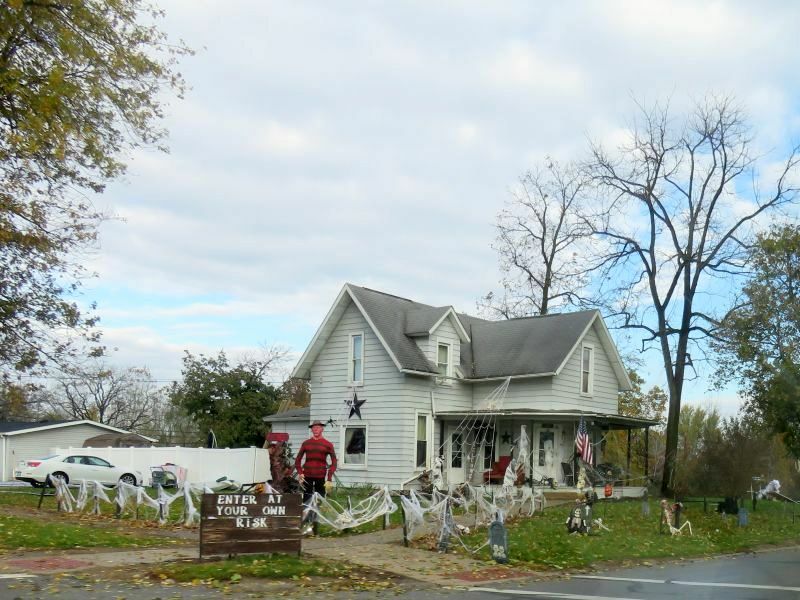 Halloween was on the way, and occasional houses were well-decorated to suit the season. 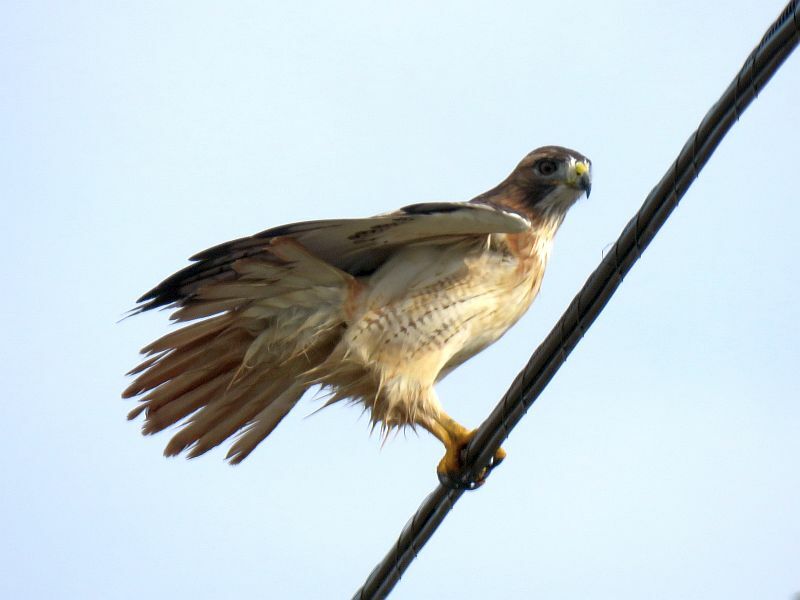 This Red-Tailed Hawk perched on a power line. I was in full birding mode! 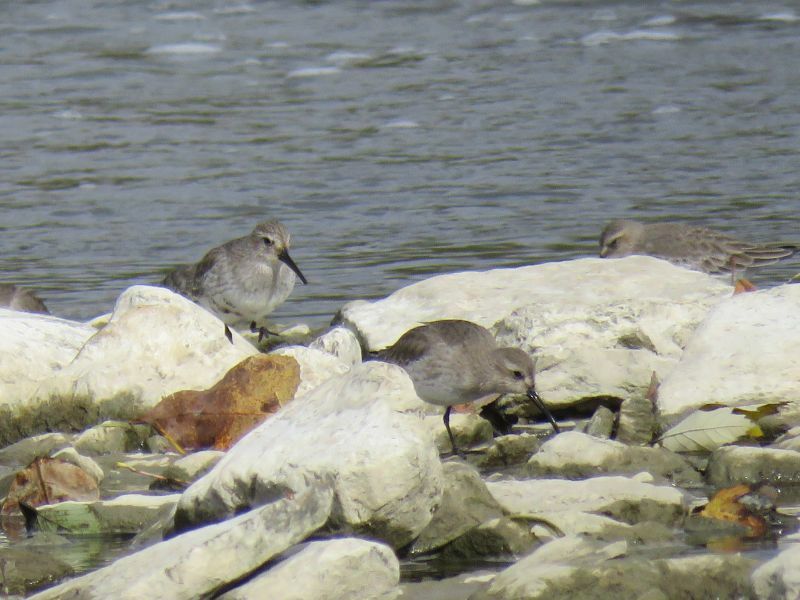 I stopped at a few reservoirs along the way, looking for waterfowl and shorebirds. 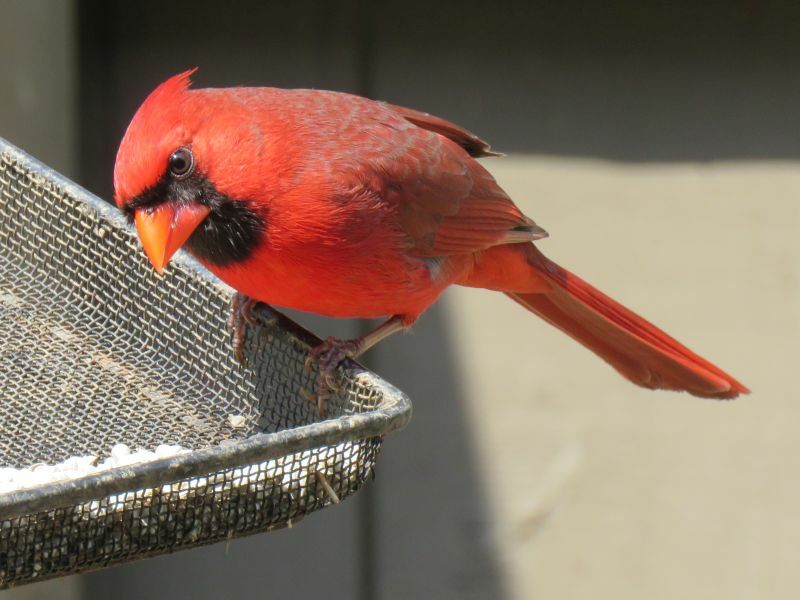 One of the highlight stops for birds was the Black Swamp Nature Center in Paulding County. 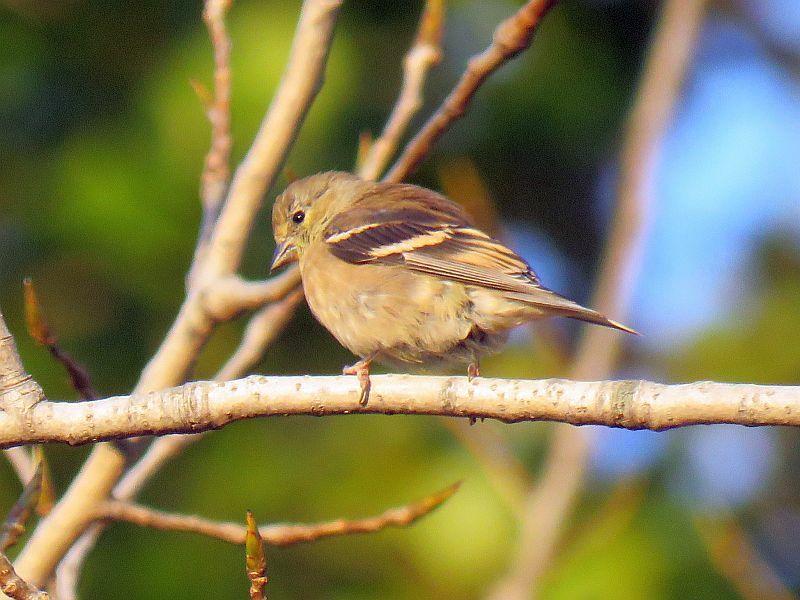 I saw some Yellow-Rumped Warblers and Rusty Blackbirds there. 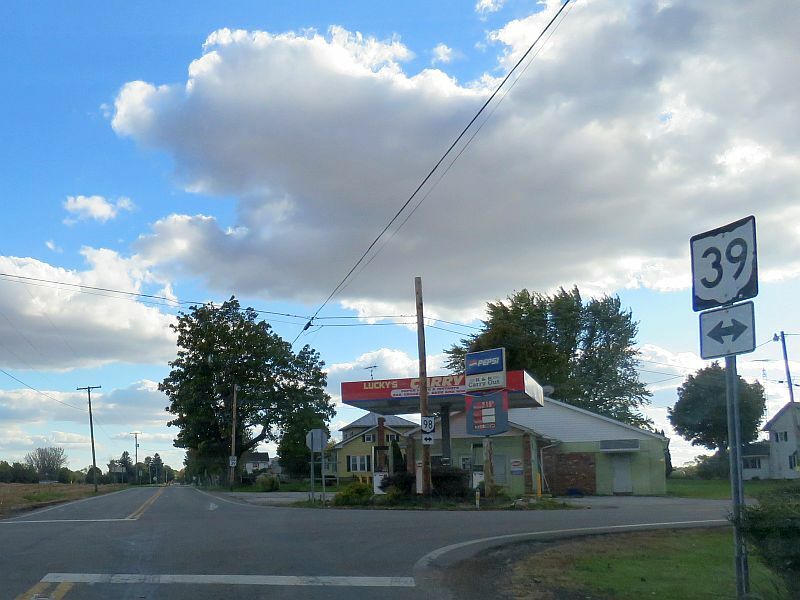 Up in the very northwest corner of Ohio is Williams County. 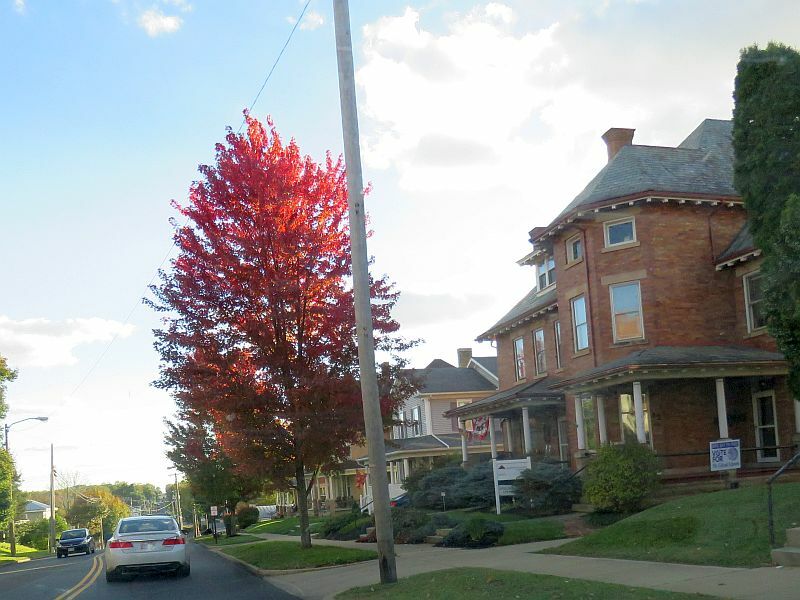 I visited George Bible Park there, and noted that the trees were more colorful there than the trees in central Ohio at that time. 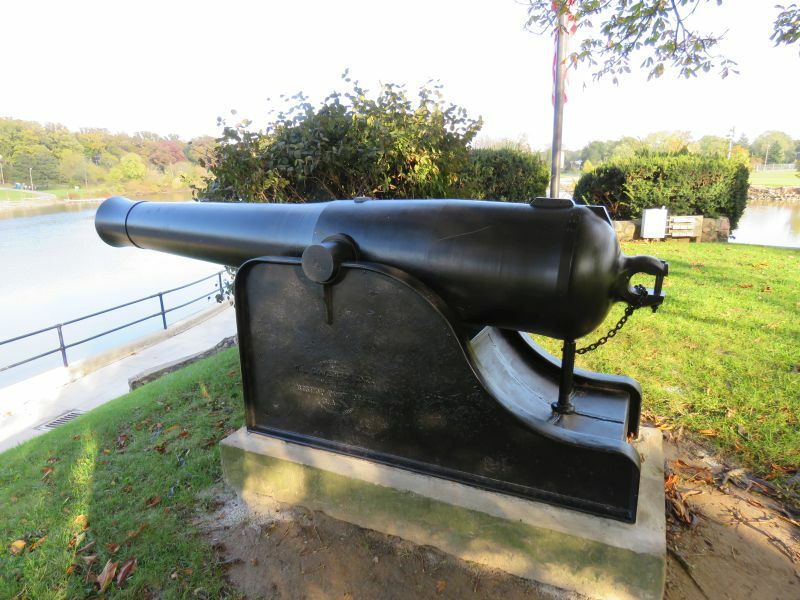 One of the highlights history-wise of my trip was a visit to Fort Defiance Park in Defiance, Ohio. 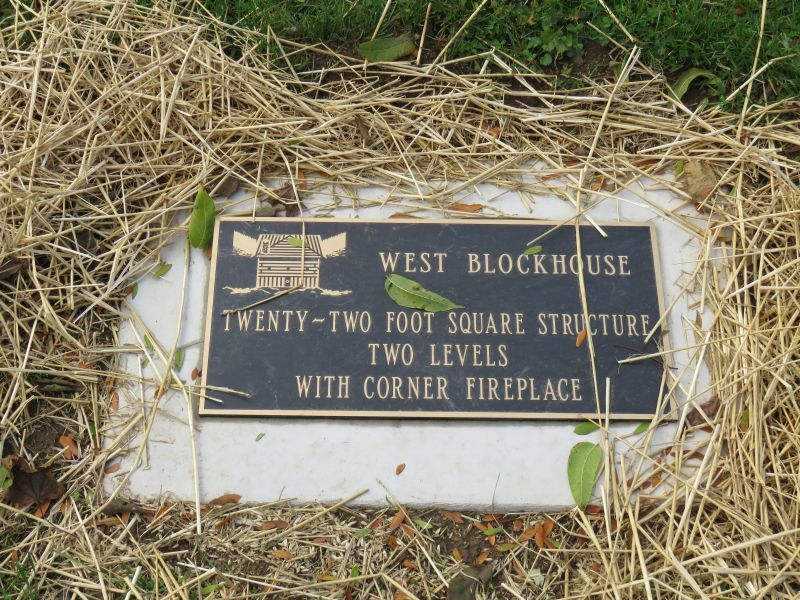 As you can see in the above pictures, only the fort’s earthworks are visible now, but the park has lots of signage to give you information about the site. 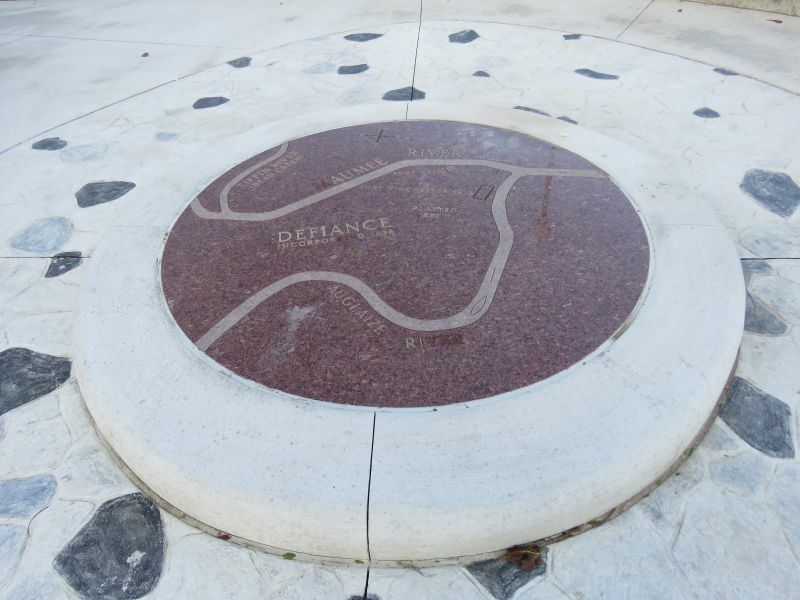 If you remember my post about historic Fort Recovery Ohio, you’ll be familiar with the earlier part of the story of Fort Defiance. 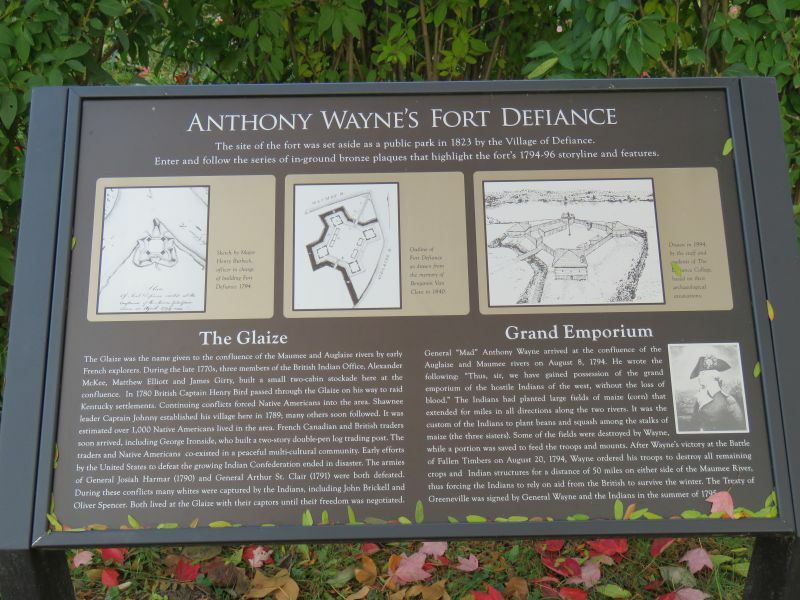 General Wayne and his Legion of the United States, flush from victory at Fort Recovery, moved up towards the Native American stronghold area near the British Fort Detroit in 1794. 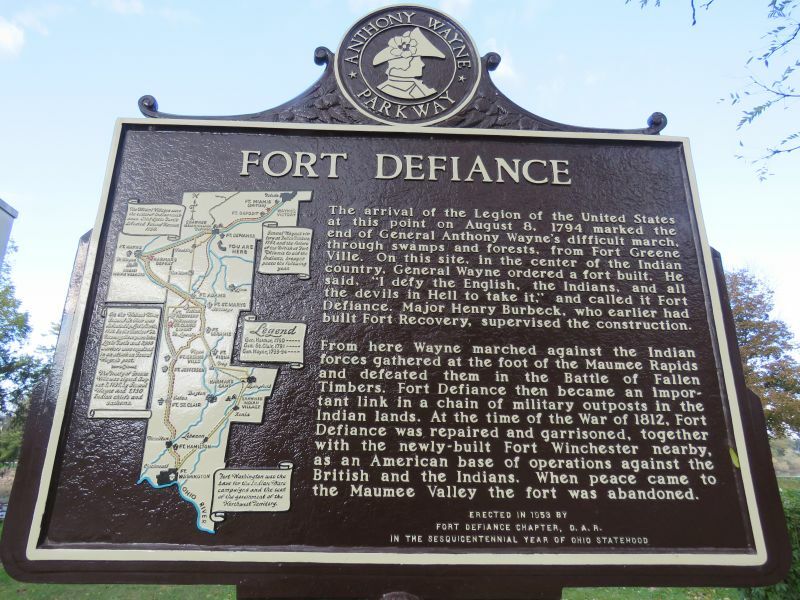 He built Fort Defiance at the confluence of the Maumee and Auglaize Rivers. 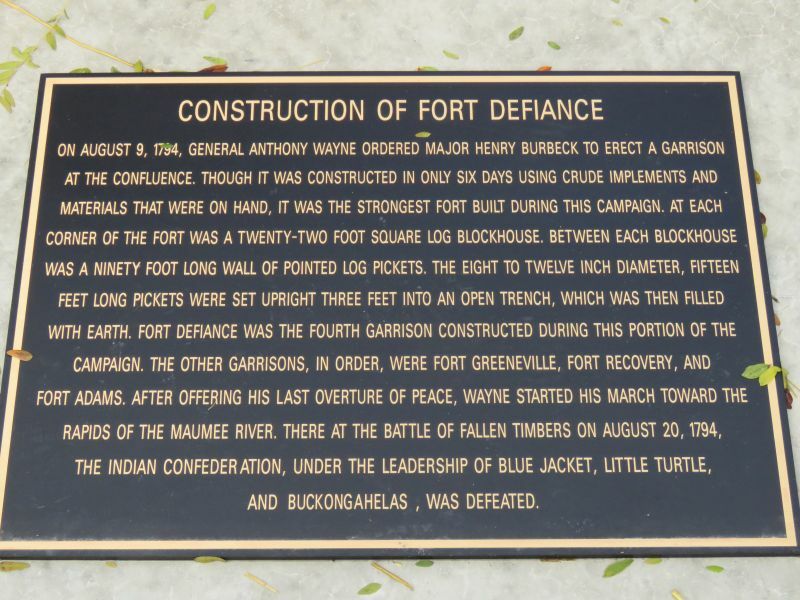 He used Fort Defiance as the jumping-off point for the decisive Battle of Fallen Timbers further north, which was the battle that claimed the Old Northwest Territory for the fledgling United States. 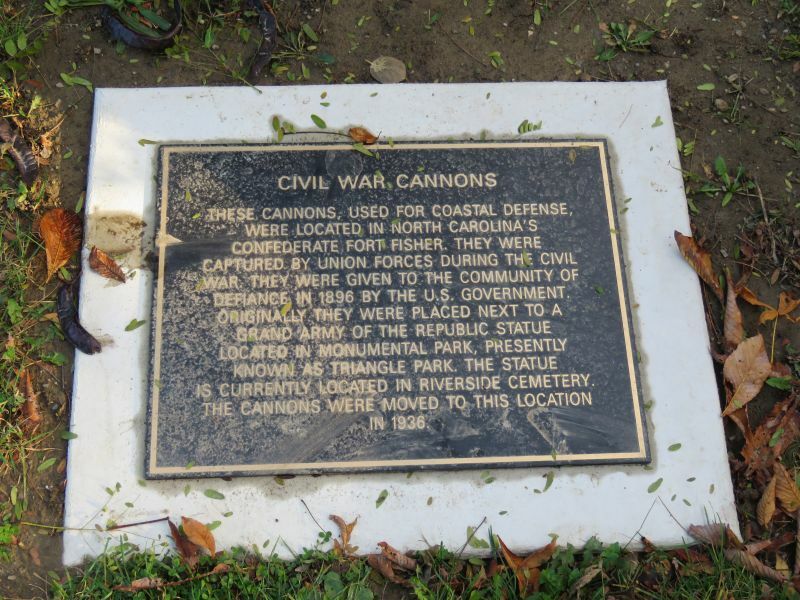 There are plaques at every location in the fort where a room or feature used to be. I was glad to see this documentation, it made the fort more real for me. I was slightly surprised that the fort was as small as it was. 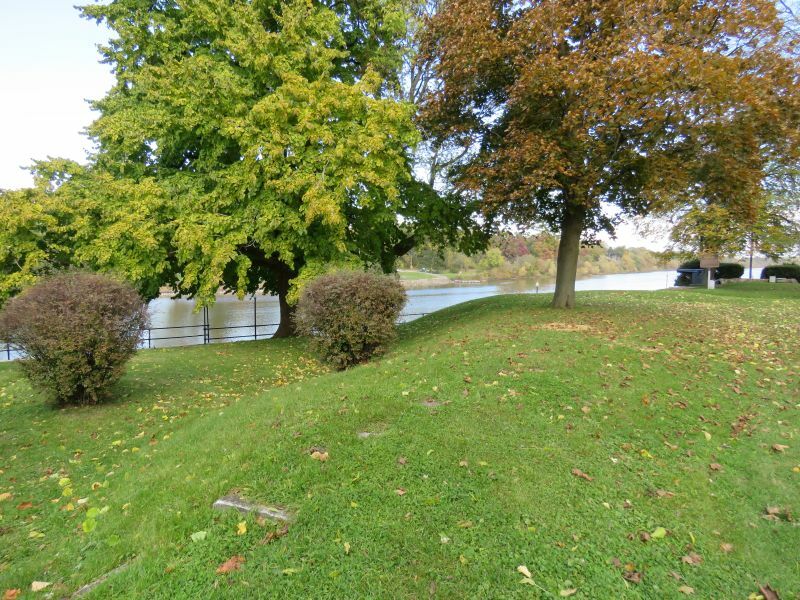 Here’s where the Maumee and the Auglaize Rivers meet- at the heights where Fort Defiance was built. 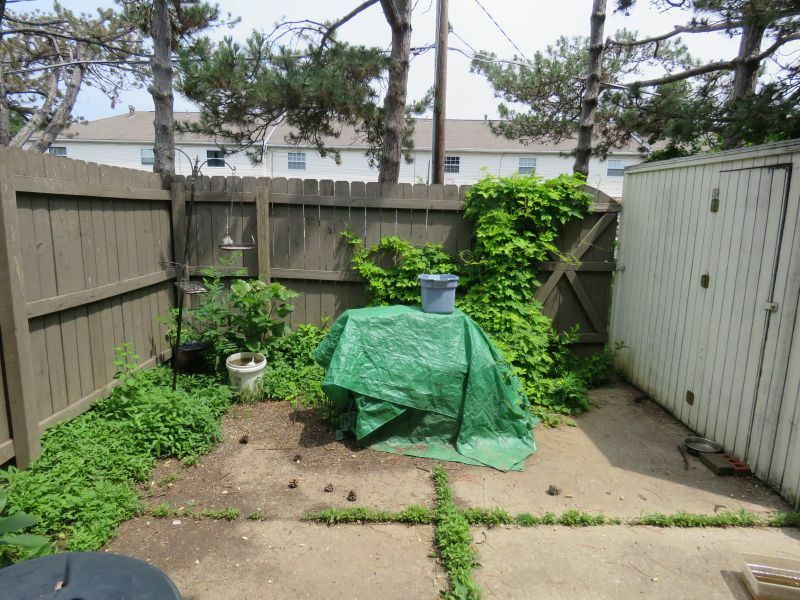 It is a solid strategic location for defense and control of movement and trade. The Ohio Territory wouldn’t become a state for another 9 years. 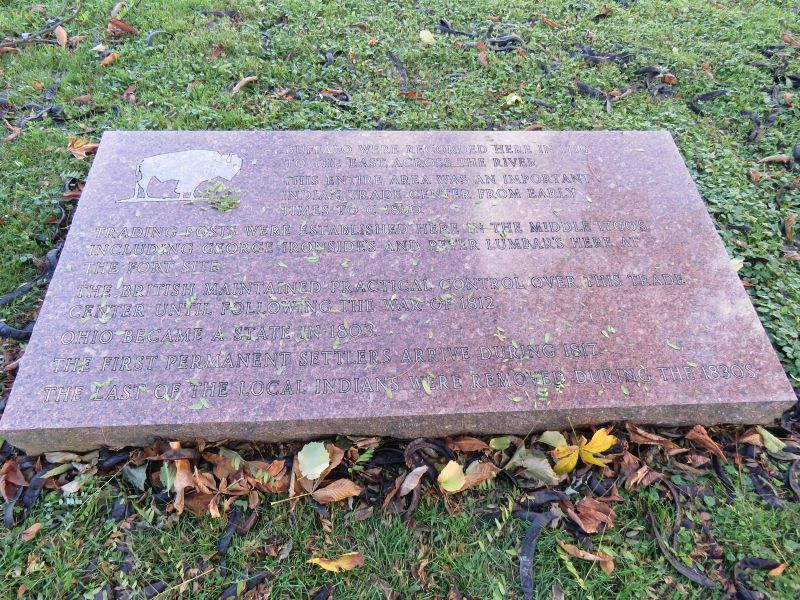 The inscribed stone above is a bit hard to read, but it commemorates the Native American Peoples and the herds of buffalo that originally lived in the area. 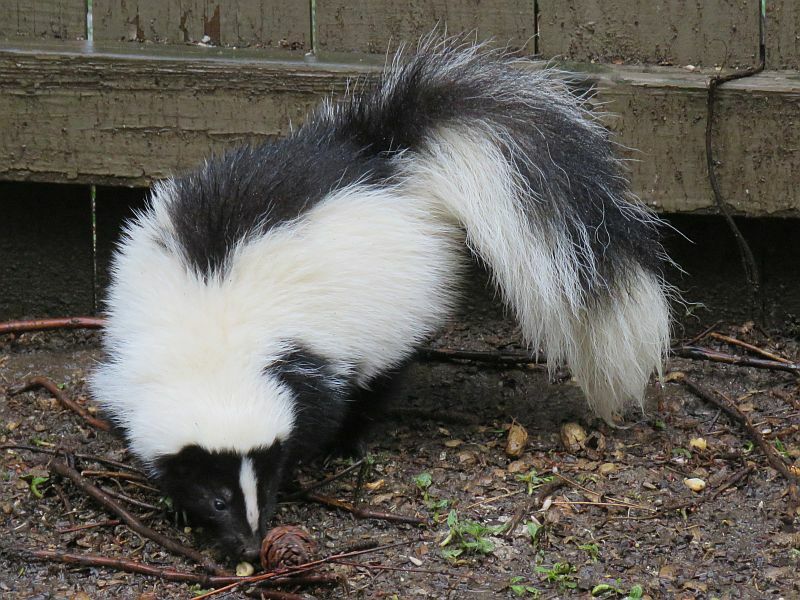 It’s hard to believe that there were such things as wolves, elk and buffalo in Ohio at least up until the early 1800s. It is also amazing to think that White-Tailed Deer were once nearly hunted to extinction in the early 1900s. 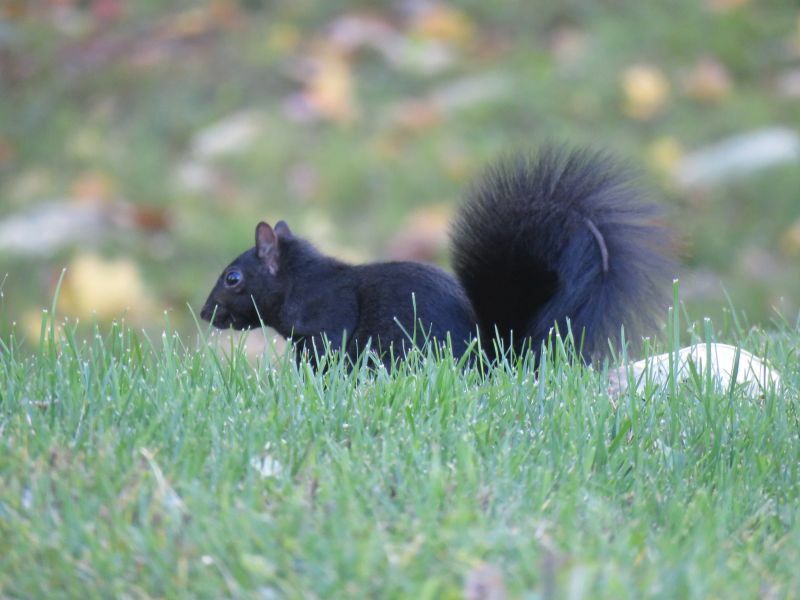 Here’s an example of wildlife living in the park today- a black squirrel (a recessive coloration of an Eastern Gray Squirrel). 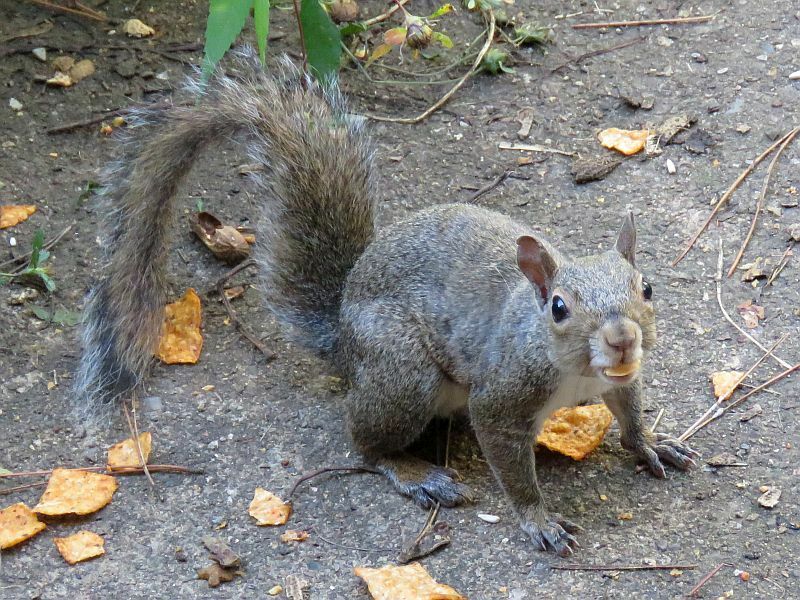 There is a theory that all Gray Squirrels used to be black when forests covered most of Ohio centuries ago, and that their current gray coloration is more adaptive to the current environment. 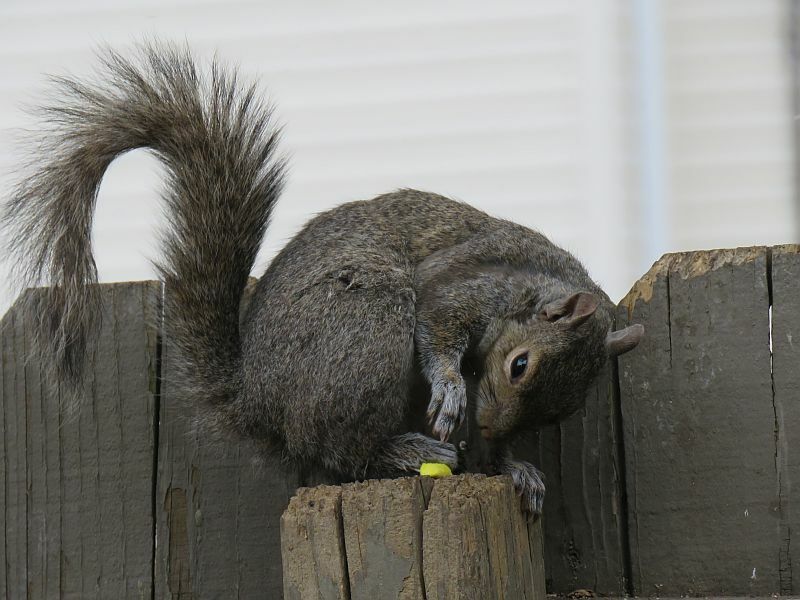 I mentioned this in my post about black squirrels years ago. 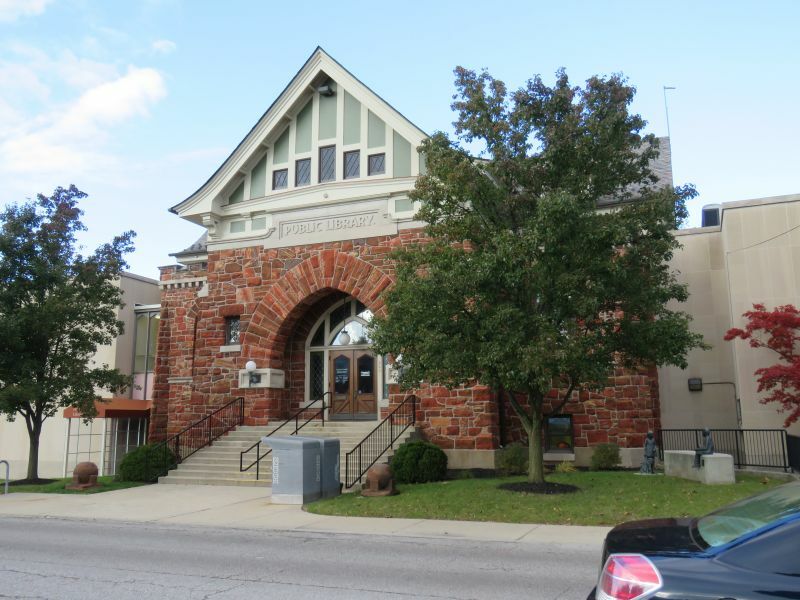 Defiance’s Public Library sits next to the park- it’s a nice building in its own right. 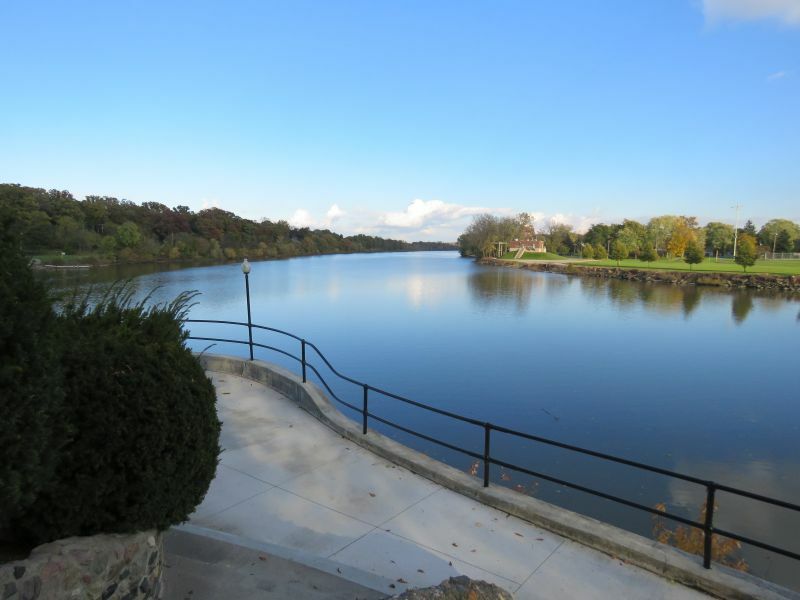 A nice view of the Maumee from Fort Defiance. 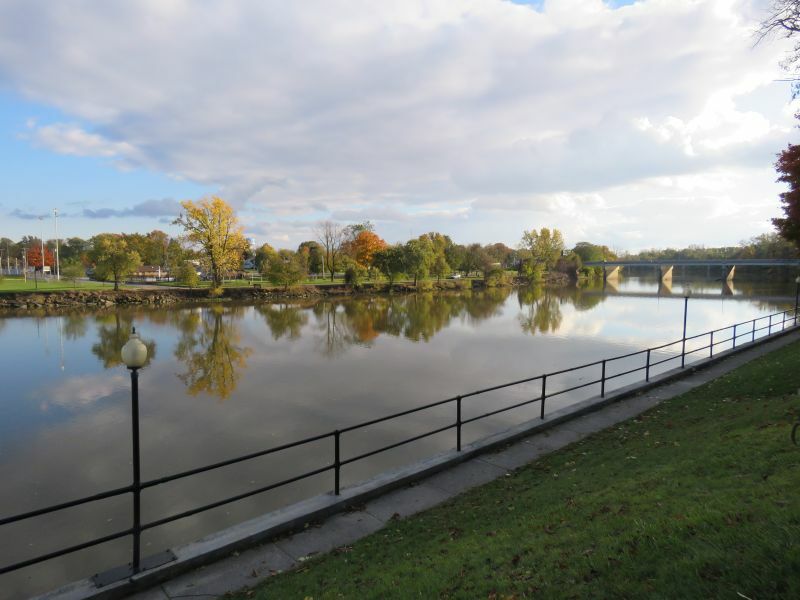 The Maumee River gets its name from the Miami tribe of Native Americans; the river used to be known as the Miami River for that same reason. Pronunciations by the settlers of Native American words was usually a bit off. A view of the river a few miles away from Defiance. 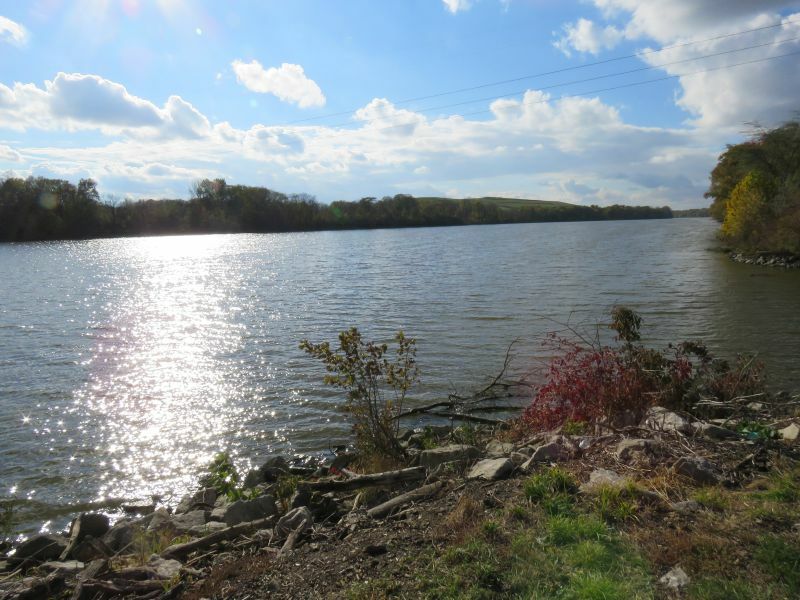 The Maumee River is the largest watershed of any river feeding the Great Lakes, traveling through the breadbasket of Ohio from its origins around Fort Wayne Indiana. 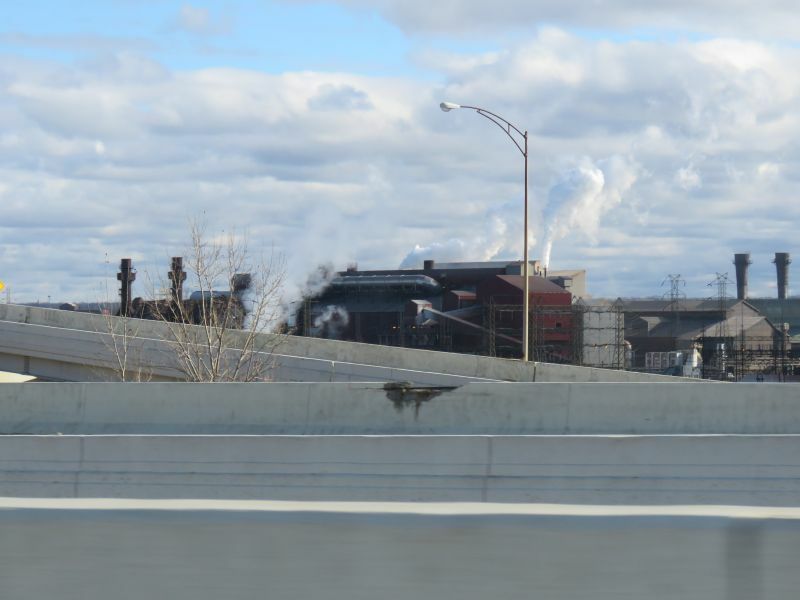 From Fort Defiance, I followed the river up towards its terminus in Lake Erie. 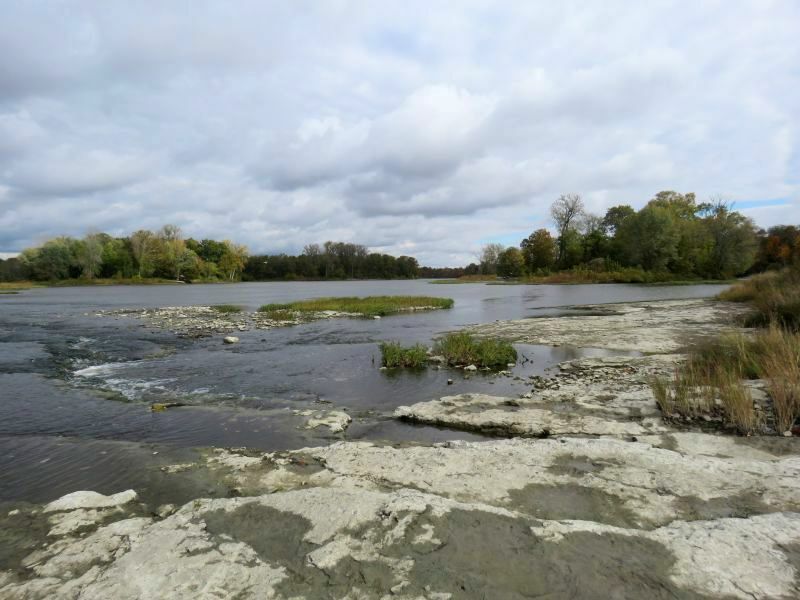 Here’s the Weir Rapids area of the Maumee. One can imagine the canoes of Native Americans, French Woodsrunners, and British and American traders plying this area like they did for centuries. 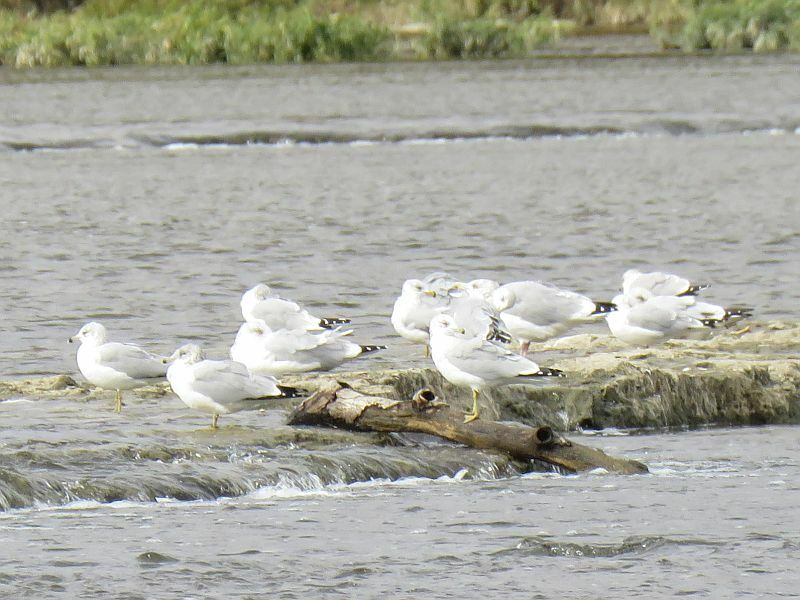 Ring-Billed Gulls and Dunlin shorebirds hung out in the shallows. 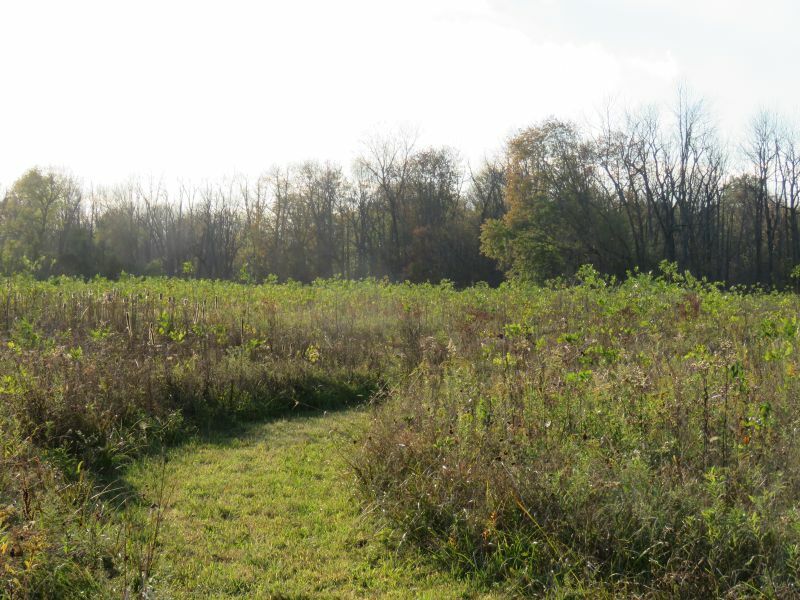 Much of the area of the Maumee watershed used to be the Great Black Swamp, a large area of glacially-fed wetlands in northwest Ohio. 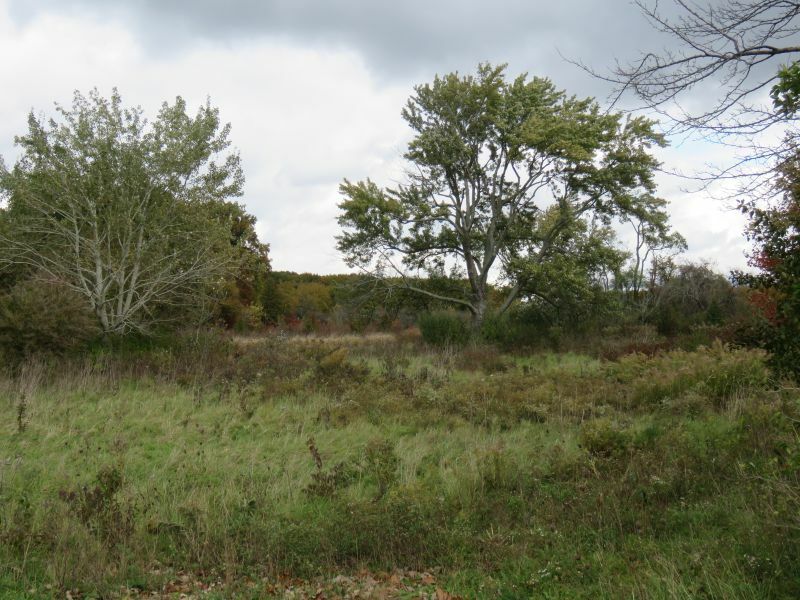 It was drained by the late 19th century and provides rich agricultural soil. 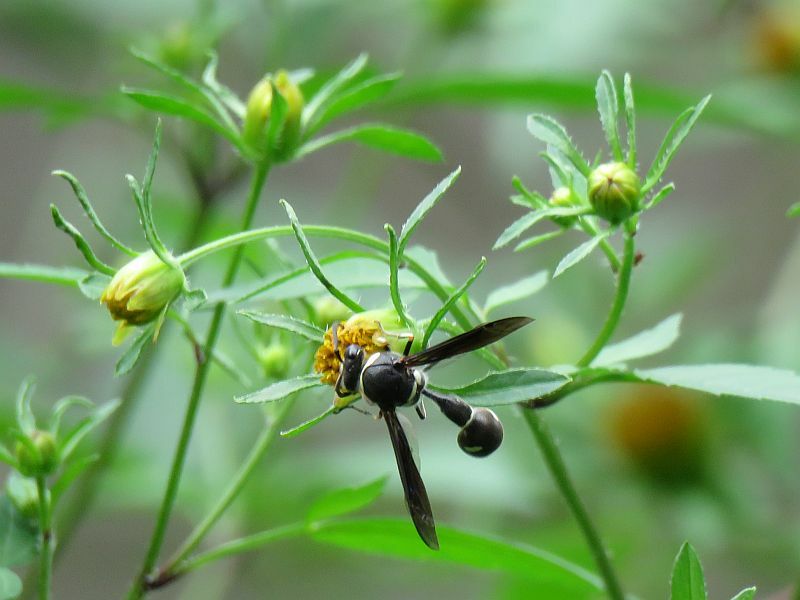 This ended the serious problems with malaria the area had had for thousands of years. 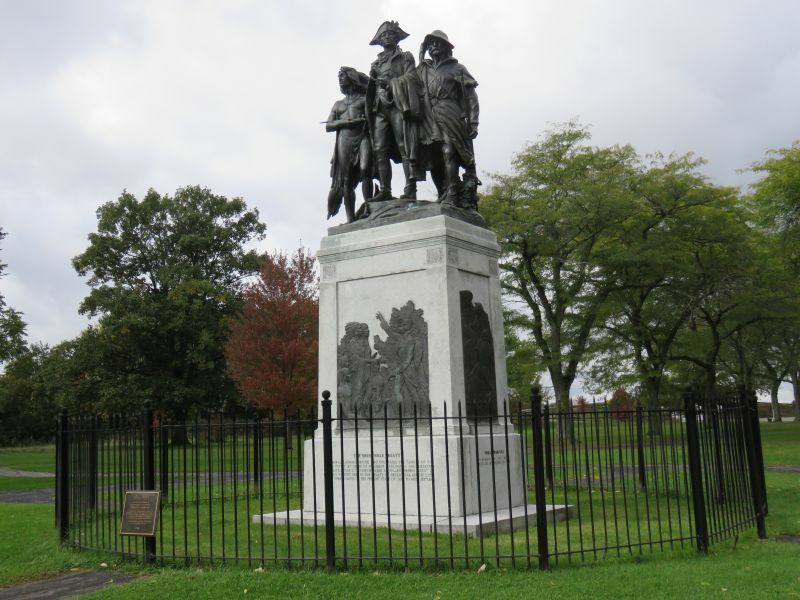 As the Maumee River gets close to Lake Erie in the greater Toledo area, there is the Battle of Fallen Timbers Monument, recognizing General Wayne’s greatest victory over the Native American Confederacy led by Blue Jacket and Little Turtle. This decisive victory by the forces of the young United States opened up the Ohio Territory and ultimately the Old Northwest Territory to American settlement. The park is long but fairly narrow. 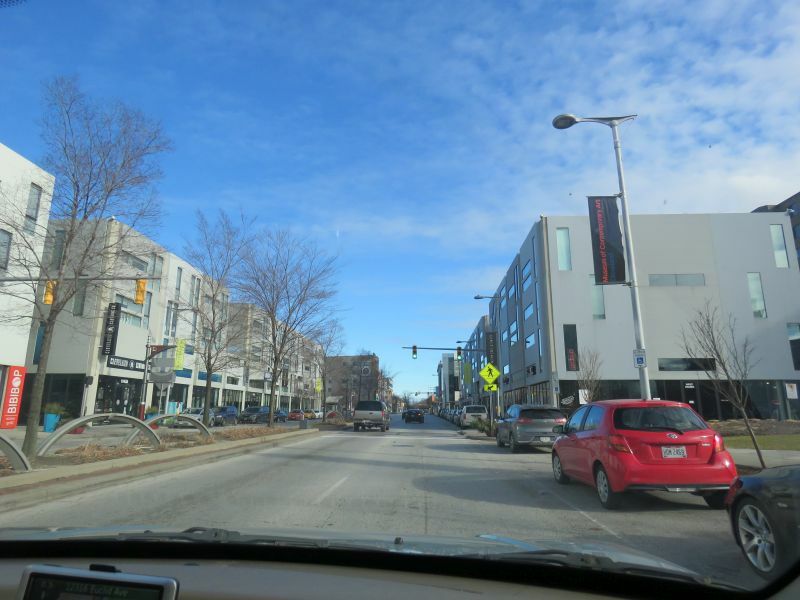 From the parking lot you walk towards a cluster of plaques, monuments and statuary. 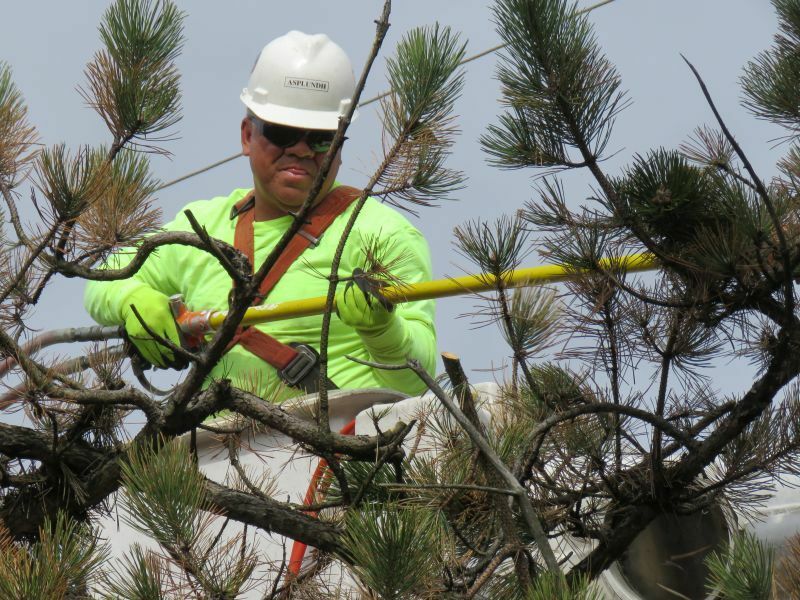 The Battle was at a place called Fallen Timbers, where a tornado had jumbled up many fallen trees. A description of the battle can be found in the book Autumn of the Black Snake: The Creation of the US Army and the Invasion that Opened the West by William Hogeland. 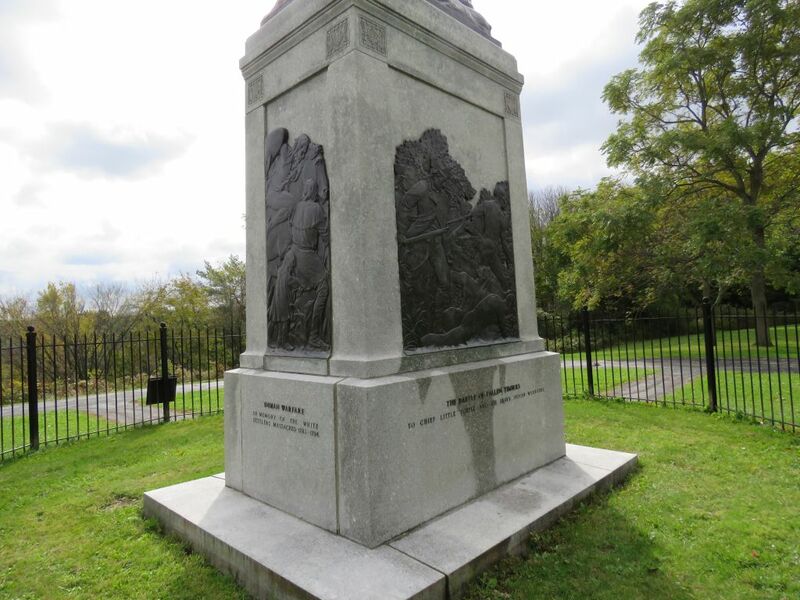 The battlefield is a quarter of a mile north from the monument. 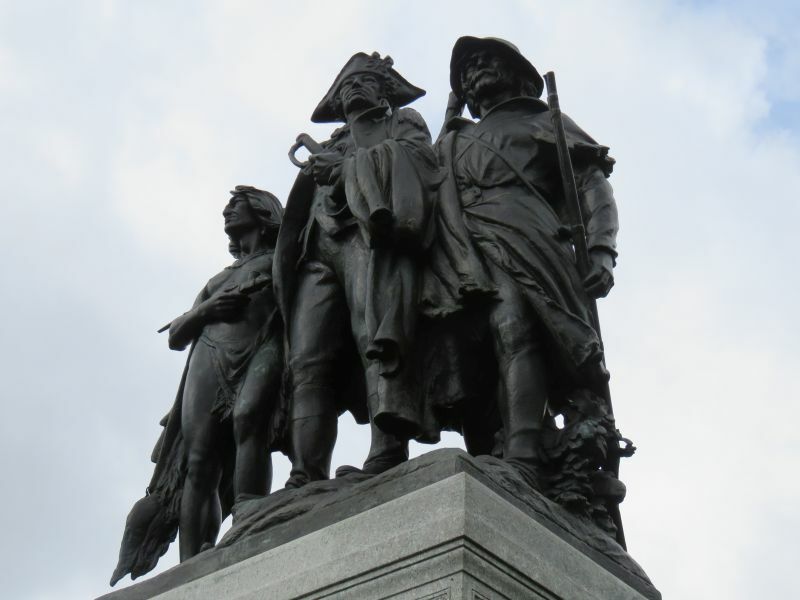 The statue shows General Wayne with a frontiersman and a Native American. 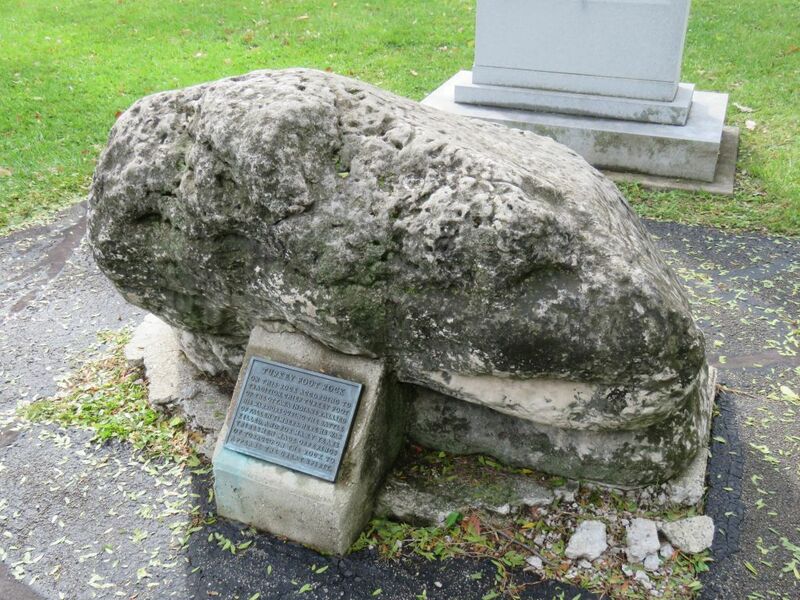 Turkey Foot Rock was the location where Me-sa-sa, an Ottawa Indian chief, died during the Battle of Fallen Timbers. Me-sa-sa was one of the principal leaders of the Indians at the Battle of Fallen Timbers on August 20, 1794. General Anthony Wayne and his Army of the Northwest marched against Indian forces in northwestern Ohio along the Maumee River. The Indians prepared to attack him in an area known as Fallen Timbers. It was a place where a tornado had knocked down many trees, and the natives intended to use the fallen trees for protection. 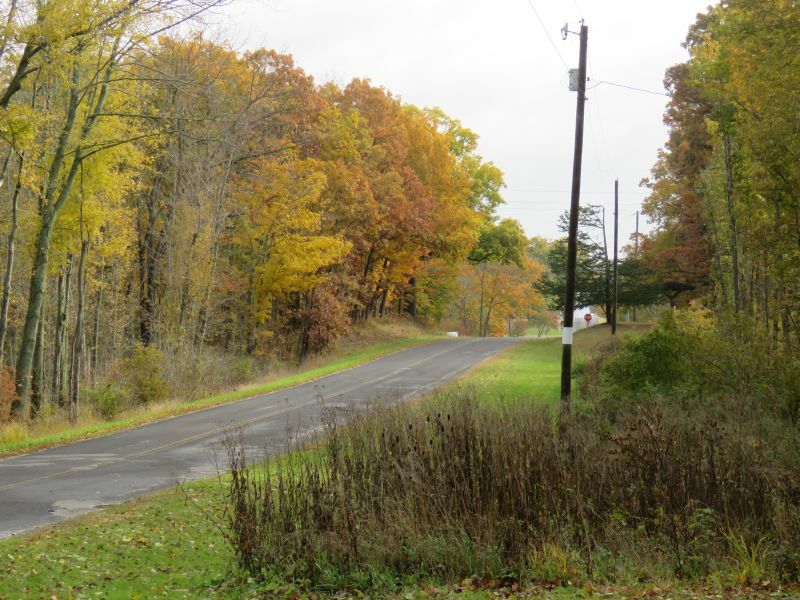 Although the Indians used the fallen trees for cover, Wayne’s men quickly drove the Indians from the battlefield. 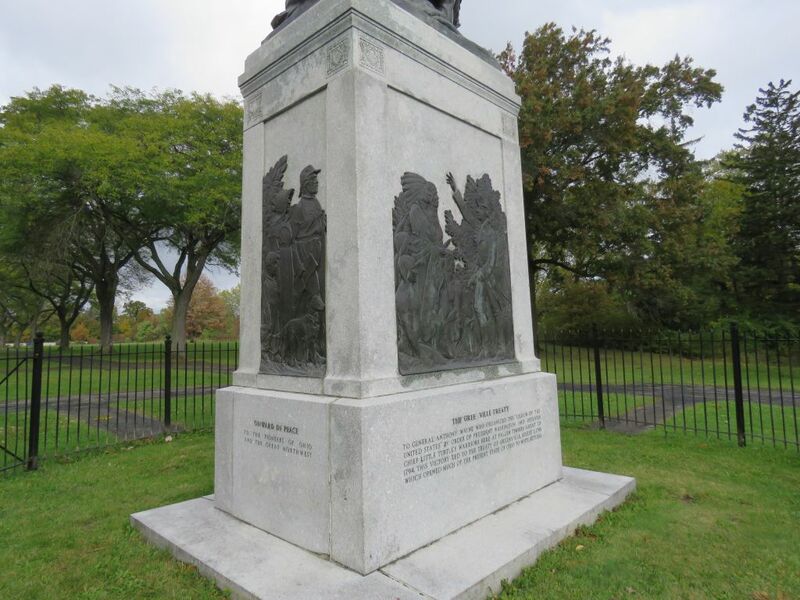 As the Indians were retreating, legend has it that Chief Me-sa-sa jumped on top of a boulder at the base of Presque Isle Hill, hoping to rally his forces. 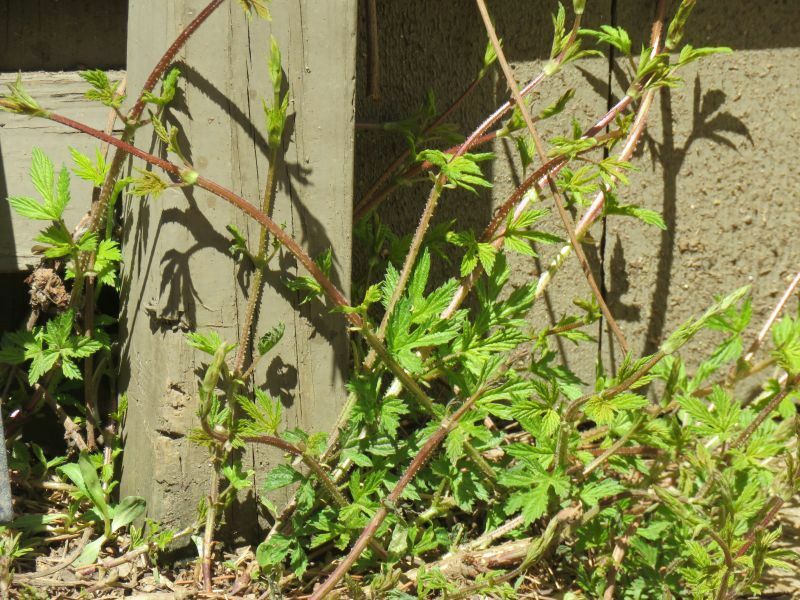 At the time of the battle, the rock was supposedly more than five feet in length and at least three feet high. According to surviving accounts, Me-sa-sa was immediately shot and died next to the boulder. His attempts to rally the Indians failed. The white Americans had thirty-three men killed and roughly one hundred wounded, while the Indians lost approximately twice that number. 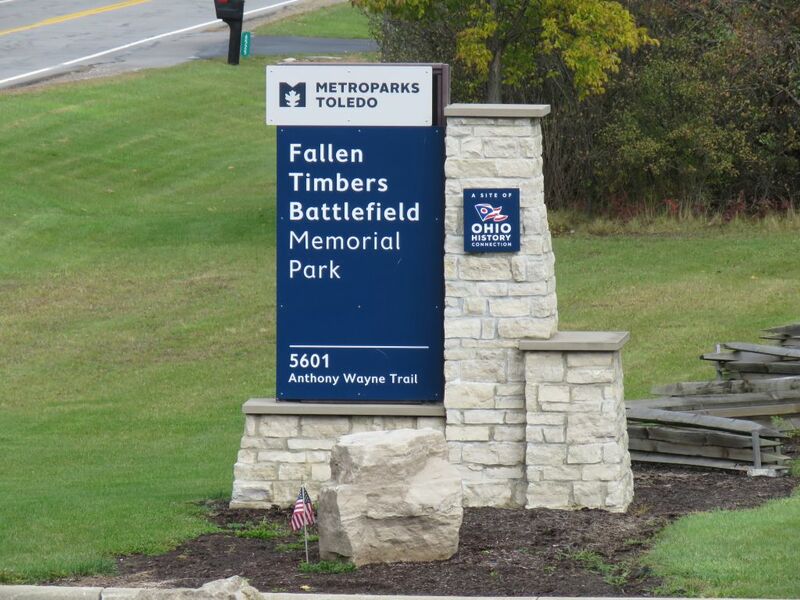 The fight became known as the Battle of Fallen Timbers. Following the battle, the boulder where Me-sa-sa was shot become a shrine in his memory. Locals routinely found offerings, such as beef, corn, and trinkets, on the boulder. Indians had left these offerings to honor their deceased chief. The boulder became known as Turkey Foot Rock. It remains unclear why the rock was named Turkey Foot Rock. One possible explanation is that whites called Me-sa-sa Turkey Foot. A second explanation is that the rock had carvings on it in the shape of a turkey’s foot. Some accounts claim that these carvings existed on the rock before Me-sa-sa’s death, while others claim that Indians made these carvings to honor the deceased chief. 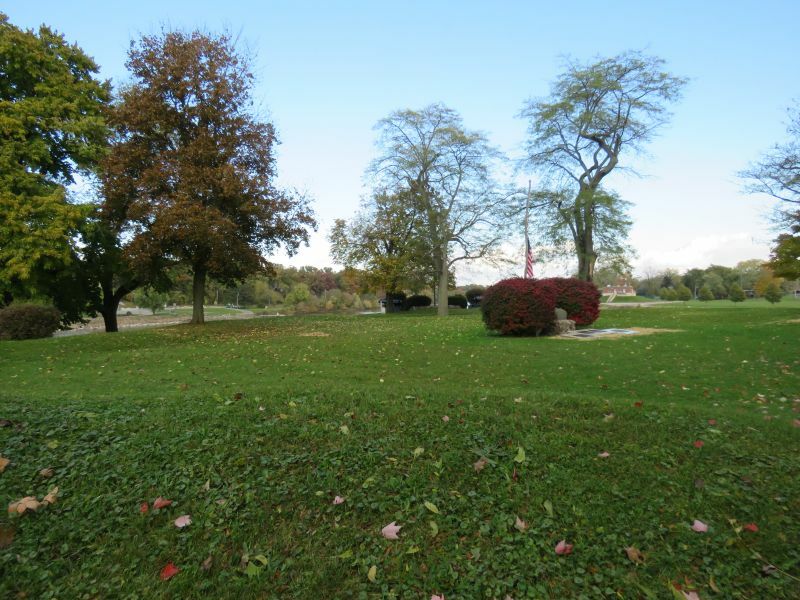 The boulder and some of the carvings is still visible today at the site of the Battle of Fallen Timbers. 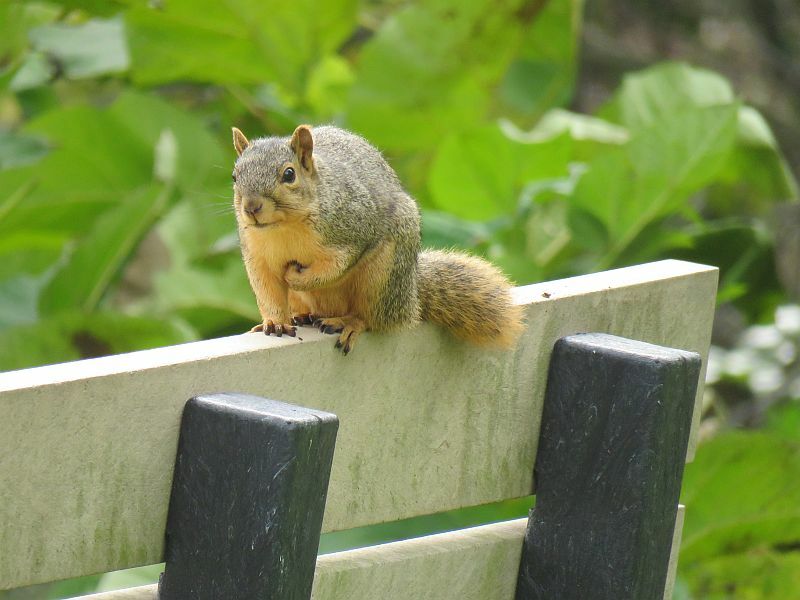 A Fox Squirrel watched me closely from a nearby park bench. 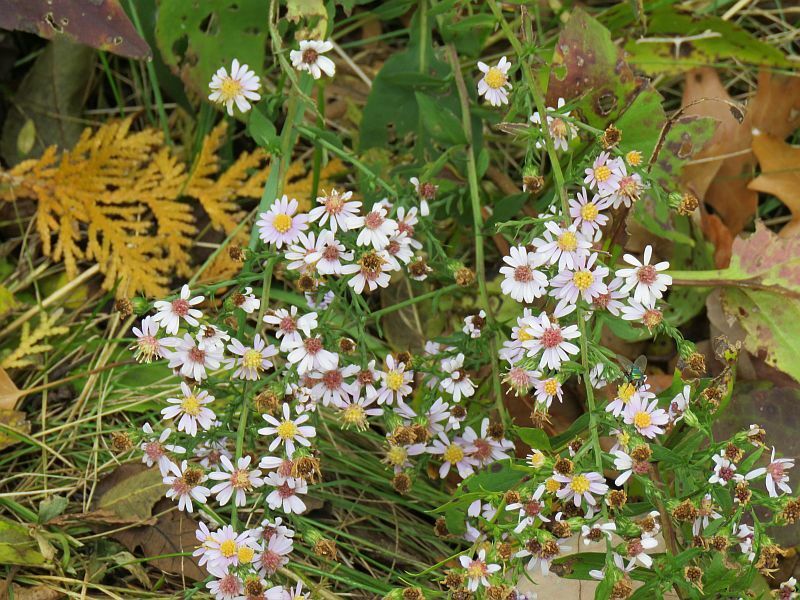 Autumn wildflowers- Calico Asters- were blooming. 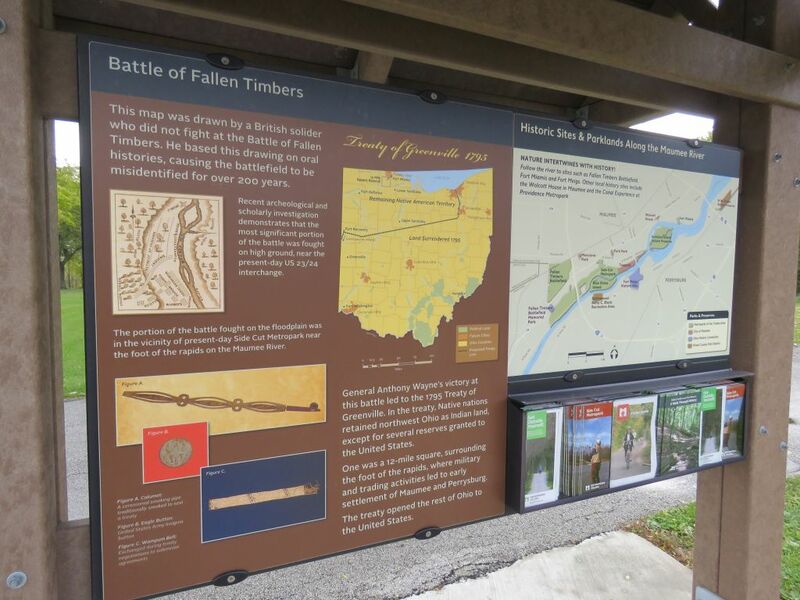 I walked across a pedestrian bridge over a highway just to the north and looked at some of the land that the Battle of Fallen Timbers was actually fought upon. Eventually it was over the river and through the woods back to the cabin. 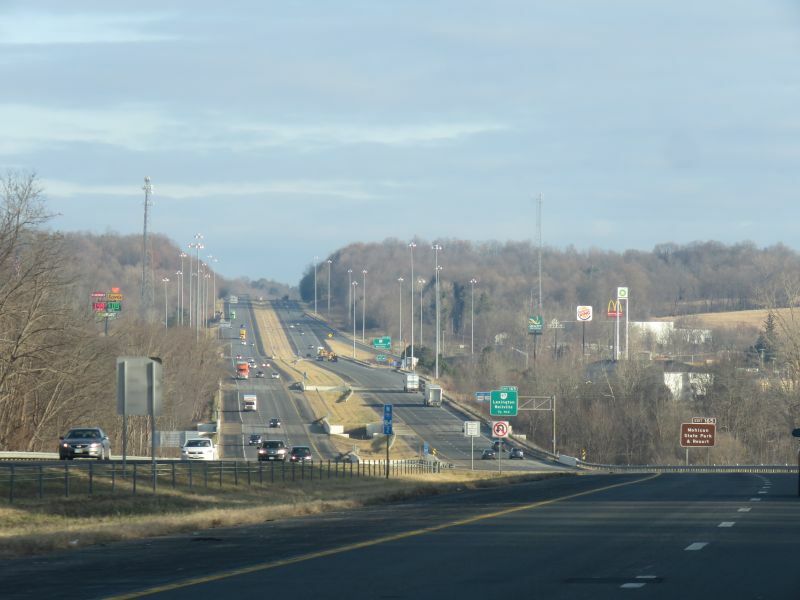 I visited a couple other places that will have to be given their own blog posts eventually. Stay tuned! 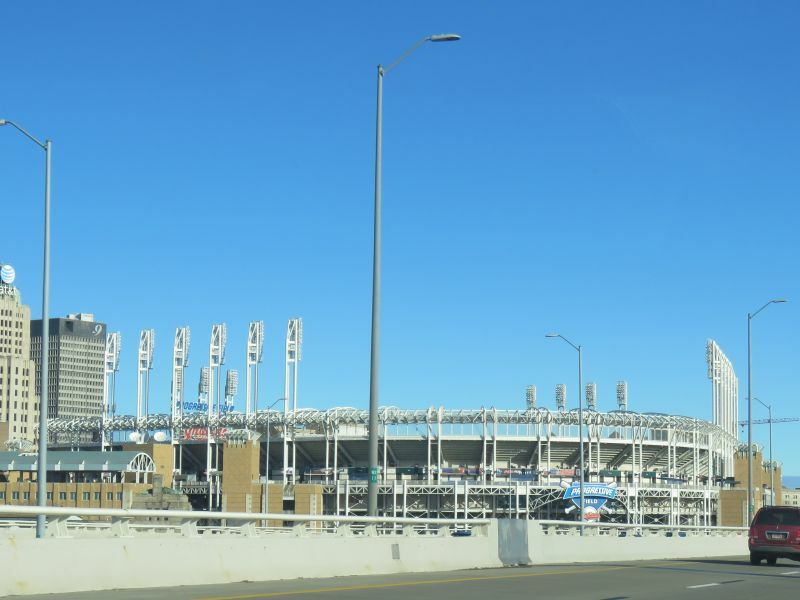 At the beginning of 2019, a friend and I piled into his SUV and went on a road trip one Sunday, from Columbus to Cleveland Ohio. 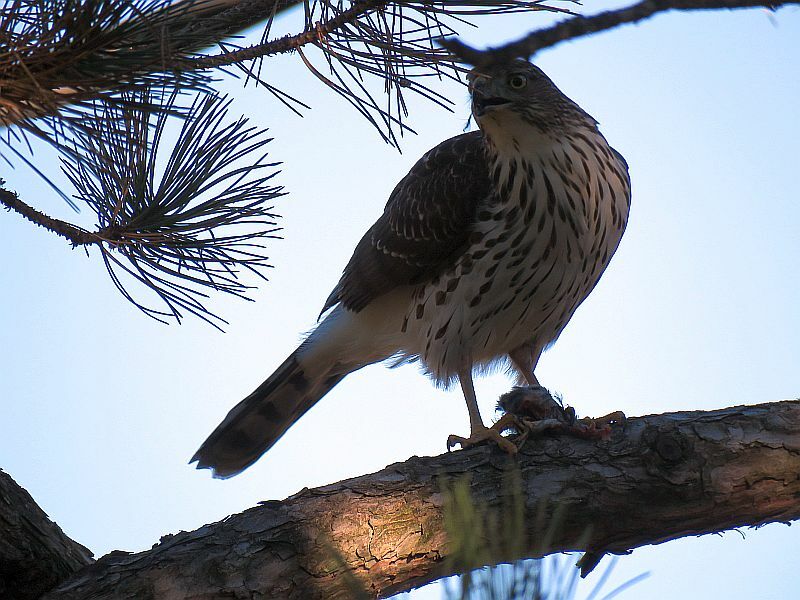 A rare bird had been sighted regularly there, and this life-lister would be worth the 2.5-hour drive. 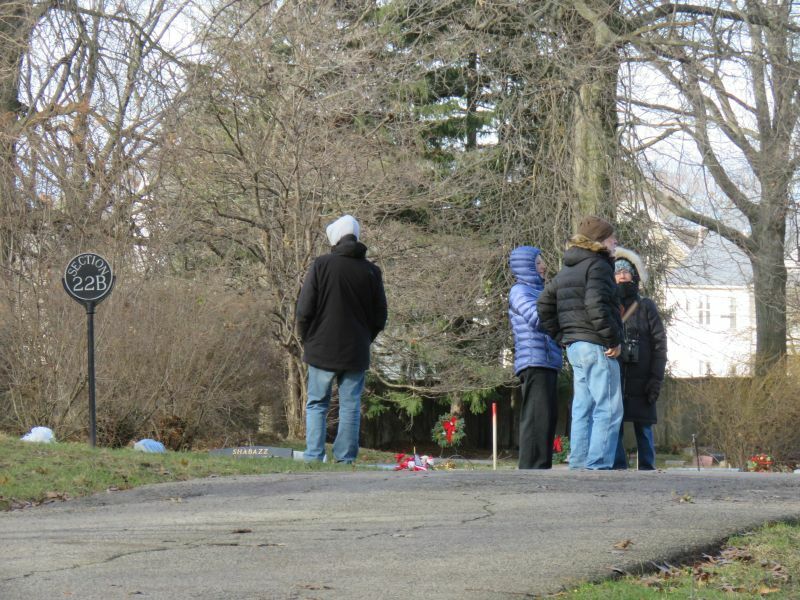 And suddenly we were at our destination- Lake View Cemetery. 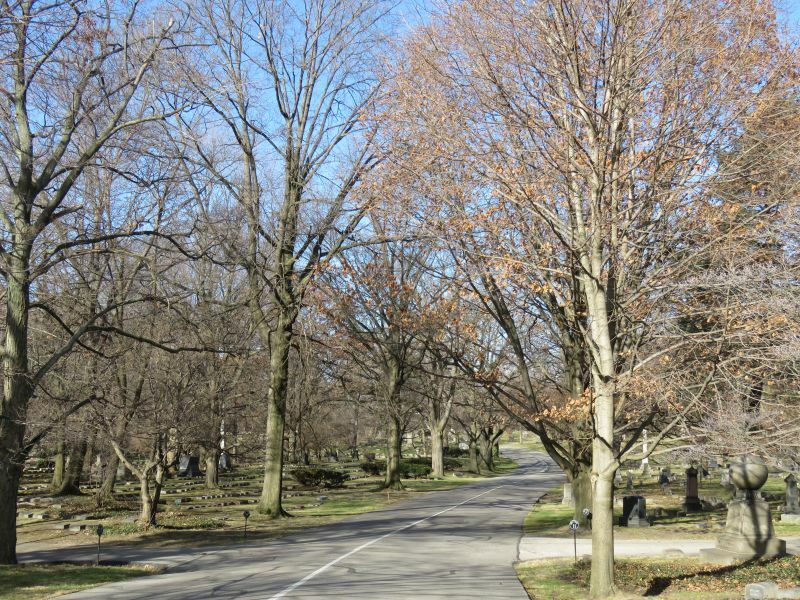 Lake View Cemetery is on the east side of Cleveland, Ohio, along the East Cleveland and Cleveland Heights borders. 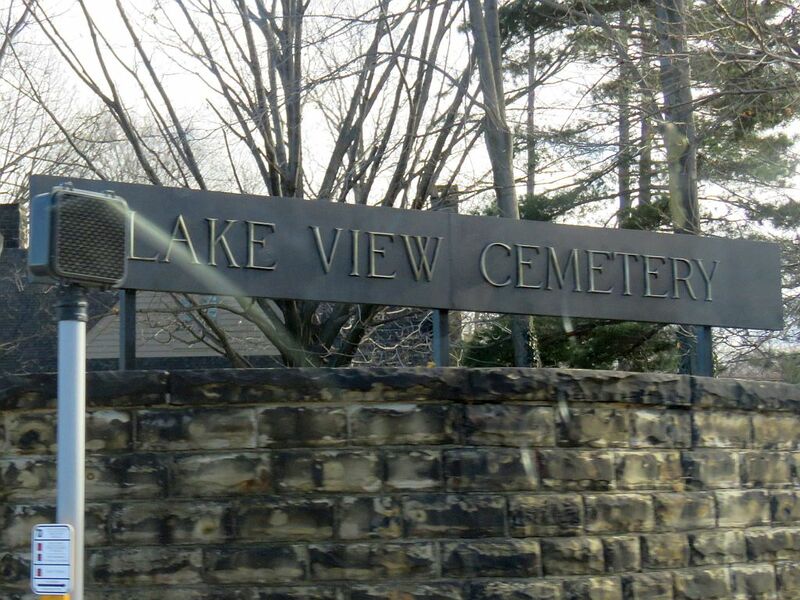 More than 104,000 people are buried at Lake View, with more than 700 burials each year. 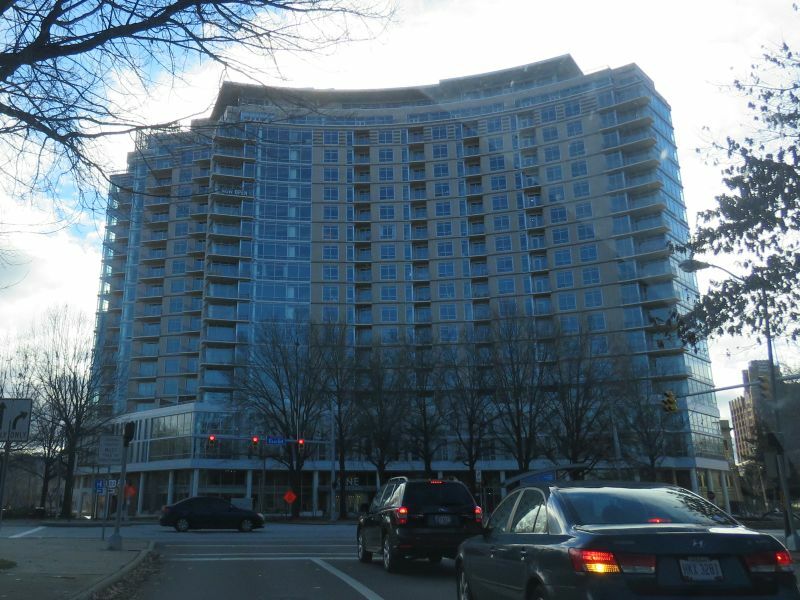 There are 70 acres remaining for future development. 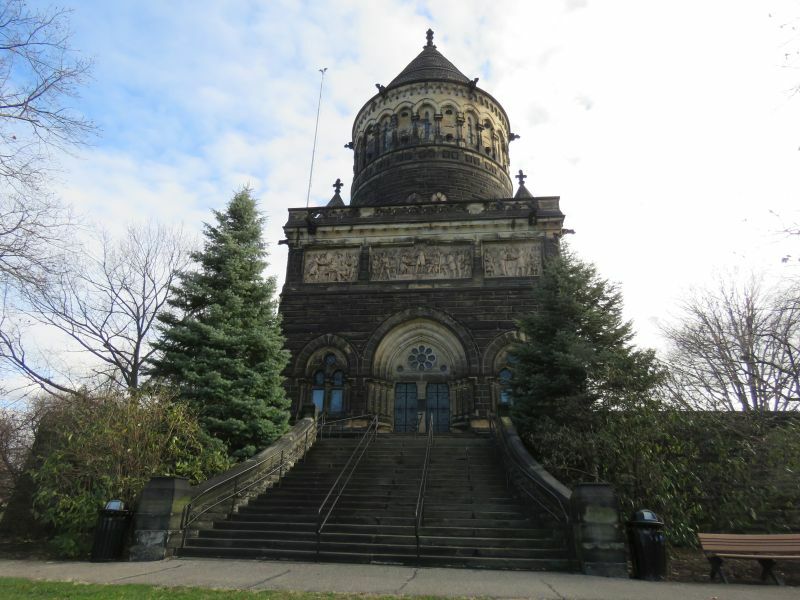 Known locally as “Cleveland’s Outdoor Museum,” Lake View Cemetery is home to the James A. Garfield Memorial, Wade Memorial Chapel, which features an interior designed by Louis Tiffany, as well as an 80,000,000-US-gallon capacity concrete-filled dam. 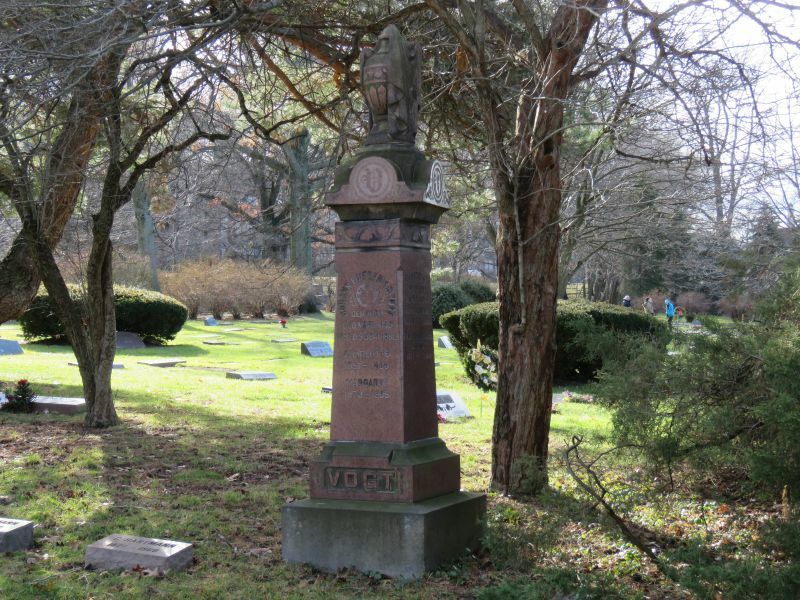 Lake View Cemetery was founded in 1869 and sits on 285 acres of land. 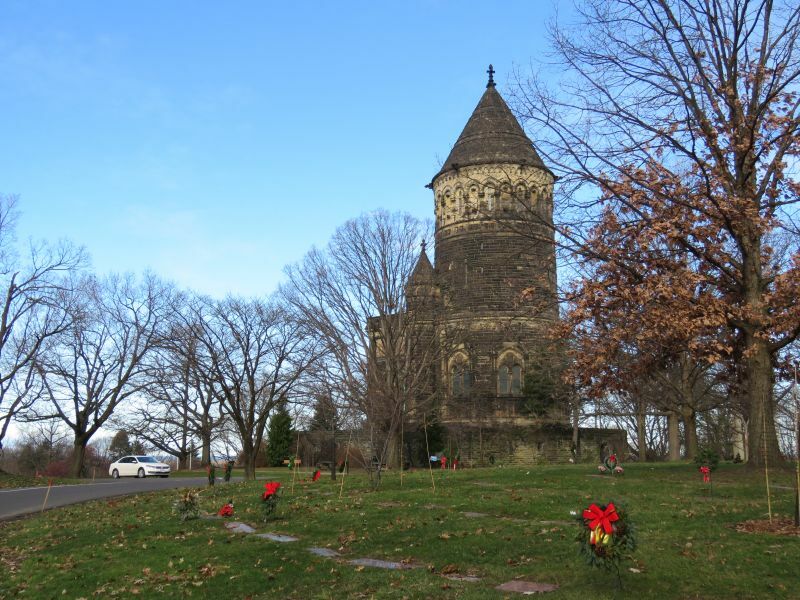 The cemetery is so named because it is partially located in the “heights” area of Greater Cleveland, with a view of Lake Erie to the north. 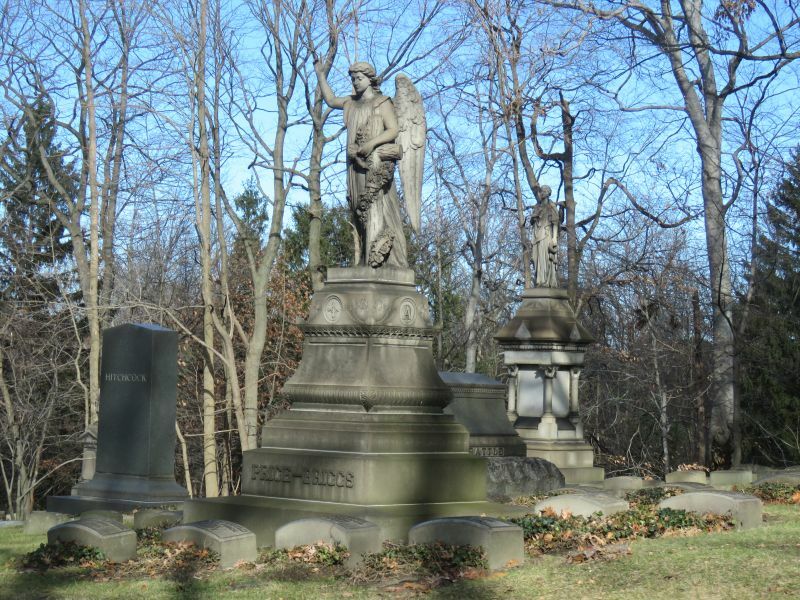 It was modeled after the great garden cemeteries of Victorian-era England and France. 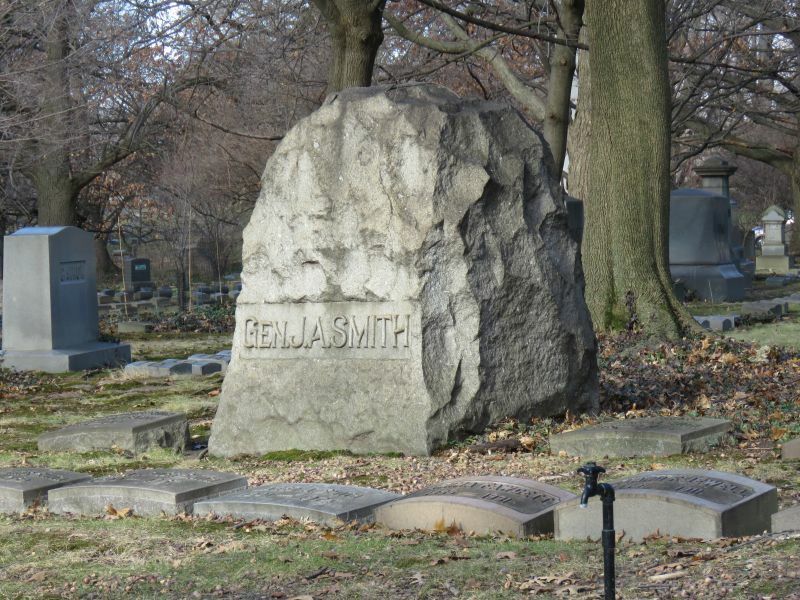 The Italian stonemasons brought in to create the Cemetery founded the Cleveland neighborhood of Little Italy just to its southwest. 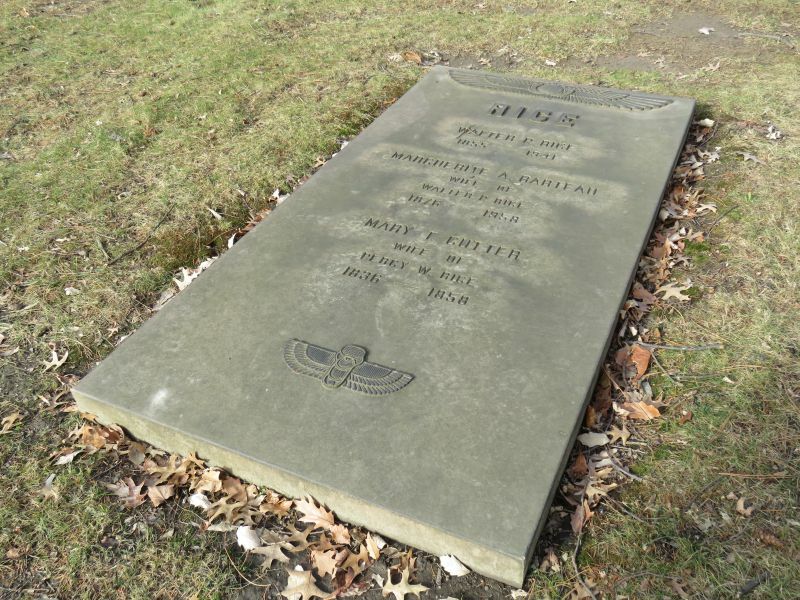 One thing I noticed was a fair amount of Egyptian symbols upon century-old gravestones. Back in the 1920s, Howard Carter had sparked an Egyptian antiquity craze by discovering King Tutankhamen’s tomb. The interest was plain to see. Cemetery symbolism is a fascinating subject. Take, for example, the draped urn. The widely used draped urn is one of the many symbols that humans have used to represent their views towards death and the immortal spirit. 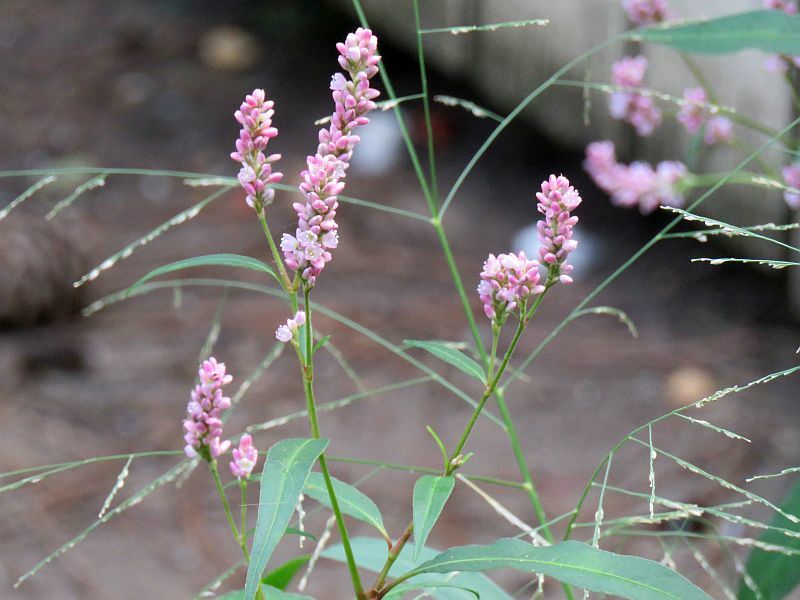 The urn itself represents a classical funeral urn used for cremains. 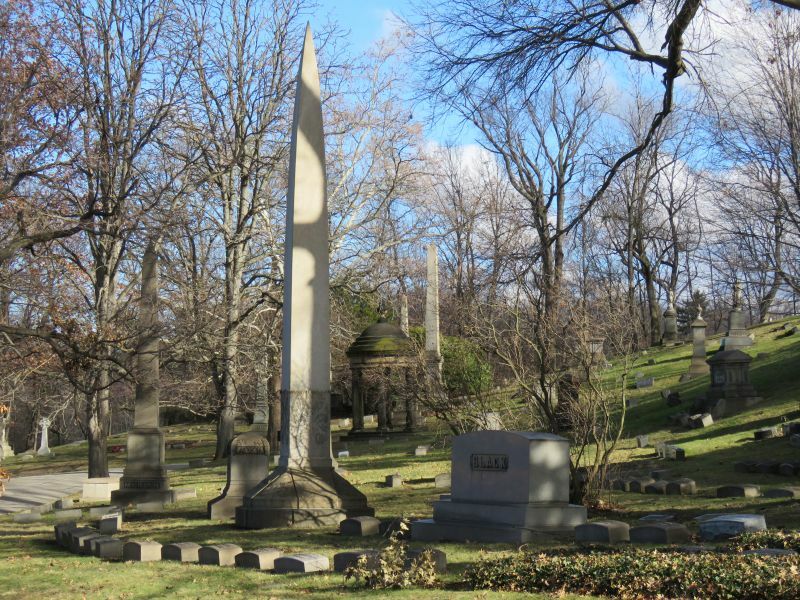 A revived interest in classical Greece led to the prevalence of the draped in urn in cemetery symbolism, even though cremation was not terribly popular at this time ( mid to late 1800s). The urn was also thought to stand for the fact that we all return to ash, or dust; the state from which God created us. The meaning of the drape on the urn can mean many things to many people. 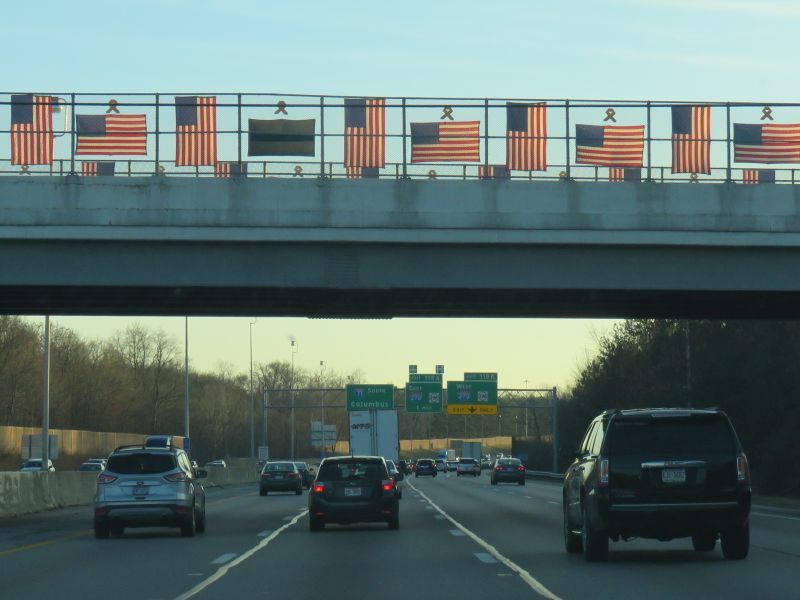 Some feel that it symbolizes the final, impenetrable veil between the living and the dead that awaits us all. 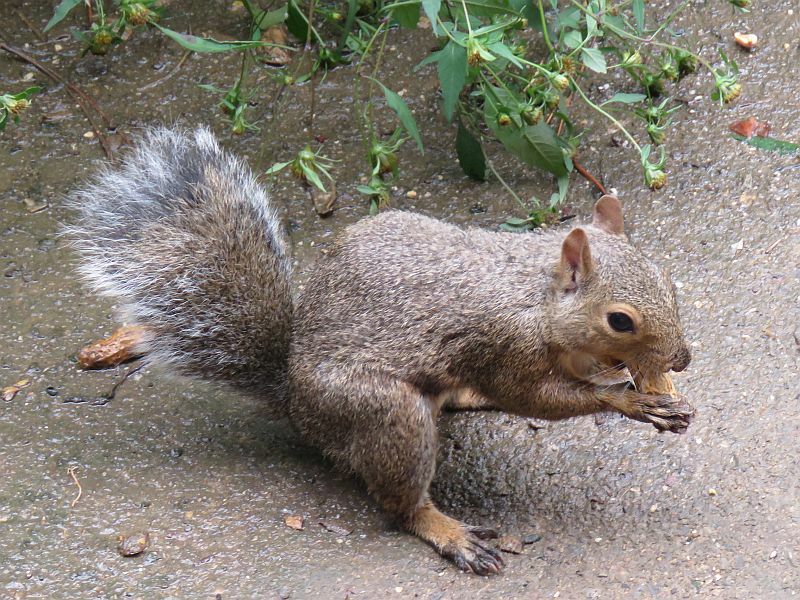 To others, it symbolizes the human shedding their mortal body and trappings to join God in Heaven. The drape can also stand for the protective nature of God over the dead and their remains, until the Resurrection occurs. 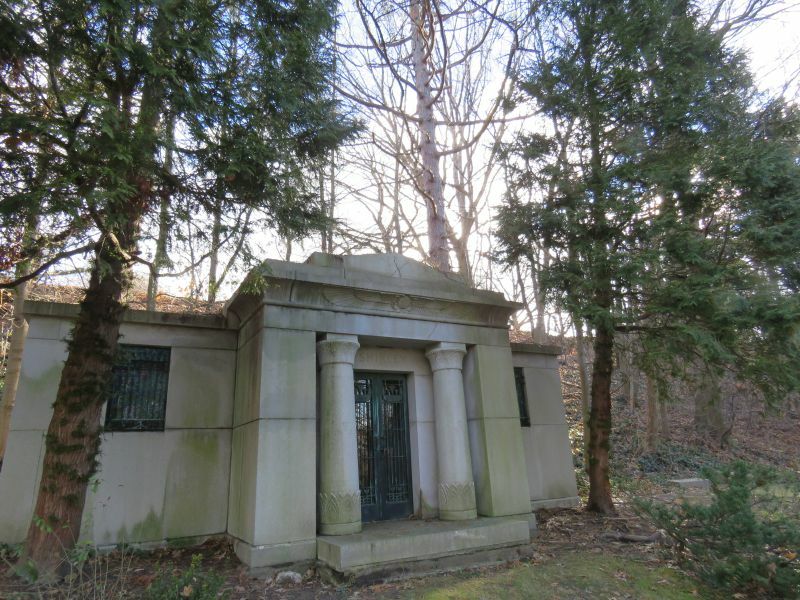 Mausoleums dotted the cemetery. 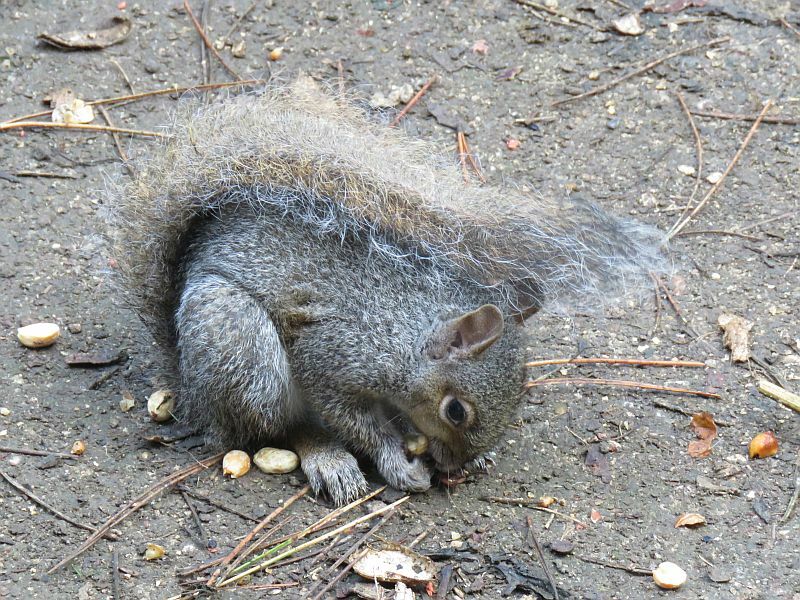 This particular one was near where the bird we were seeking slept at night. 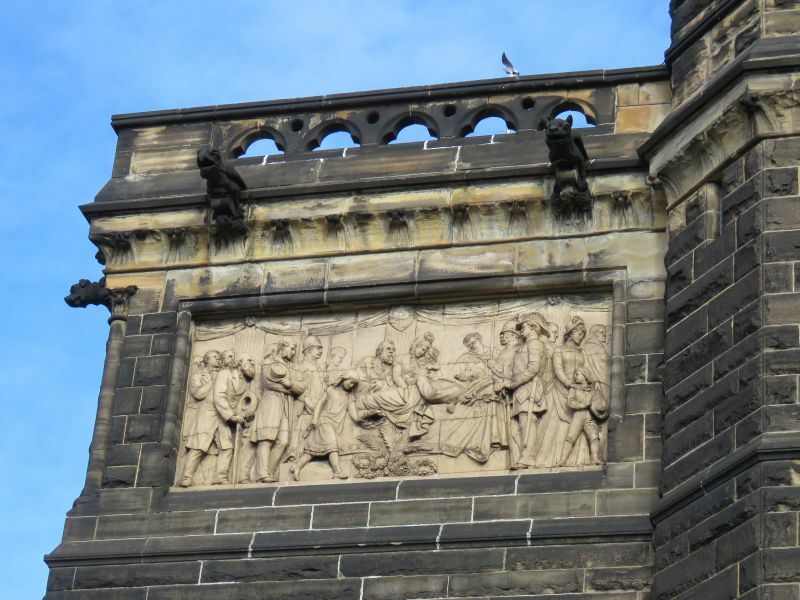 The most spectacular sight in the cemetery was the James A. Garfield Monument. 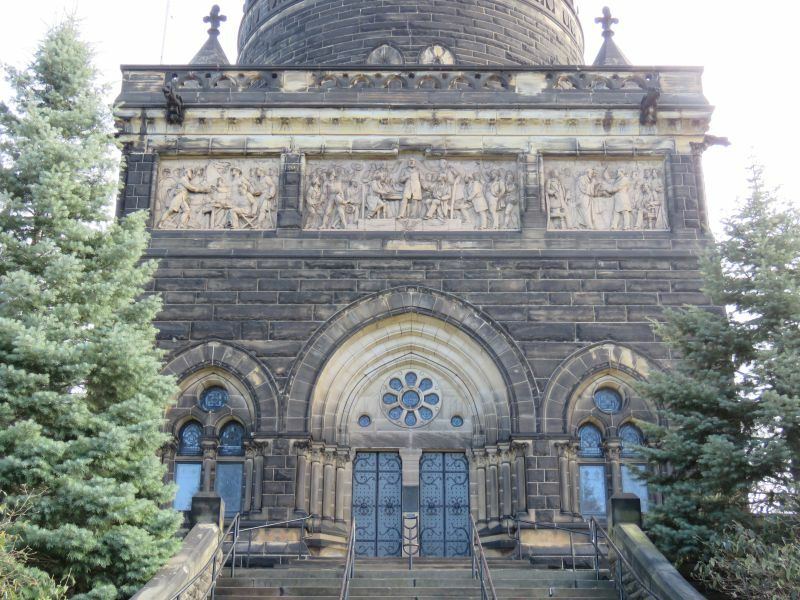 Listed on the National Register of Historic Places, the James A. Garfield Monument is the final resting place of the 20th President of the United States. 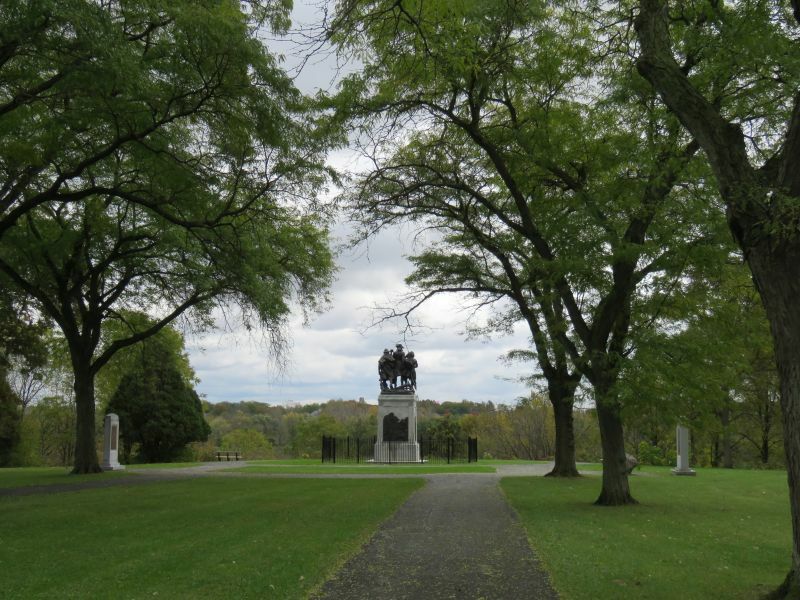 The monument is open daily, April 1 through November 19, from 9:00 a.m. until 4:00 p.m. The building combines Romanesque, Gothic and Byzantine styles of architecture. Our staff will discuss the President’s life, and the beauty and history of the building. Items- from post cards, posters, puzzles and books- are for sale in our gift shop. The architecture was truly a visual feast. This scene is apparently Garfield on his death bed after being struck down by his assassin. Unfortunately, it was winter, and the interior was closed for the season. 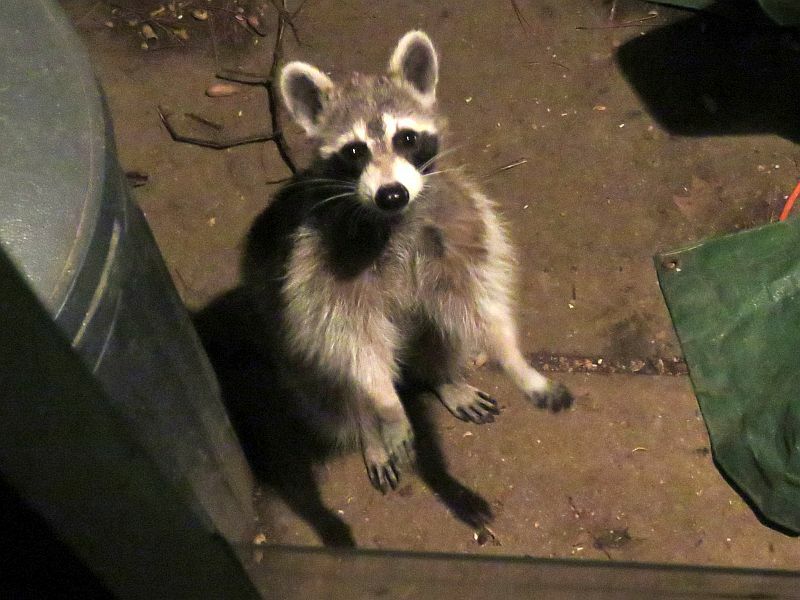 I very much would like to return and see the inside. 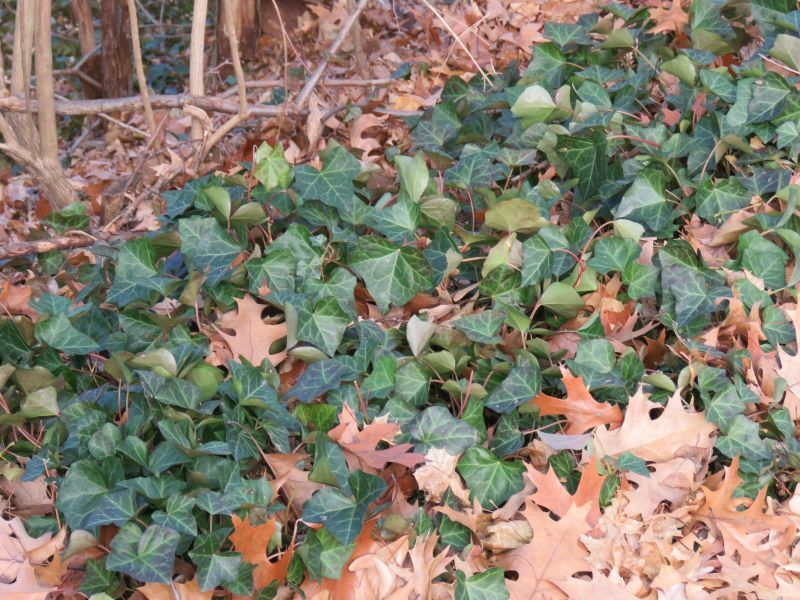 English Ivy is not an uncommon vine found in cemeteries. 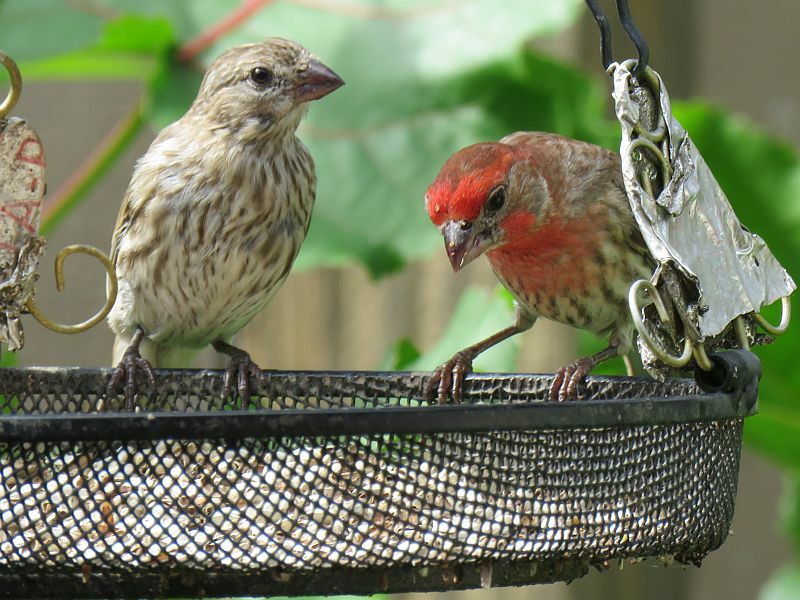 Birding tip- always look for other birders to see if they see anything. 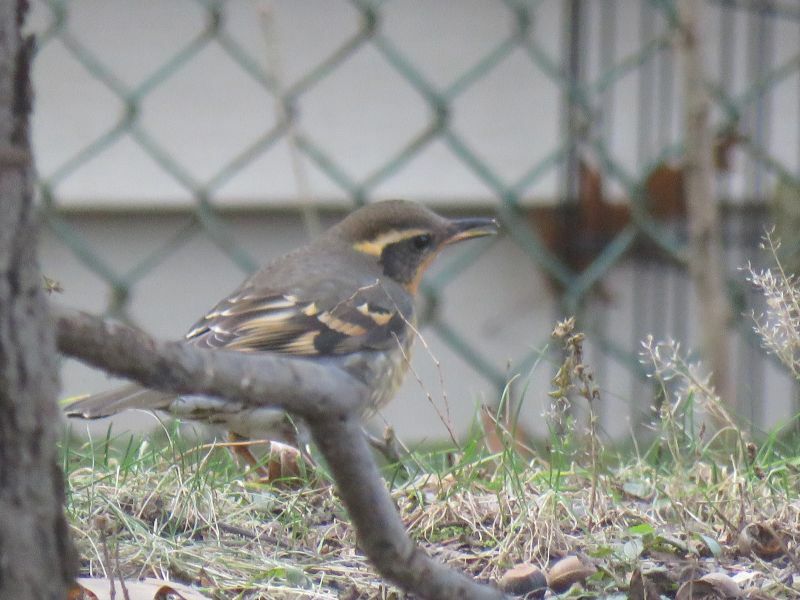 Sure enough, it was a Varied Thrush, a bird usually seen on the West Coast! 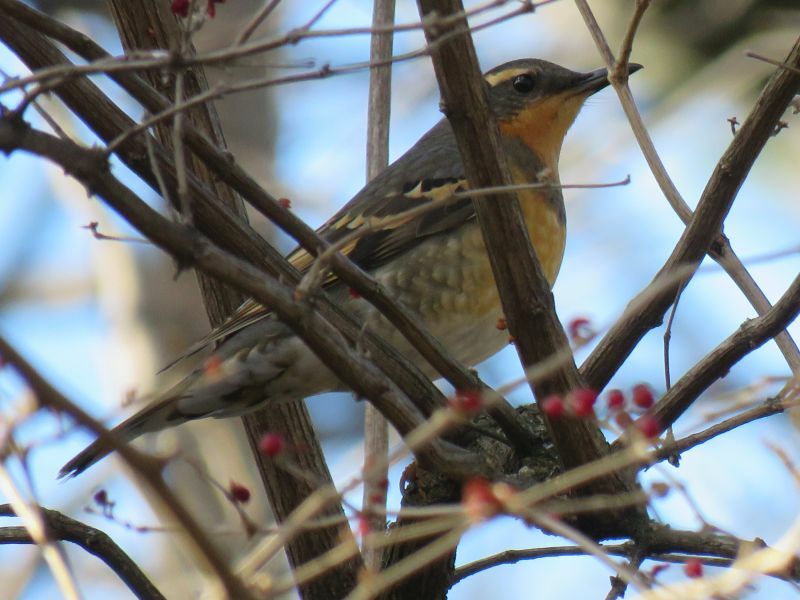 The Varied Thrush lives in dark, wet, mature forests in the Pacific Northwest. 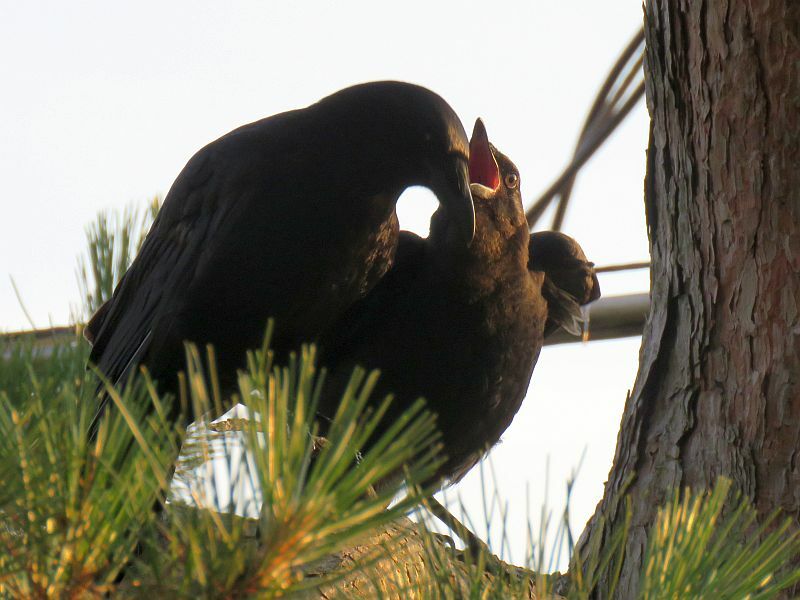 In its breeding range, which covers Alaska and tapers as it extends south to northern California, it inhabits forests dominated by coastal redwood, Sitka spruce, red alder forests, western hemlock, western red cedar, western larch, or Douglas-fir. 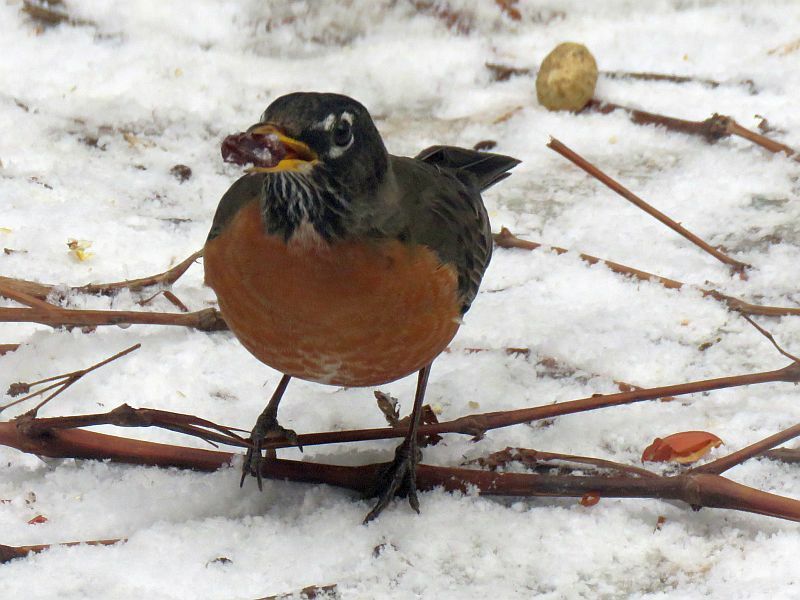 In winter it may be found in a broader range of habitats, including parks, gardens, lakeshores, and riparian areas where fruit and berries are abundant. 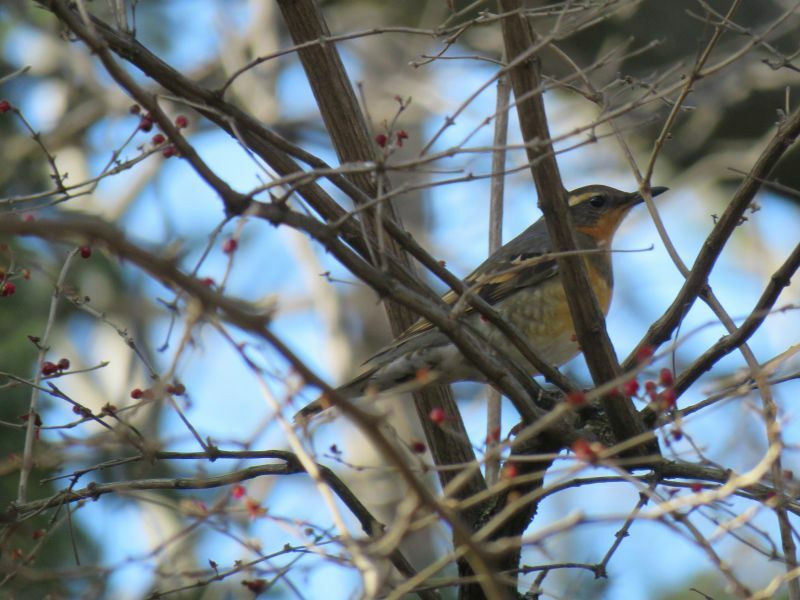 During breeding season, Varied Thrushes eat insects and other arthropods from the leaf litter; in winter they eat mostly berries and nuts. 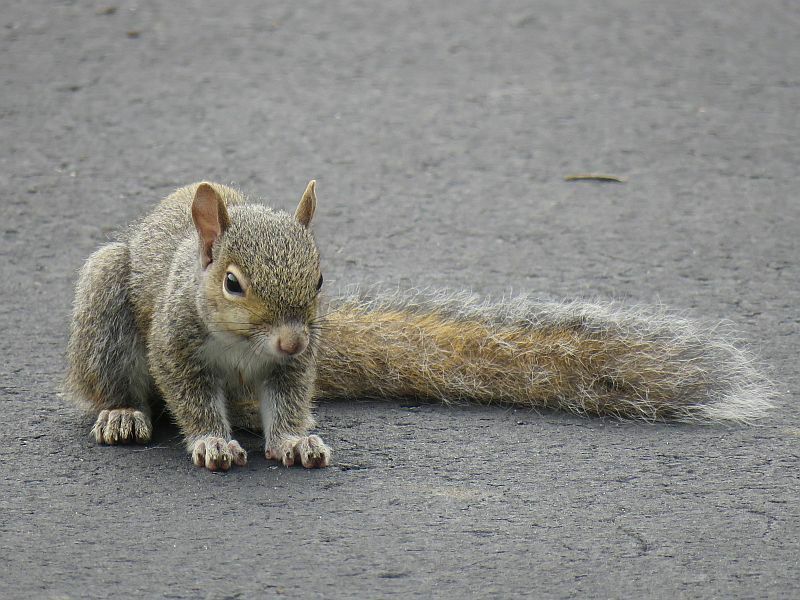 They forage by seizing dead leaves in their bill and hopping backward to clear a spot of ground before examining it for prey. 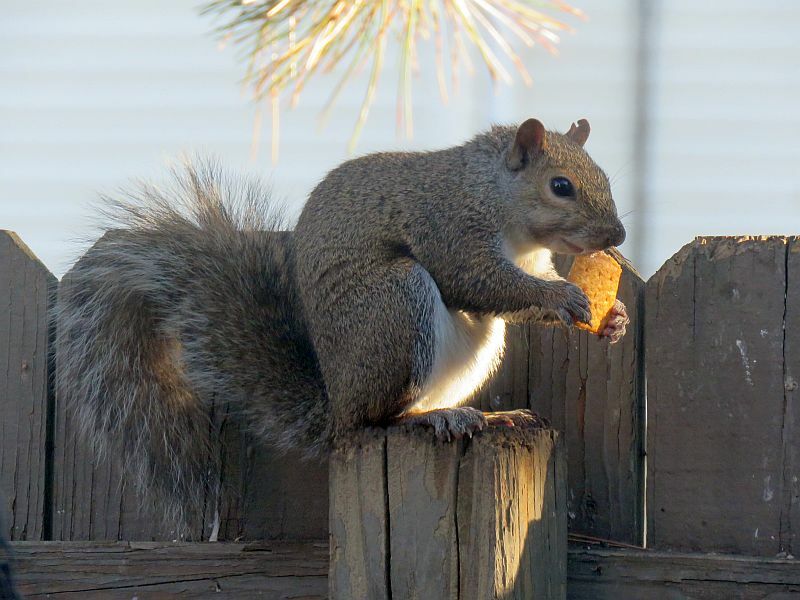 In fall and winter, they switch to fruits and acorns, forming loose flocks around their food. 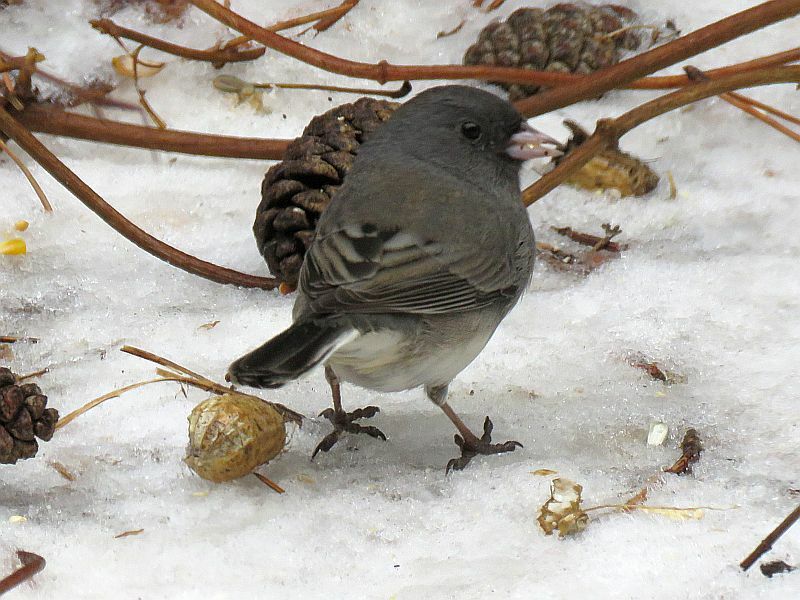 Some of their typical fruits are snowberry, apple, honeysuckle, madrone, mistletoe, manzanita, toyon, ash, salal, cascara, dogwood, blueberry, huckleberry, salmonberry, and thimbleberry. 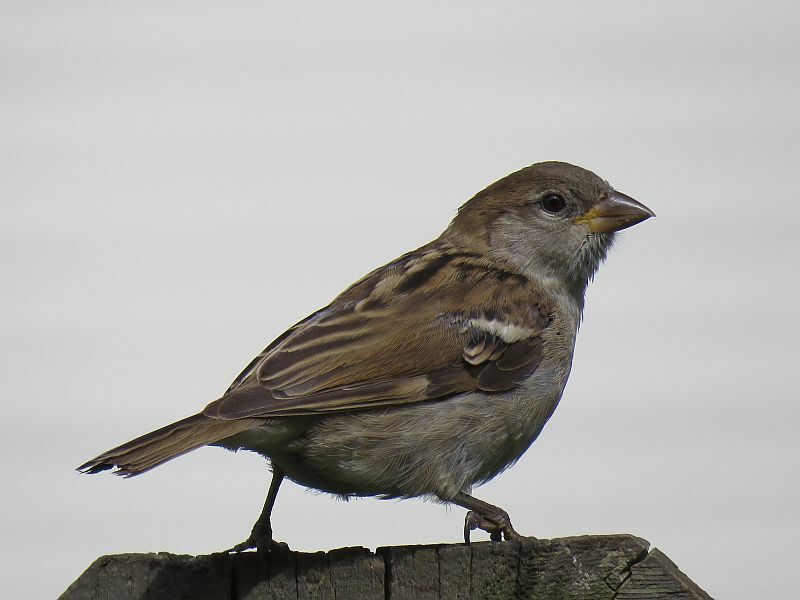 It is well known for individual birds to fly eastward in winter, showing up in just about any state, then returning to the west coast for breeding…This species is an improbable transatlantic vagrant, but there is an accepted western European record in Great Britain in 1982. 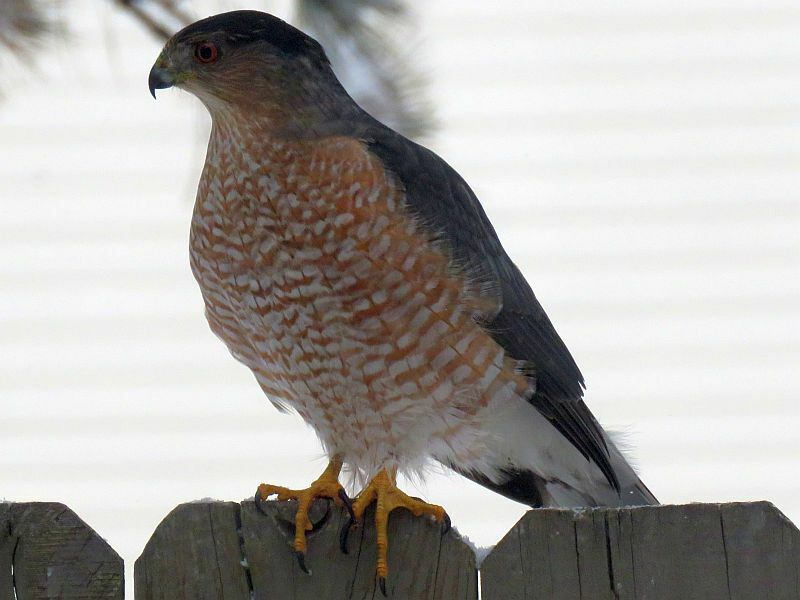 It was wonderful to see such a bird so far from home- may she get back safely! 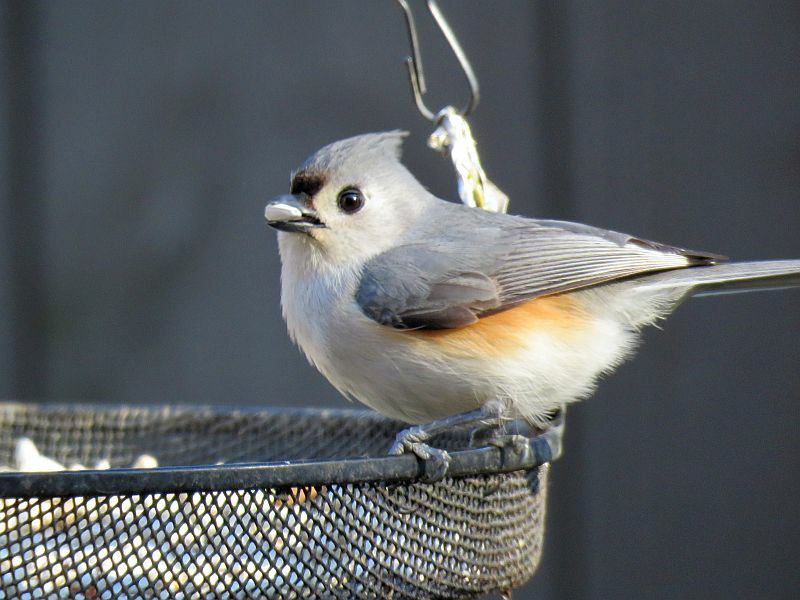 It’s time for the 4th annual bird photo highlights, 2018 edition! 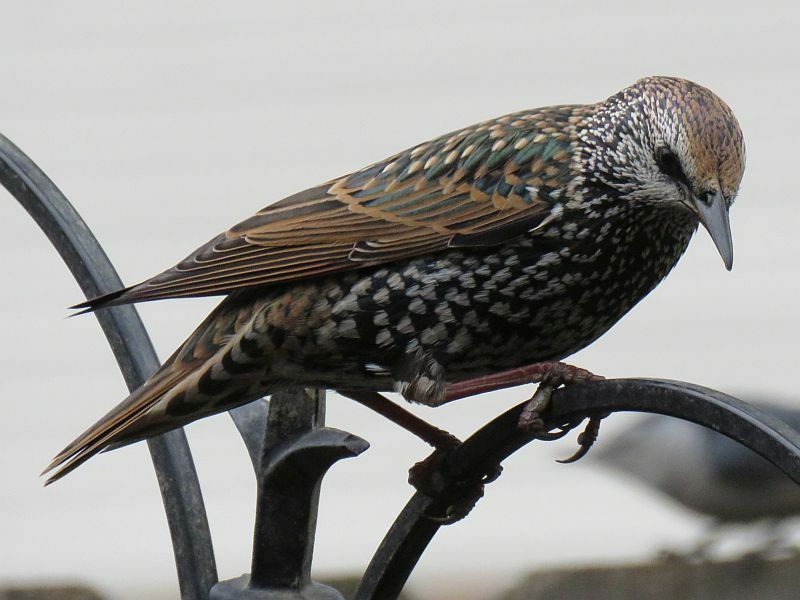 Here’s bird highlights from 2015 , 2016 and 2017 if you’d like to take a look. 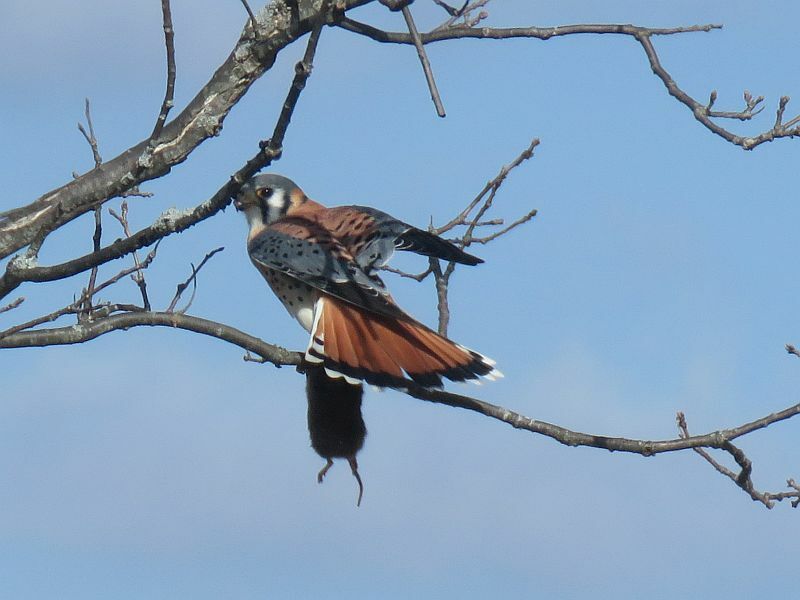 This American Kestrel (Sparrowhawk) has caught a chunky rodent- it took off as soon as it saw me, carrying its meal elsewhere. 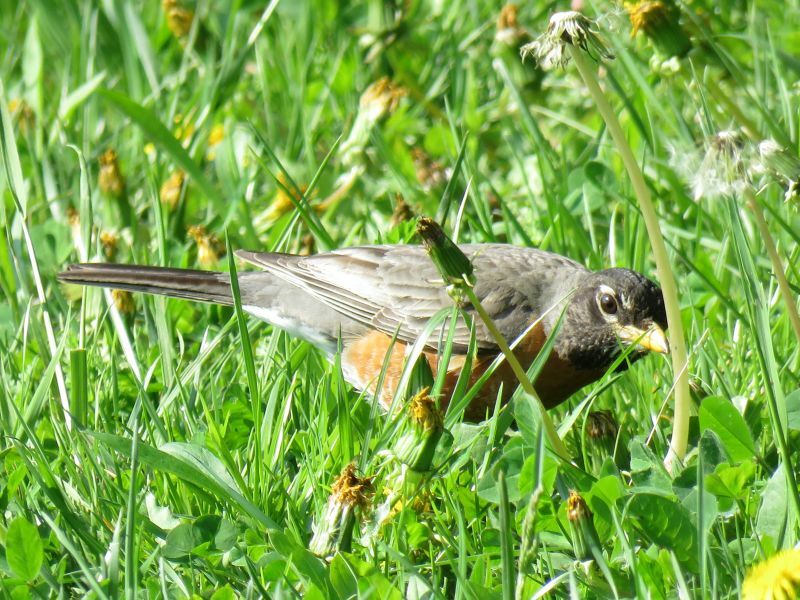 As in most of my photographs, I can remember where I took it- at the entrance of Glacier Ridge Metro Park. 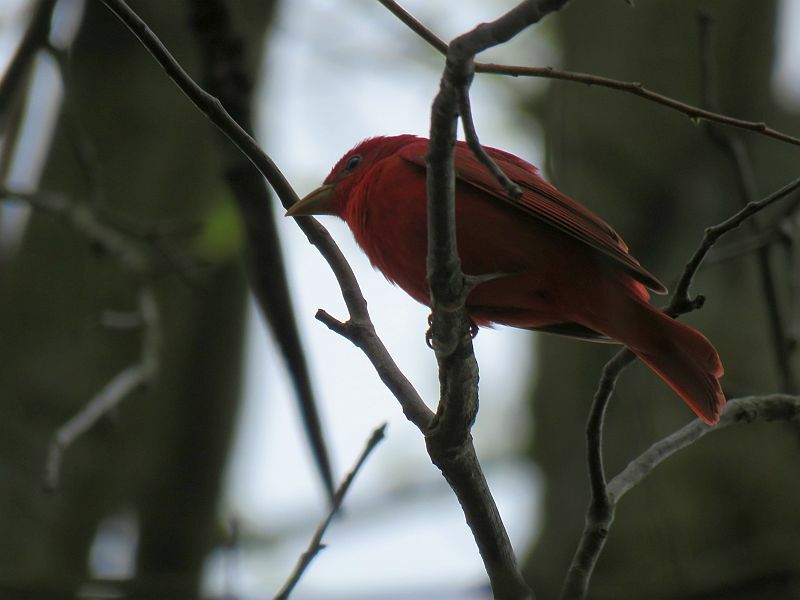 This male Summer Tanager was right above me at Blendon Woods Metro Park- I think this is the only decent shot of this species I got all year. 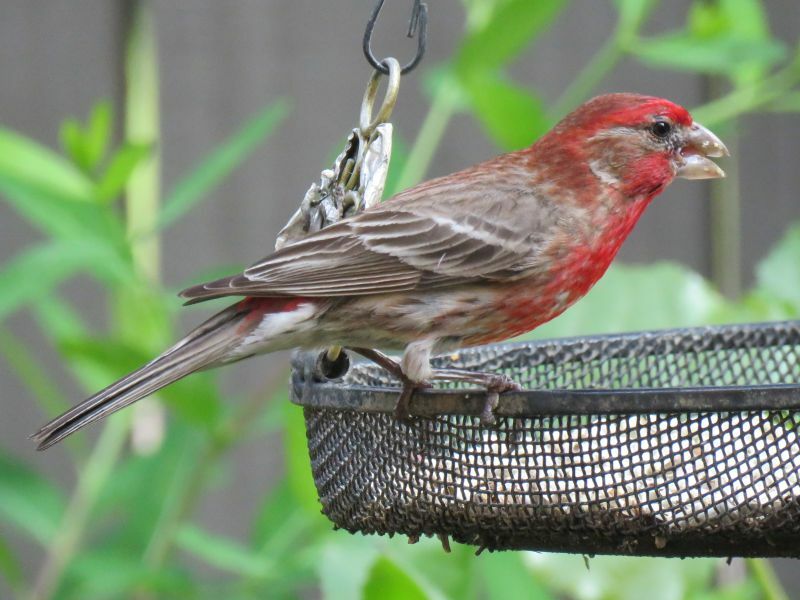 They are lovely birds, completely red with a good-sized yellow beak. 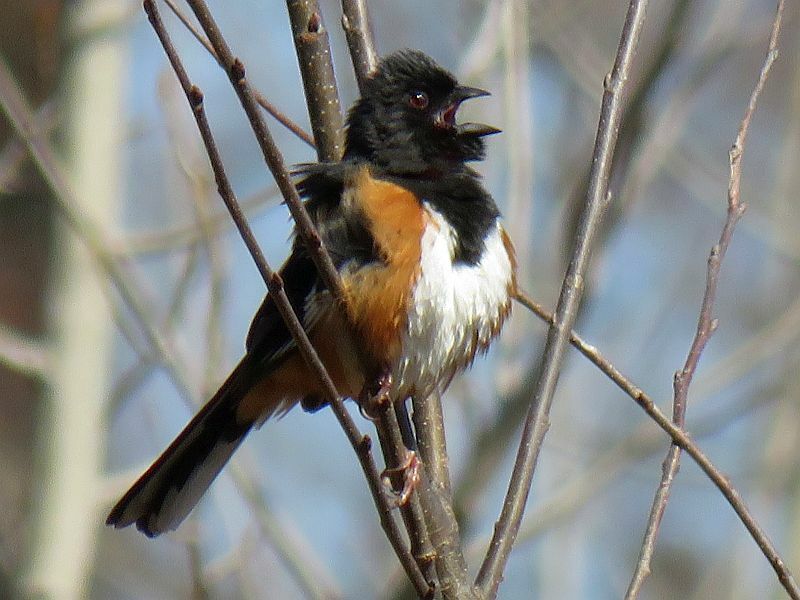 This male Eastern Towhee was really belting out his song in the early spring. 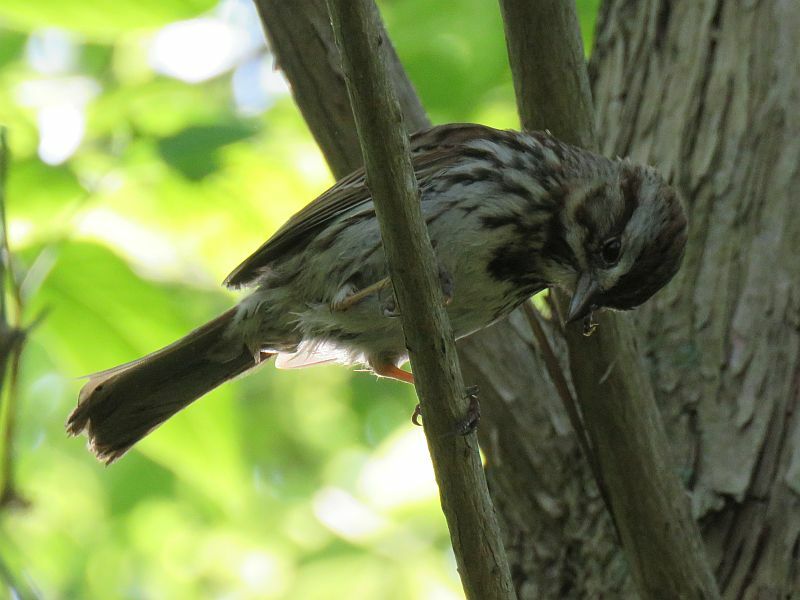 This is probably the best photo I’ve ever taken of a migrating Fox Sparrow, last April at Sharon Woods Metro Park. 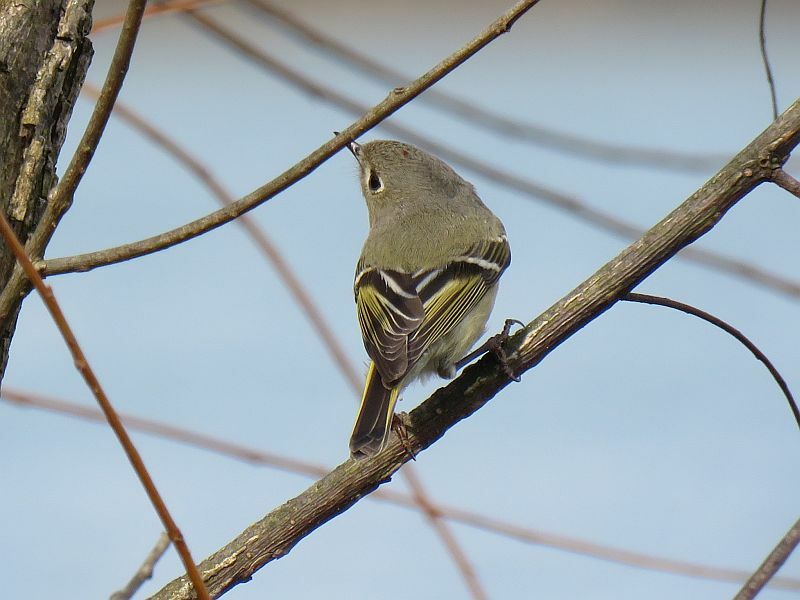 If you look closely at this little Ruby-Crowned Kinglet, you’ll see a tiny red spot on the crown of its head. 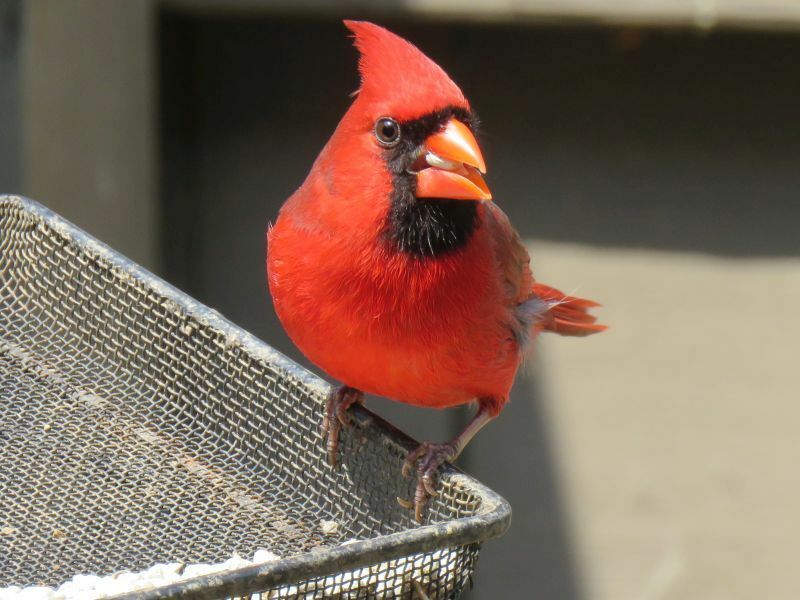 When they get agitated, they flash their red crown when they raise their feathers on their head. 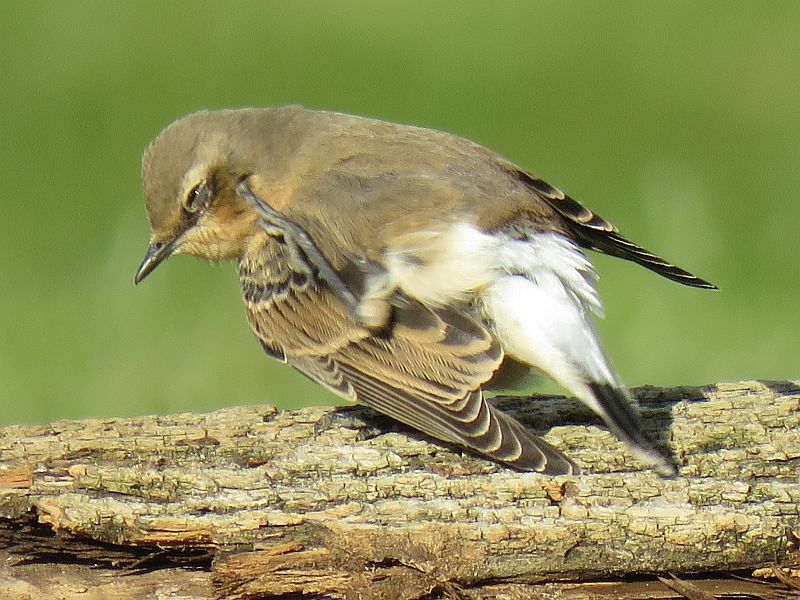 I had a heck of a time getting a decent shot of this swiftly-moving bird at Prairie Oaks Metro Park last spring. 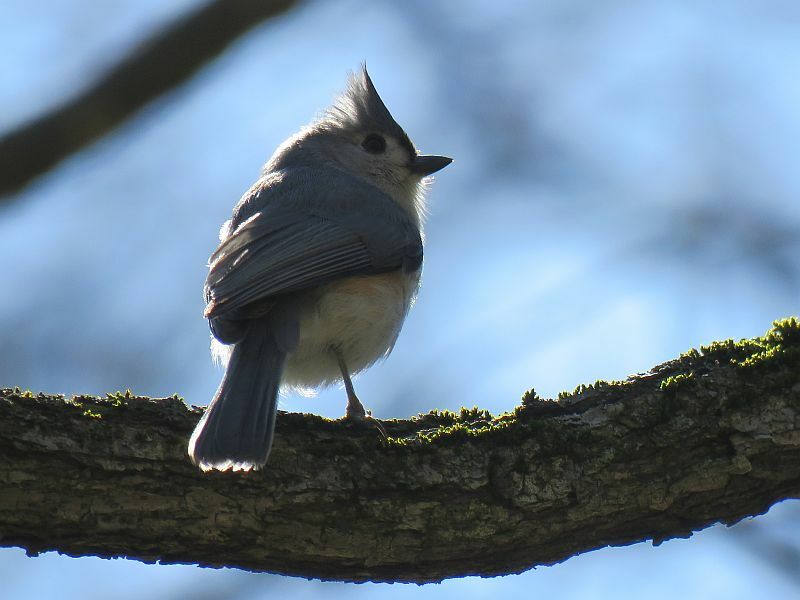 Speaking of smaller fast-moving birds…this Tufted Titmouse is also in that category. I get a lot of blurry bad shots of them. 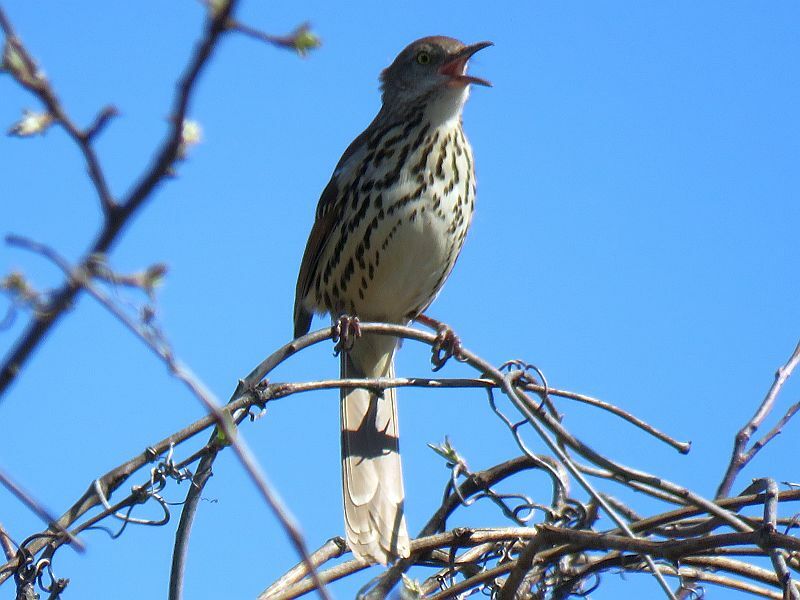 This Brown Thrasher was one of a few at Sharon Woods last spring singing its heart out, claiming territory in a large brushy field. 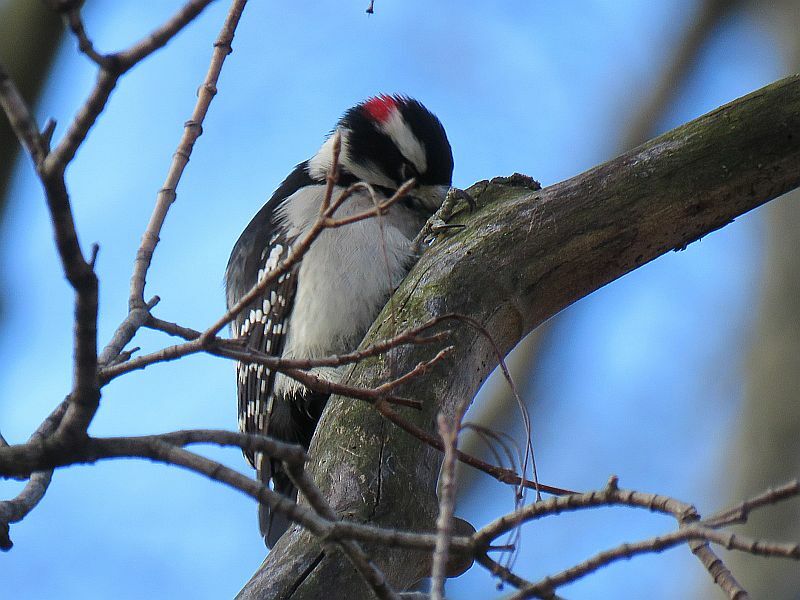 This male Downy Woodpecker posed nicely for me- he may have been courting a female at Kiwanis Park. 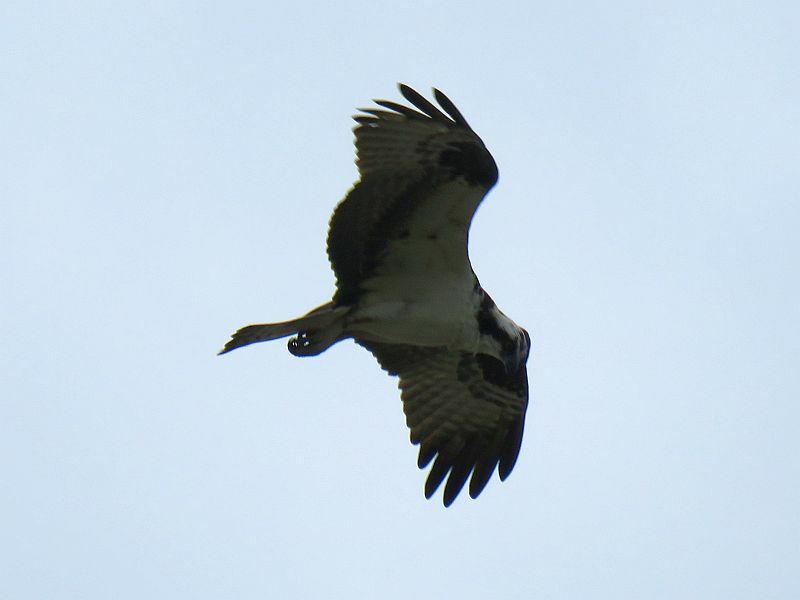 An Osprey (also known as a Fish Hawk) looking for prey above me at Alum Creek State Park. 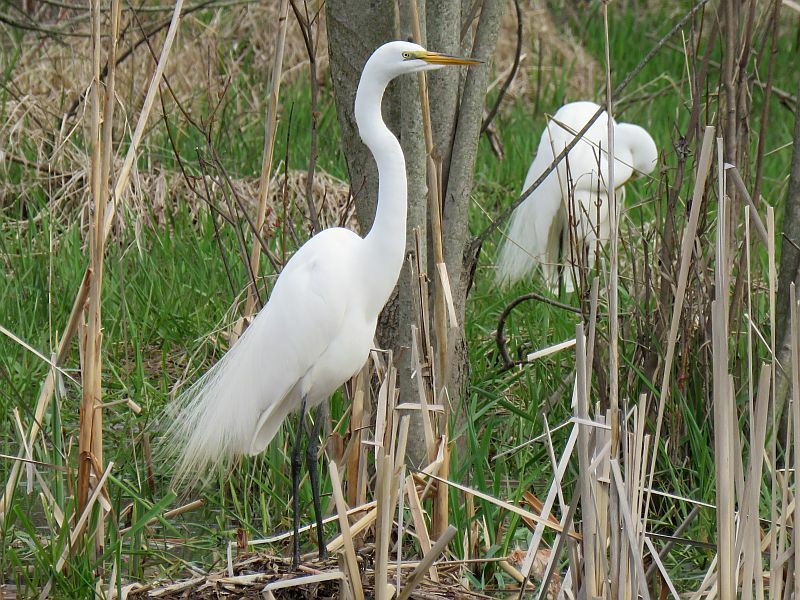 This beautiful Great Egret was one of several at Pickerington Ponds Metro Park. 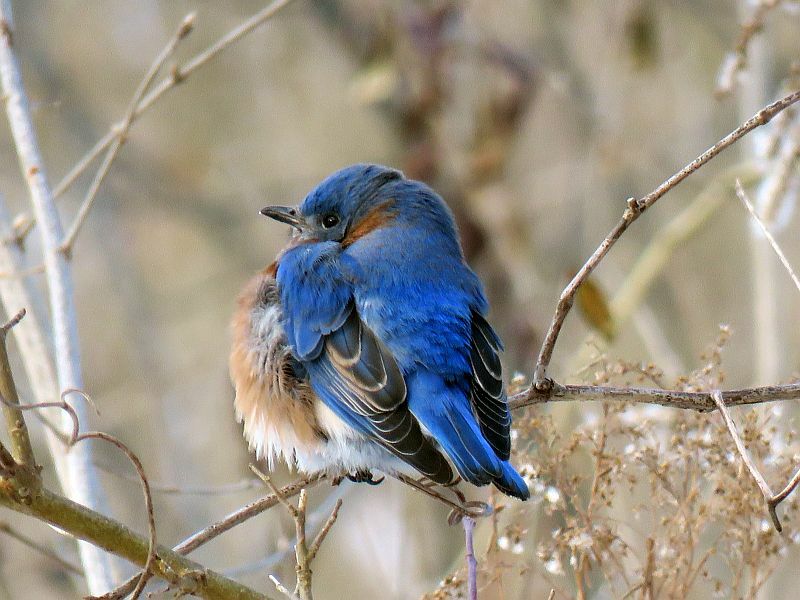 This Eastern Bluebird was one of a flock of 7 that was foraging for berries on a single-digit temperature day in January last year at Kiwanis Park. 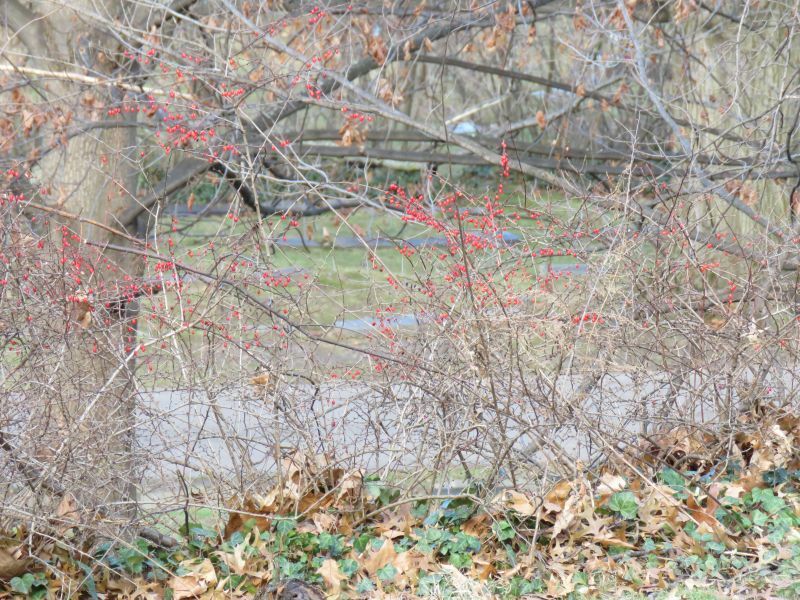 Its brilliant colors brightened up a drab brown winter landscape. 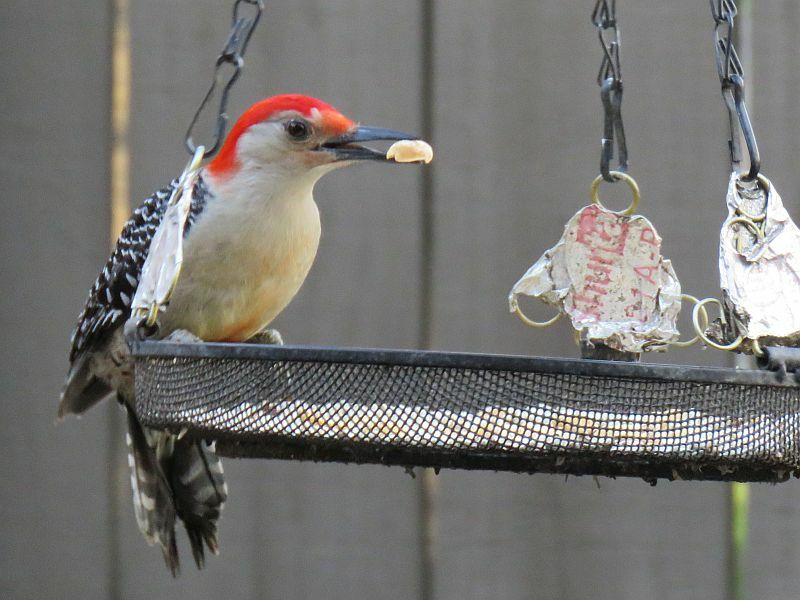 Eastern Flickers commonly feed on the ground, unlike other Woodpecker species. 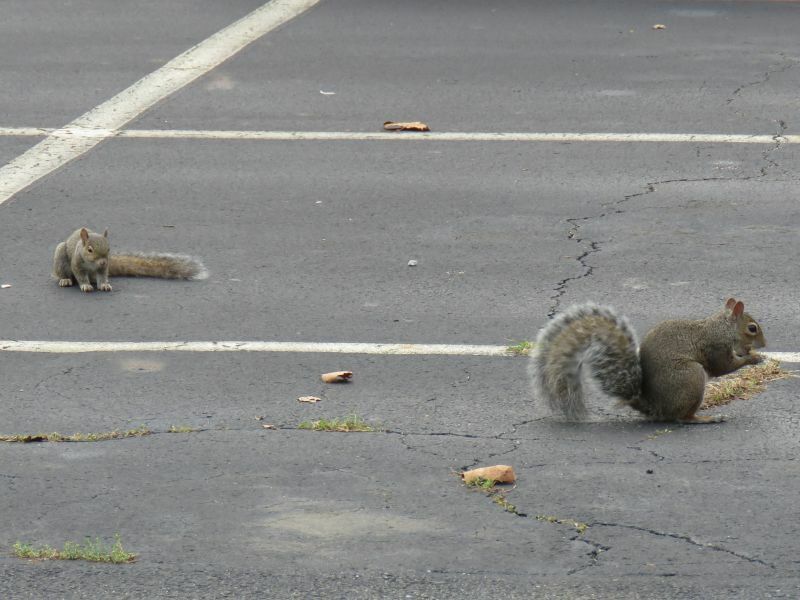 They like ants. 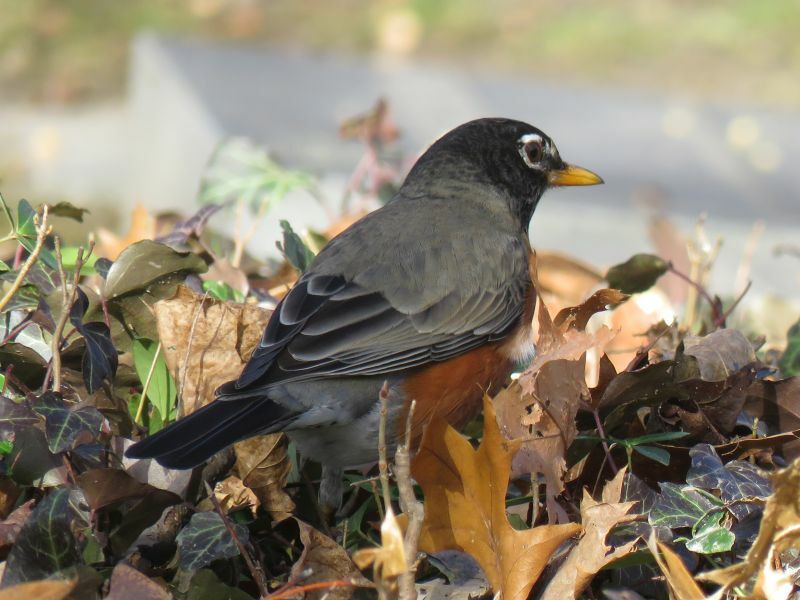 An American Robin peering intently for food. 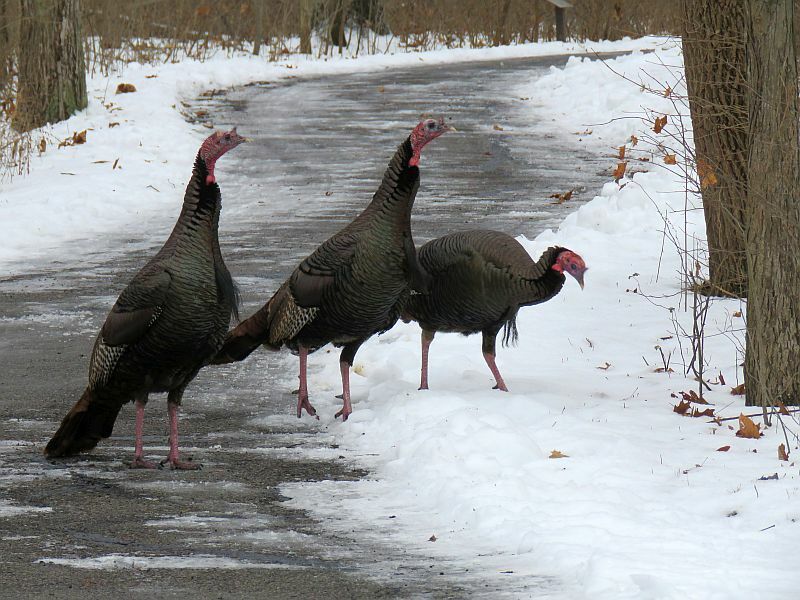 A few female Wild Turkeys, part of the locally famous flock out at Blendon Woods Metro Park. 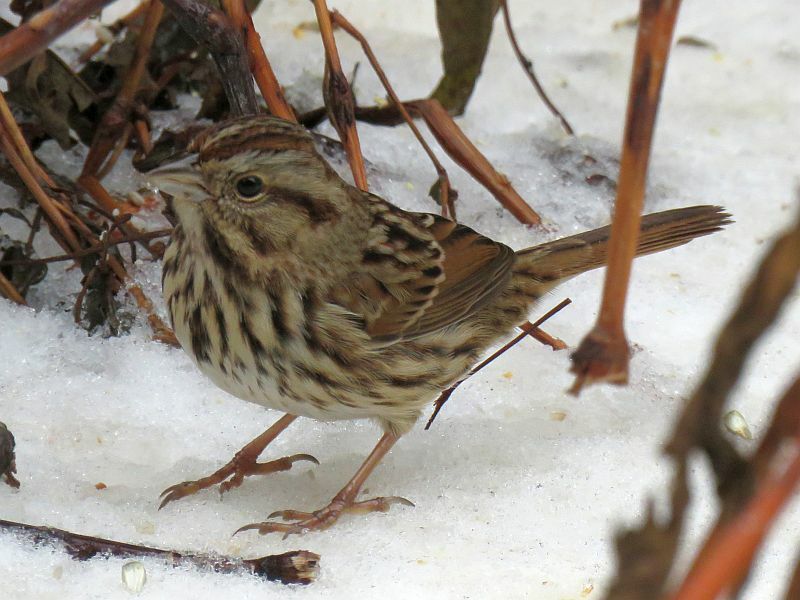 A Song Sparrow peers straight down. 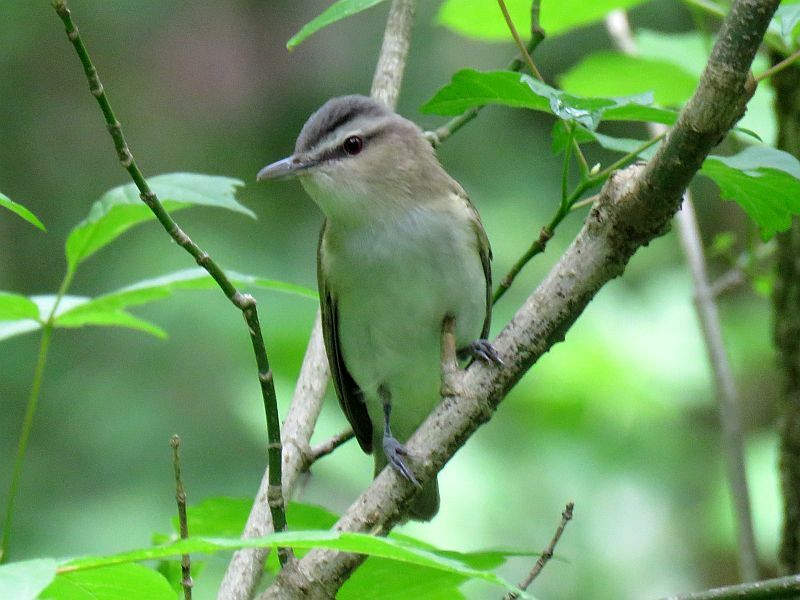 An unusual view of a Red-Eyed Vireo I saw out at Battelle Darby Metro Park. 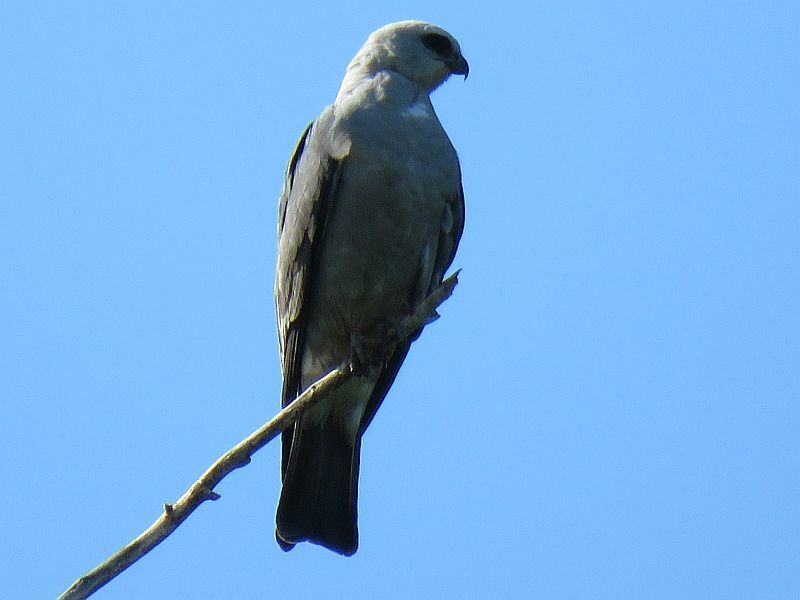 This bird came down to eye-level only feet away from me as it hunted for food- usually they stay higher up in the trees. 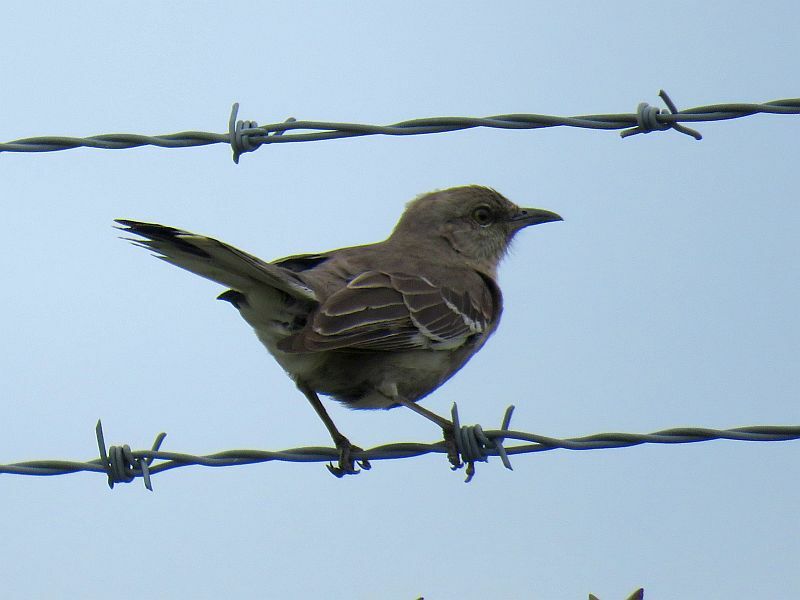 A Northern Mockingbird on territory at OSU’s Don Scott Airfield. 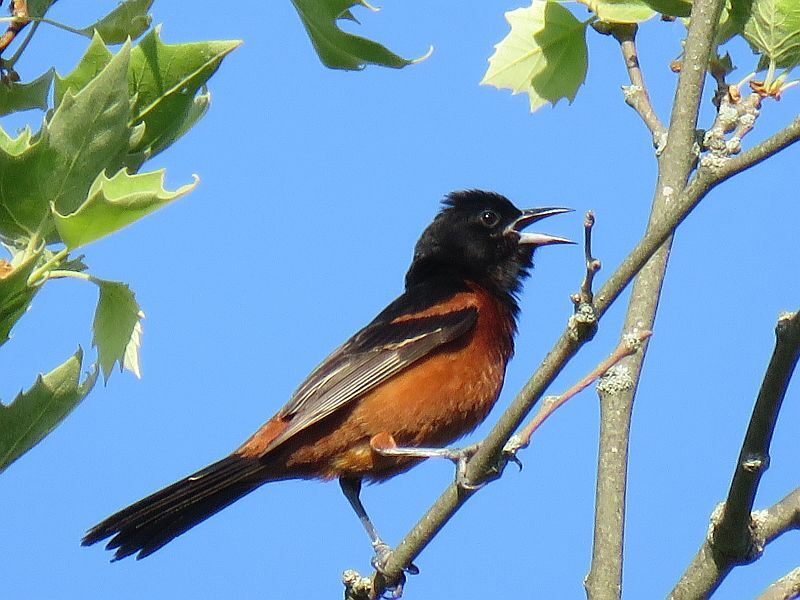 This male Orchard Oriole was singing up a storm out by the old Galbraith Racetrack at Battelle Darby Creek Metro Park. 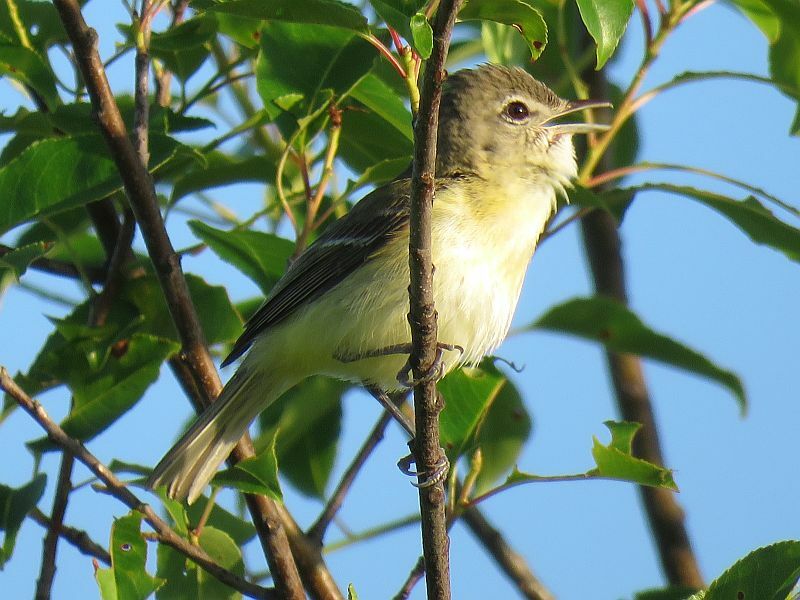 A Bell’s Vireo singing out at Battelle Darby Metro Park. 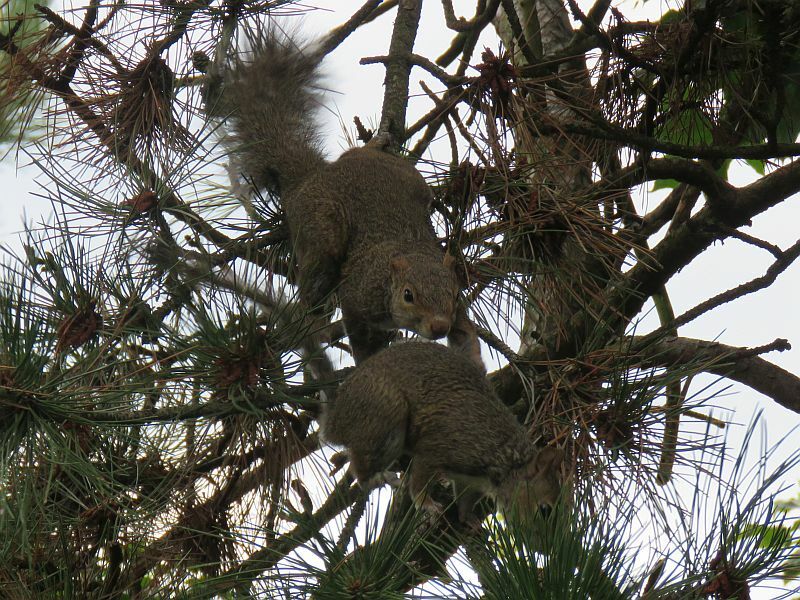 A pair nested there in the Kuhlwein Wetlands area last summer. 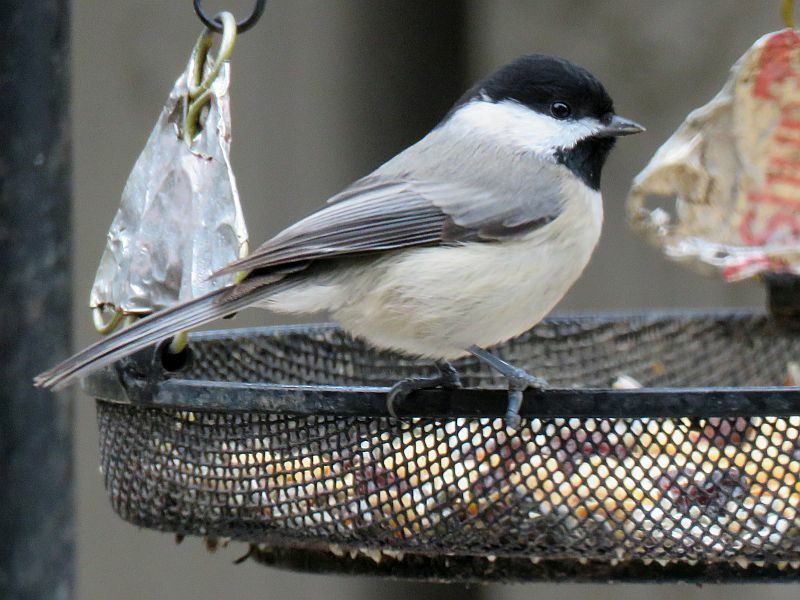 This species is making more and more visits as a breeding bird in central Ohio. 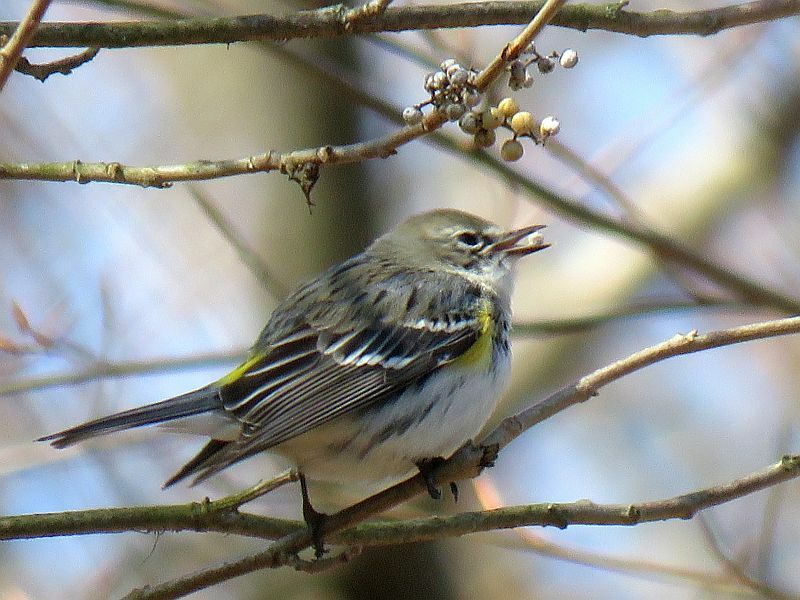 A female Yellow-Rumped Warbler eating poison ivy berries, one of their favorite foods. 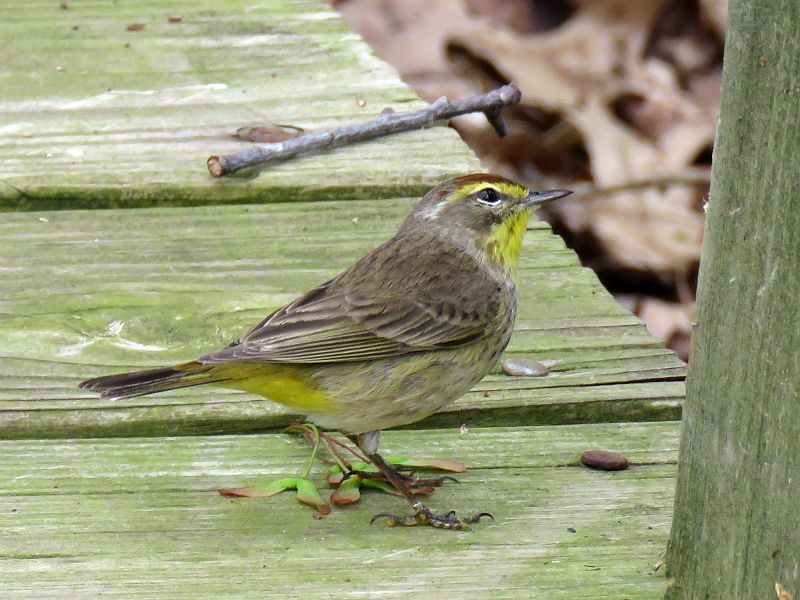 A Palm Warbler seen at Blendon Woods Metro Park during spring migration. 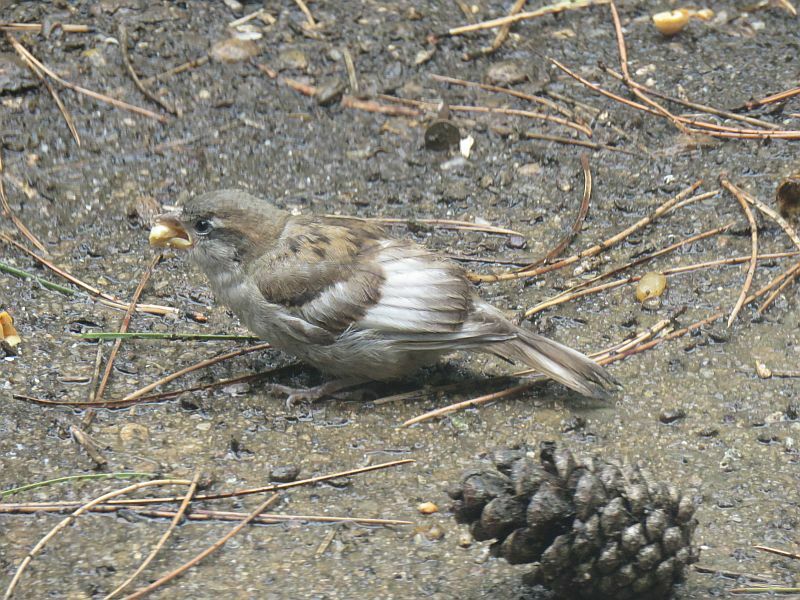 Palm Warblers are more likely to be seen foraging on the ground than most other Warblers. 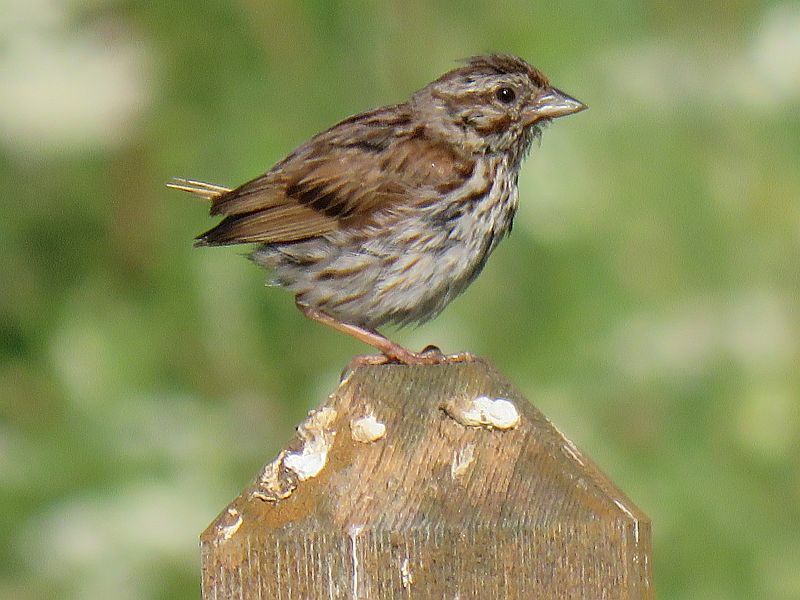 This Song Sparrow had lost its tail, most likely to some predator that missed making it a meal. 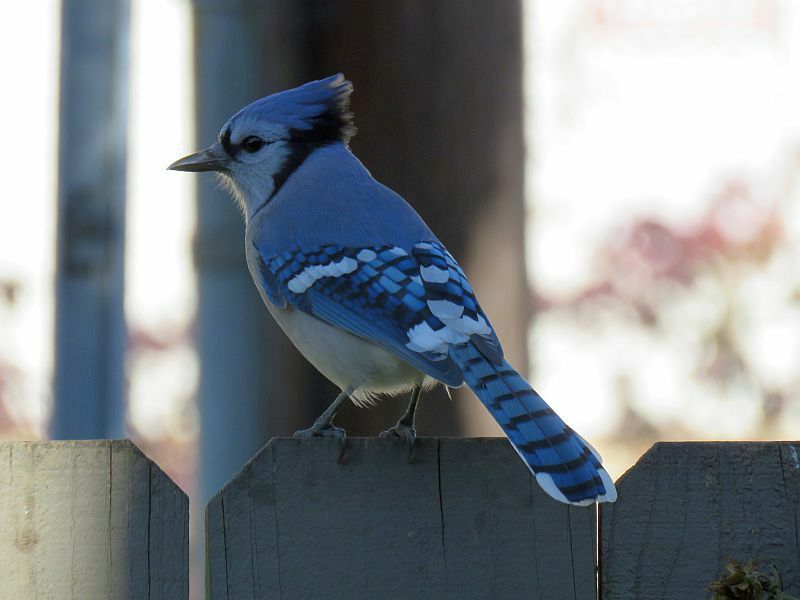 The tail feathers will grow back, hang in there, fella. 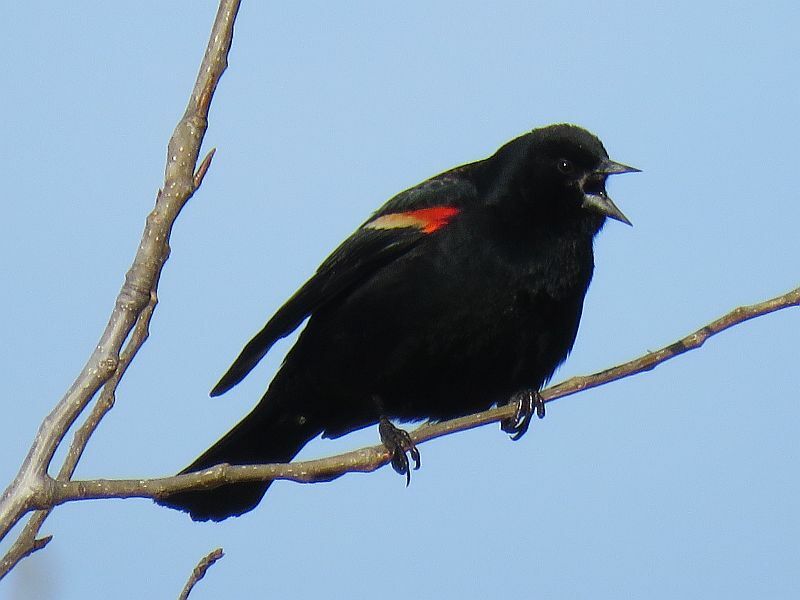 You can always count on Red-Winged Blackbirds to squawk their disapproval of your presence during their nesting season! 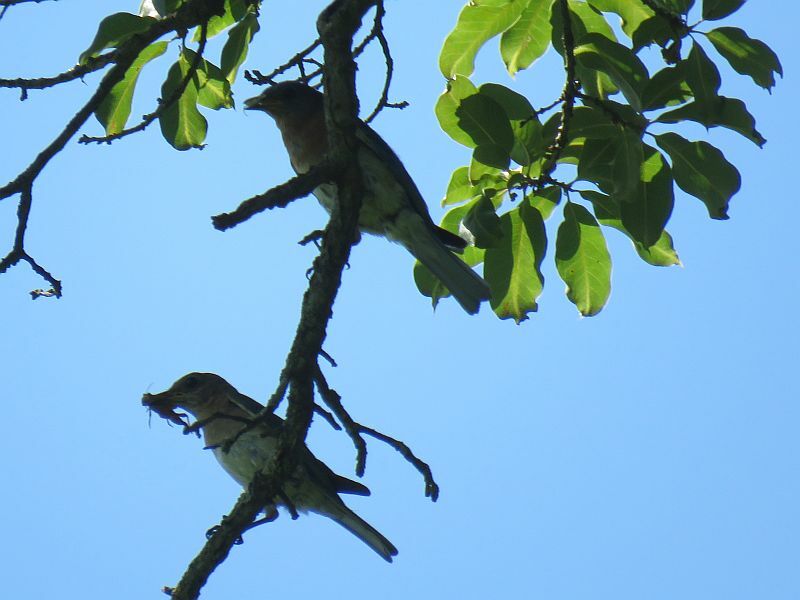 I felt sorry for this pair of Eastern Bluebirds. 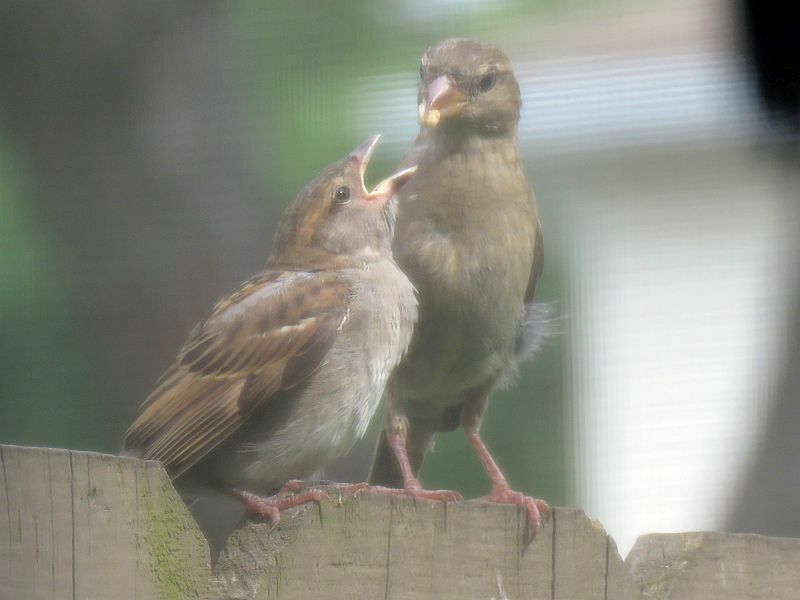 A pair of House Sparrows were trying to take over their nest box and was keeping them away from their nest, which obviously had babies in it. 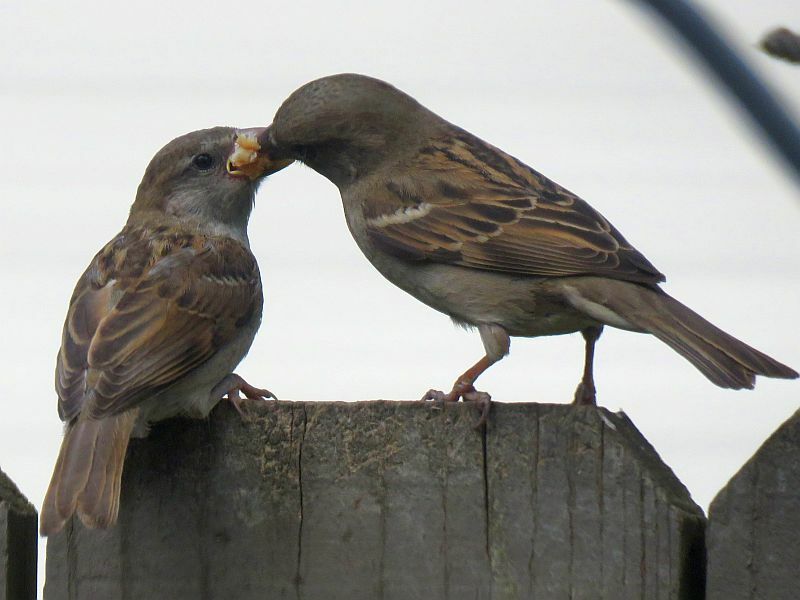 I hope they got to feed their offspring! 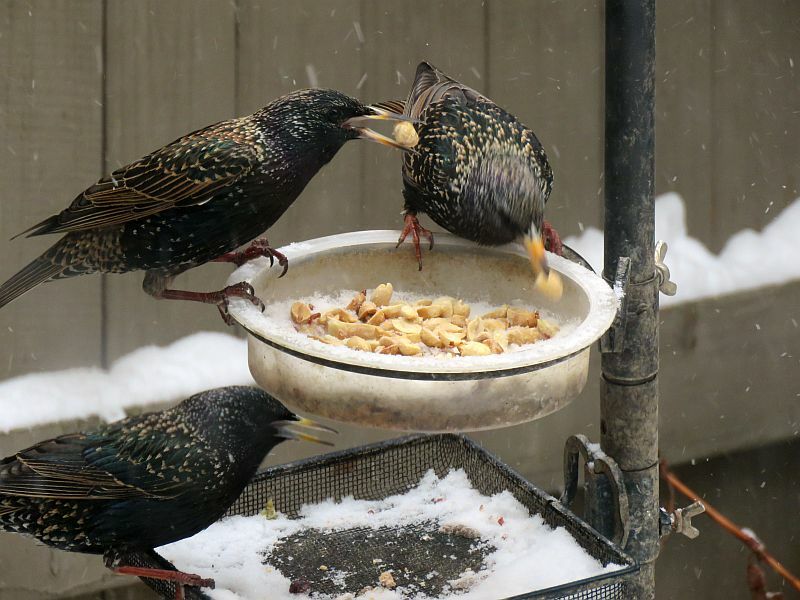 There are 5 different species of birds crowded around this popular feeder a year ago! 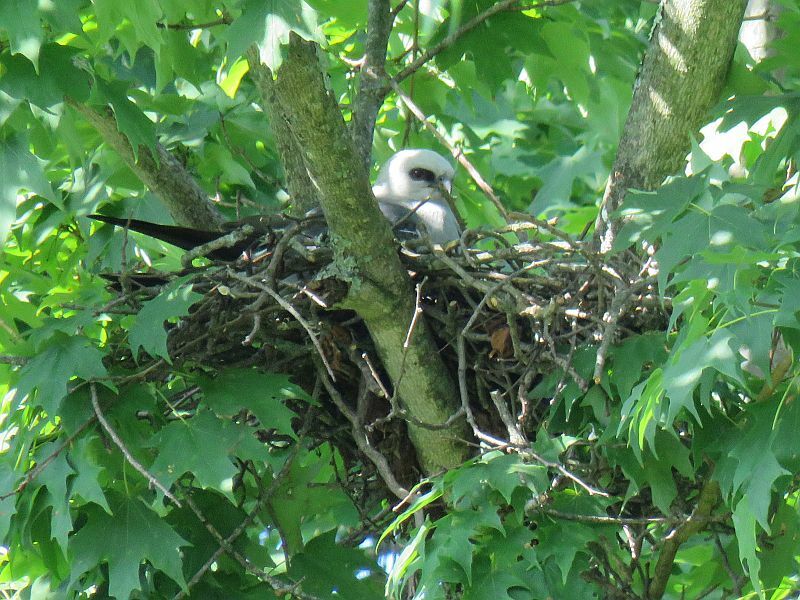 This is a pair of Mississippi Kites, raptors nesting in Chillicothe, Ohio. 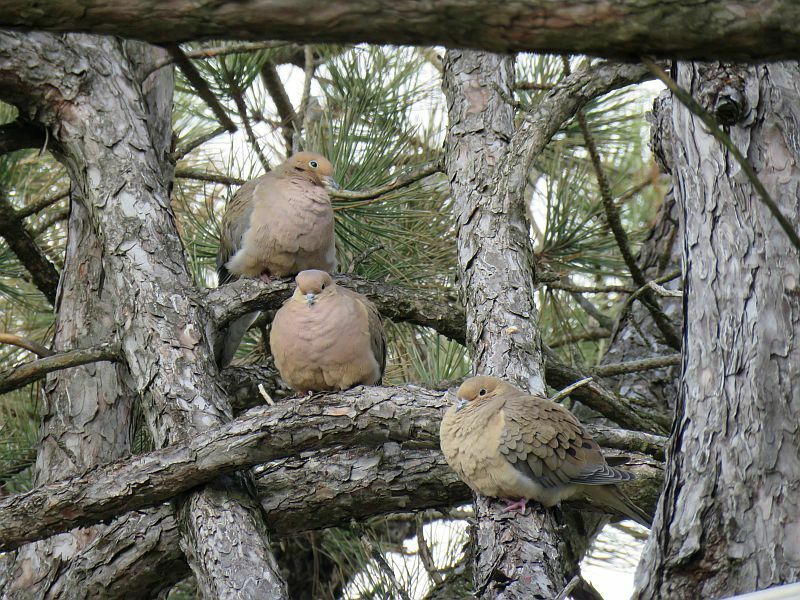 They’ve been nesting there for a few years now. 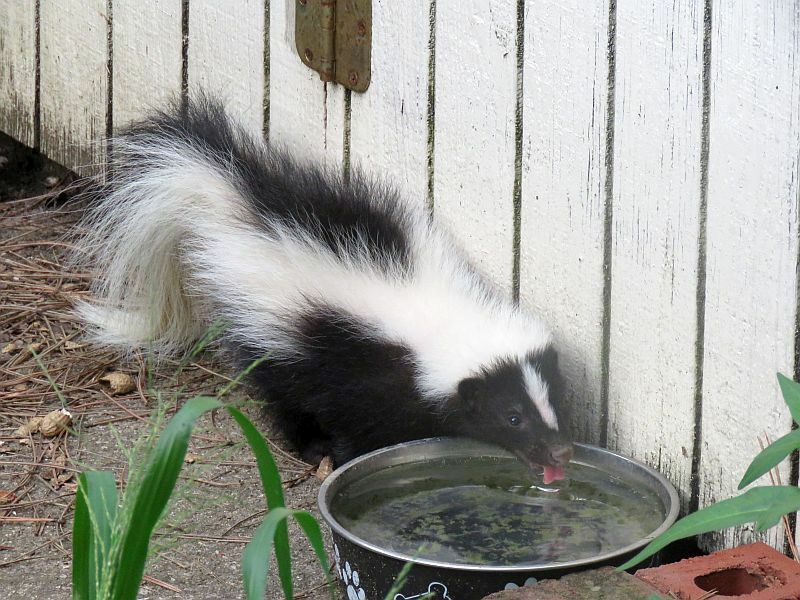 This species is rarely seen in Ohio. 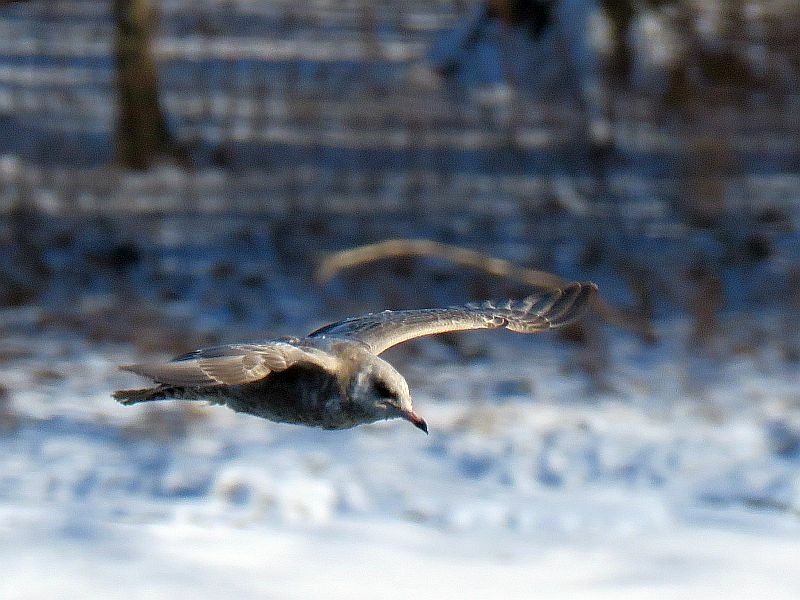 This is a Mew Gull, seen on New Year’s Day at Green Lawn Dam. 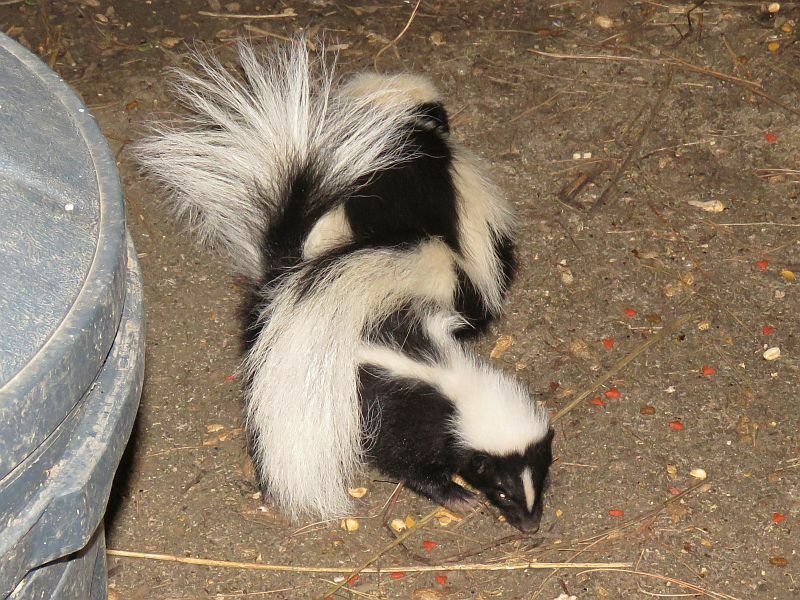 Unfortunately this rare visitor sickened and died. 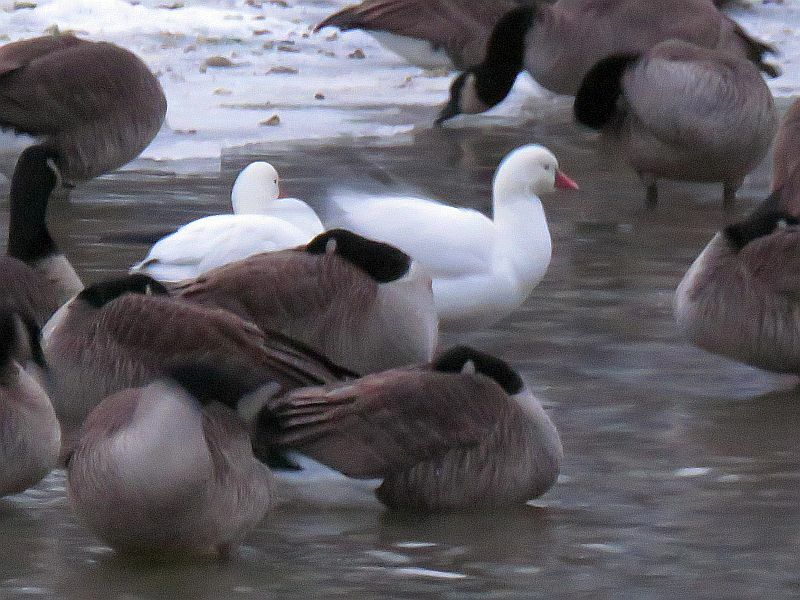 These are 2 Ross’s Geese, roosting for the night with a flock of Canada Geese. 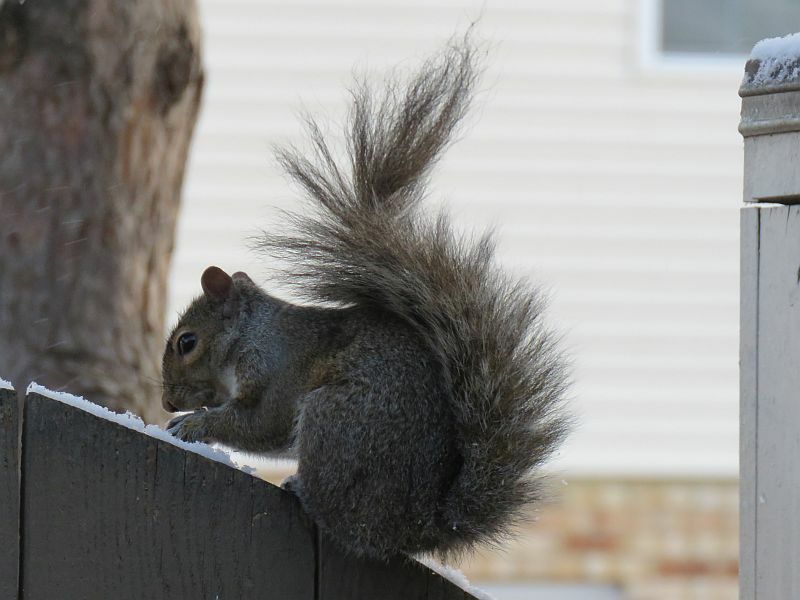 I went out three days in a row in frigid windy weather to finally spot them. So many pictures, so little space! 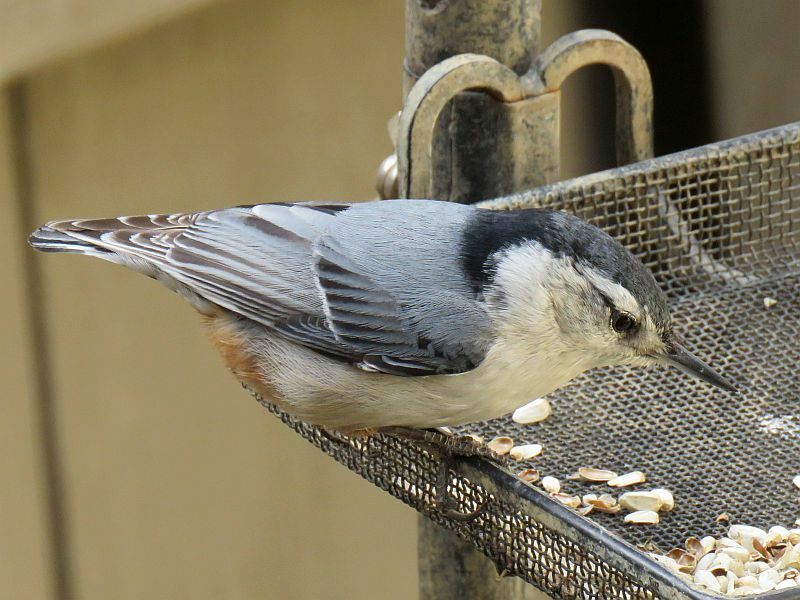 It’s been a good autumn for rare birds here in Ohio. Kirtland’s Warbler was a signal highlight. 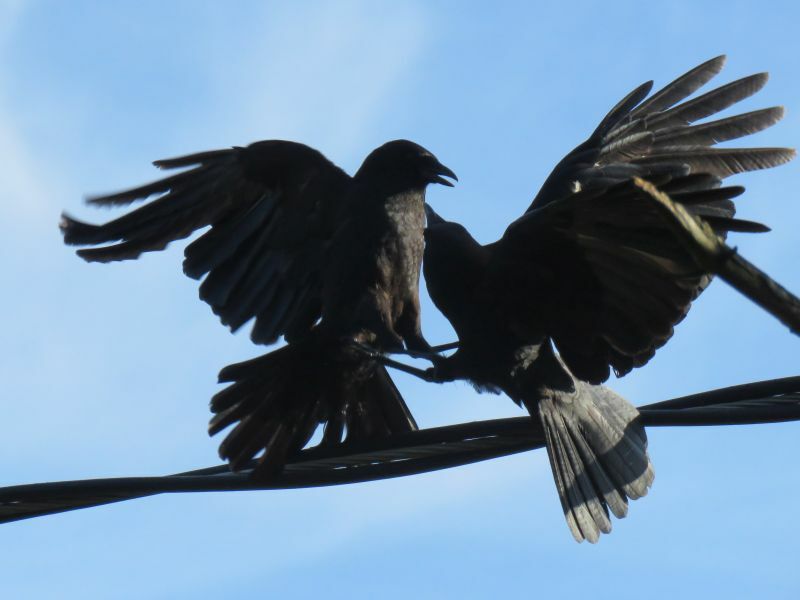 Two others that I managed to see in October stand out. 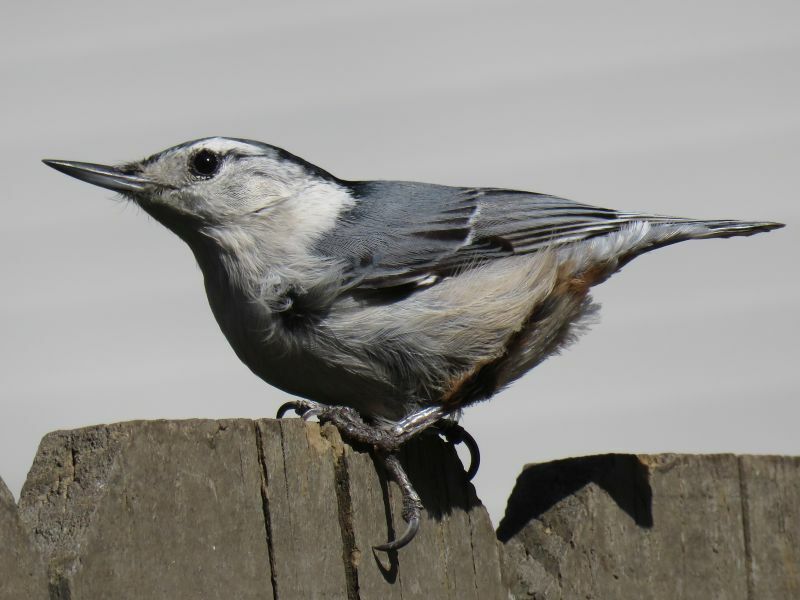 Jim McCormac, a prominent Ohio naturalist who I’ve run into at a few rare bird stakeouts, wrote about seeing both of these birds. 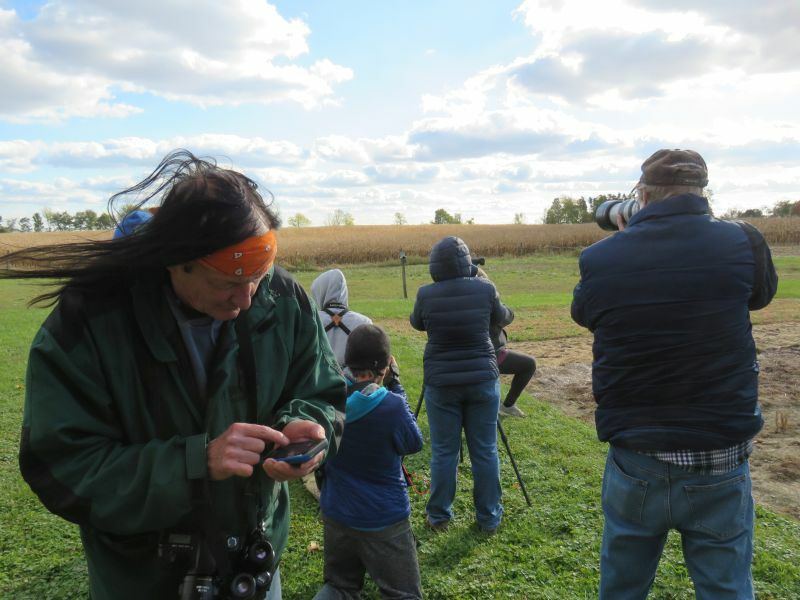 Jim has a nature column he writes for the Columbus Dispatch, and deserves a shout-out for sharing his significant knowledge of natural Ohio and nature photography. 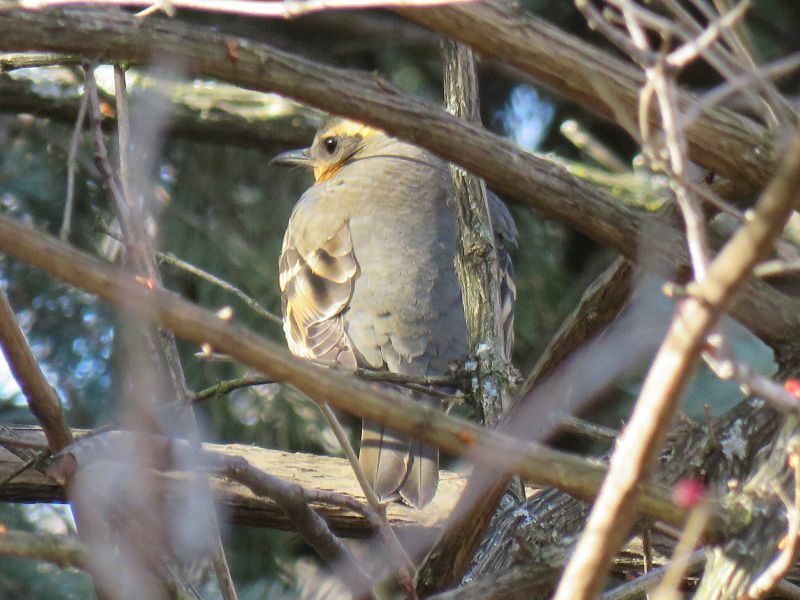 One bird showed up in Clark County, at Spangler Nature Preserve, located between Springfield and Dayton. 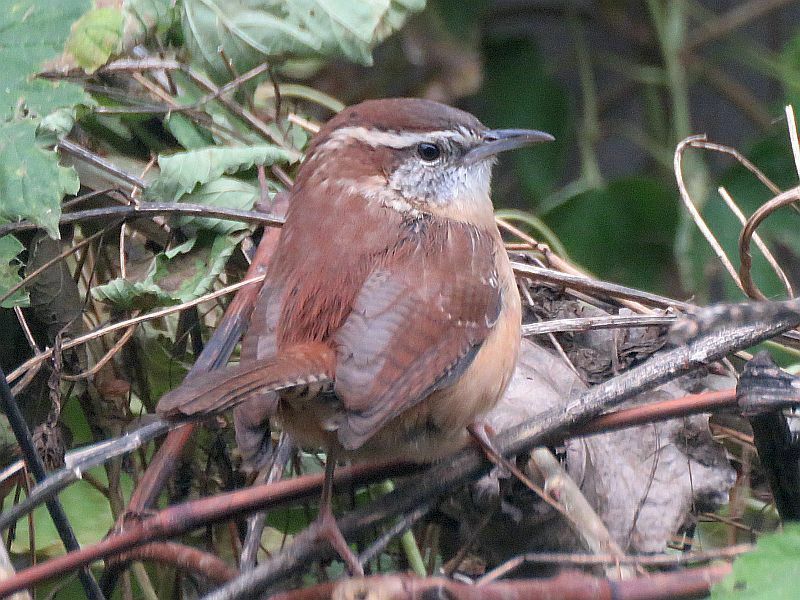 Jeff Peters gets full credit for identifying this bird- the first of its species identified in Ohio. That’s a big deal! 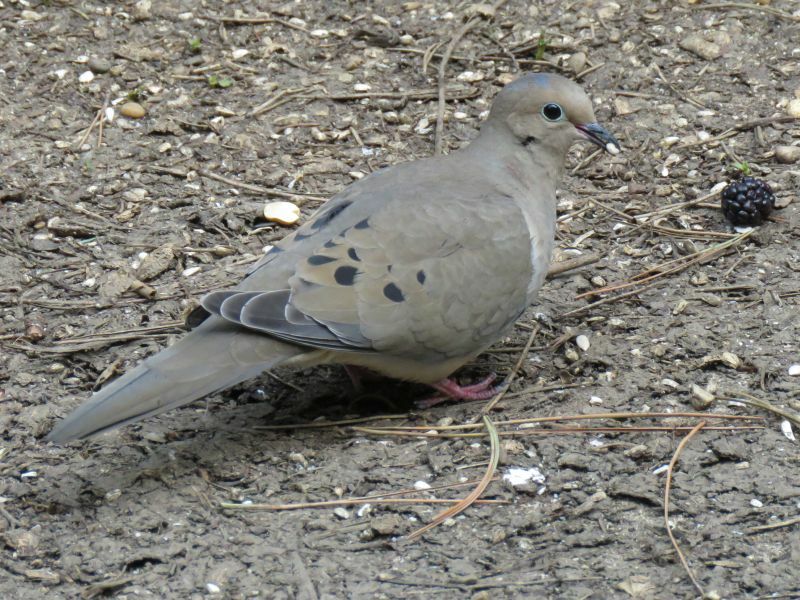 The very day this bird was seen, I saw the report on the Ohio Birds Listserv and jumped in my car to drive out there as soon as I could. 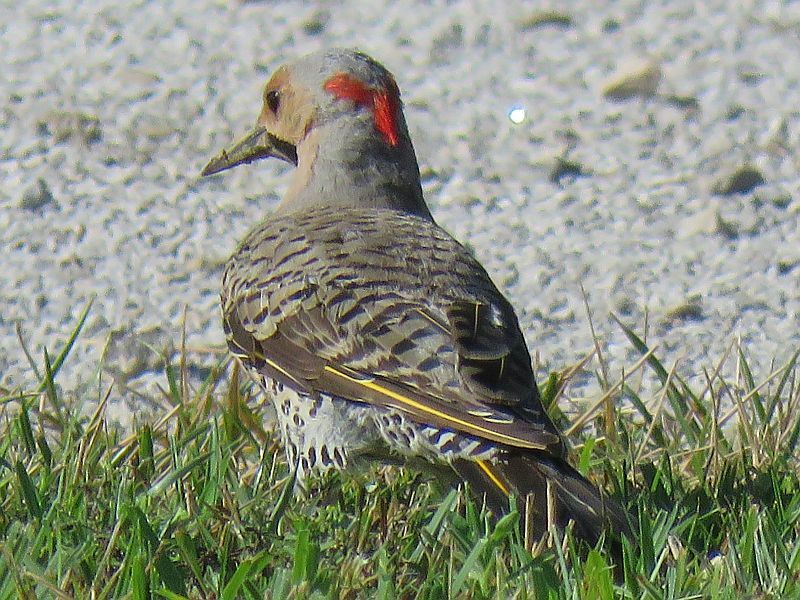 I normally take scenic backroads when traveling across Ohio, but this bird sighting made me get on the freeway and drive as fast as I legally could to its location. 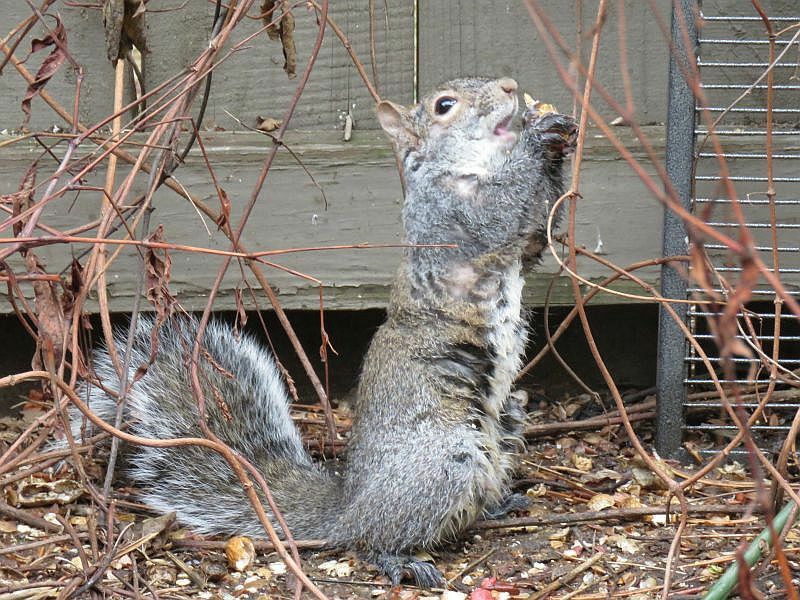 Luckily, Spangler Nature Preserve is perhaps half a mile from Route 70 at the Spangler Road exit. 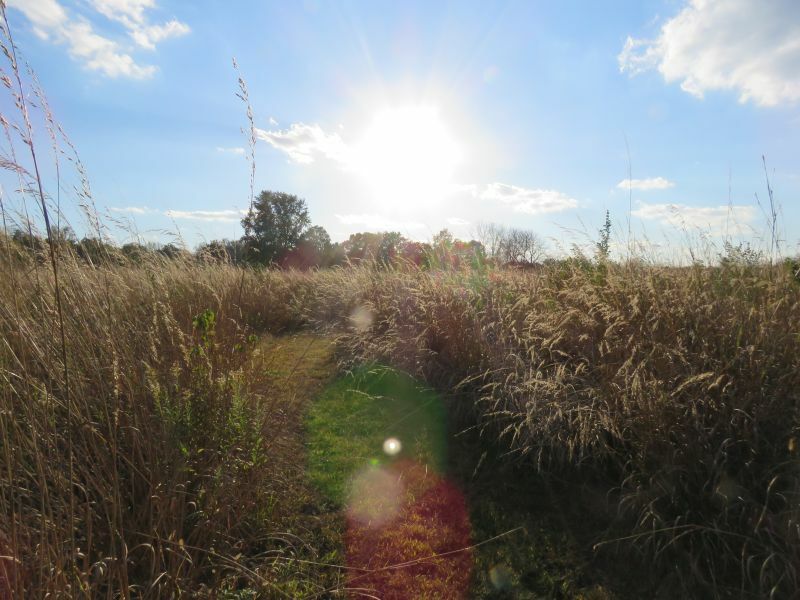 I got there late in the afternoon and walked the paths through prairie grass. 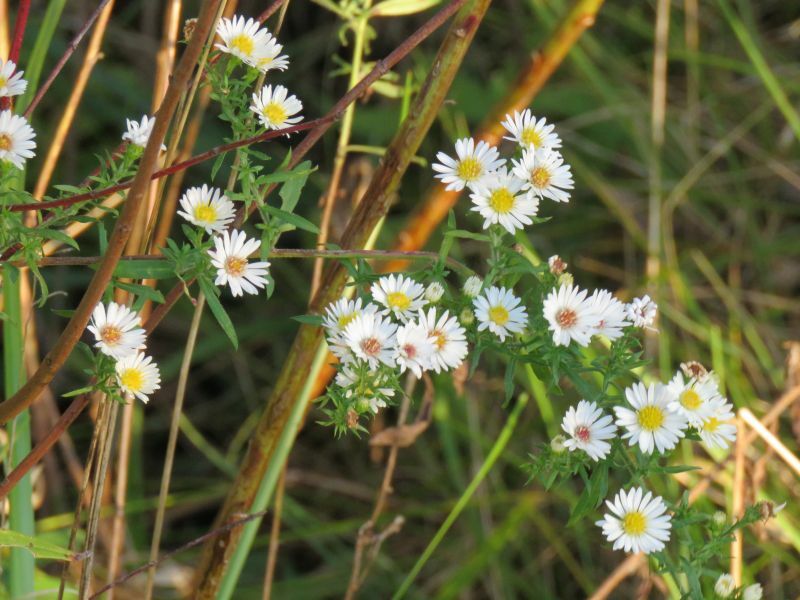 Late-blooming autumn flowers such as this White Aster dotted the preserve. The path took me back to a treeline on the northern border of the park. 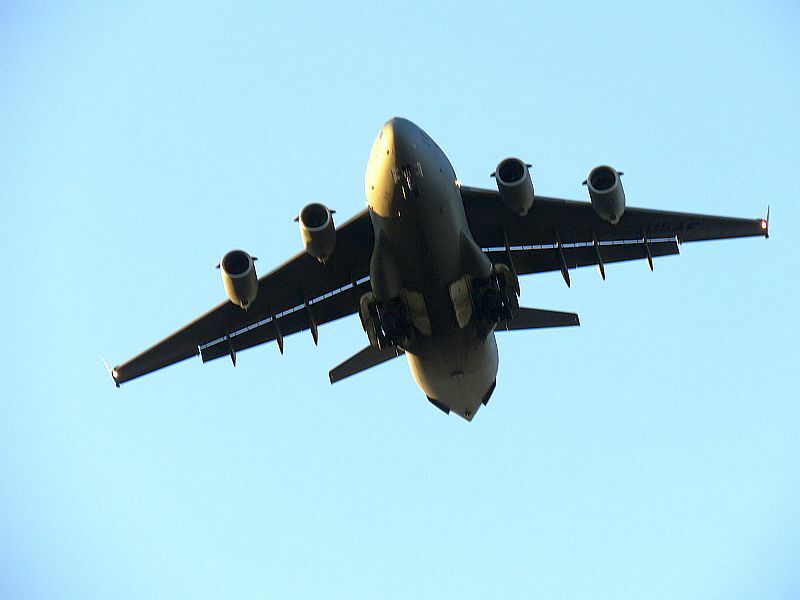 Overhead, military cargo planes made frequent practice takeoffs and landings to and from nearby Wright-Patterson Air Force Base. 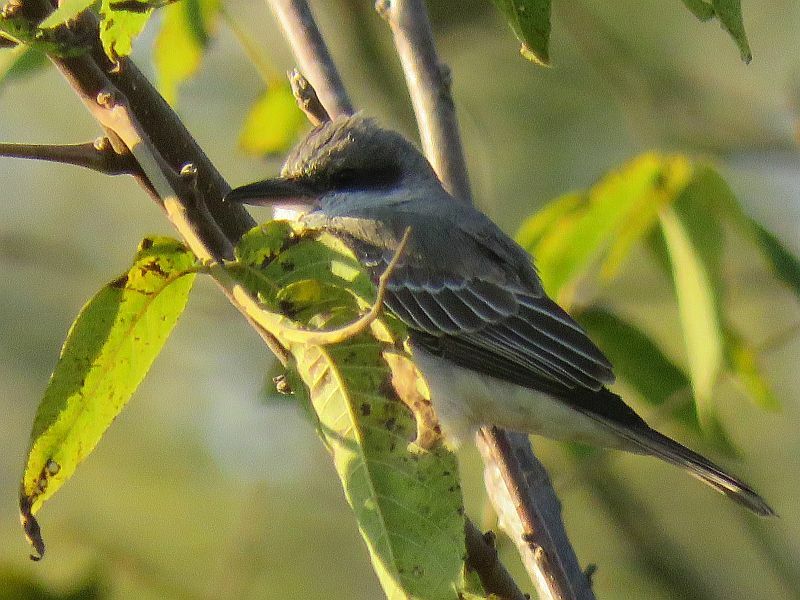 I could tell immediately that this was a Kingbird, a larger Flycatcher, distinguished by its larger size, thick bill and overall flycatcher looks and behavior (perching on a branch, occasionally flying out to catch an insect on the wing). 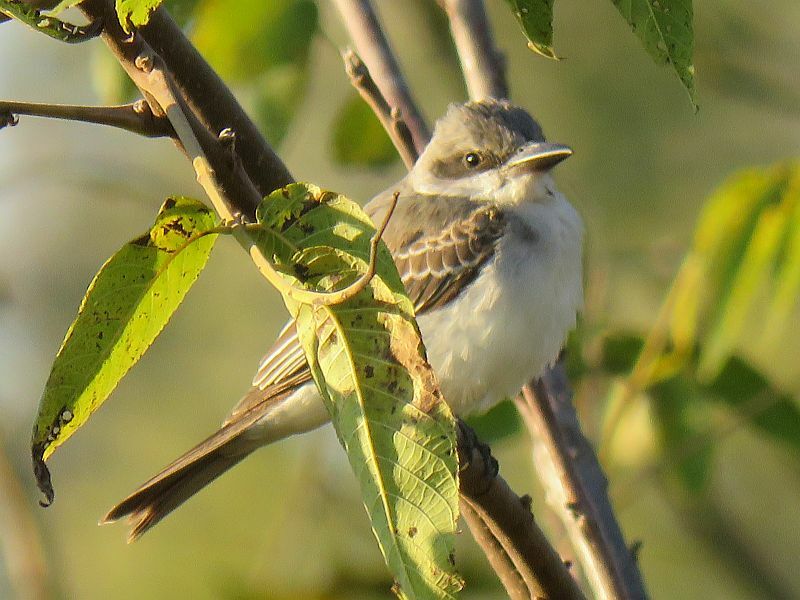 This is a Gray Kingbird, the first of its species to be confirmed visiting the state of Ohio. 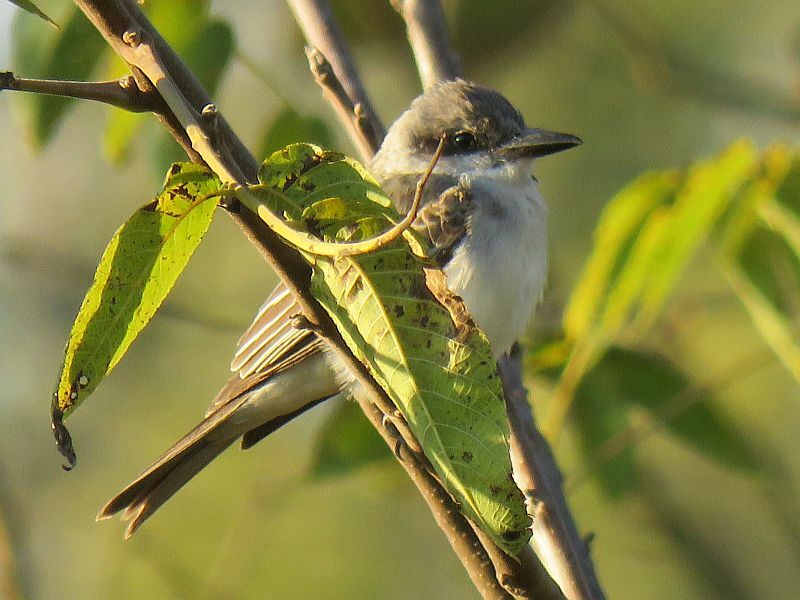 It looks somewhat similar to the common Eastern Kingbird, but its most notable distinguishing mark is its black mask which reminds me of a Shrike. 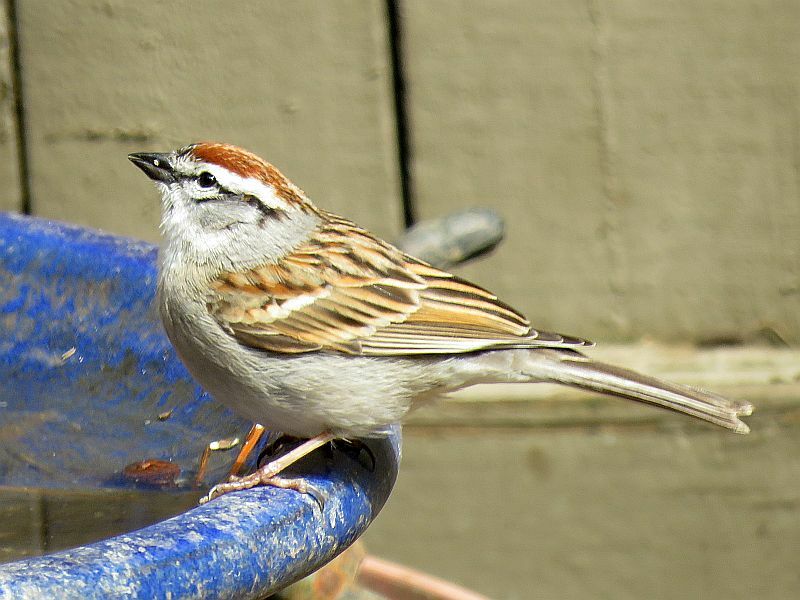 This bird typically lives in the Caribbean islands, and visits the Florida coast in the summer. In the autumn, rare individuals roam north of this range. 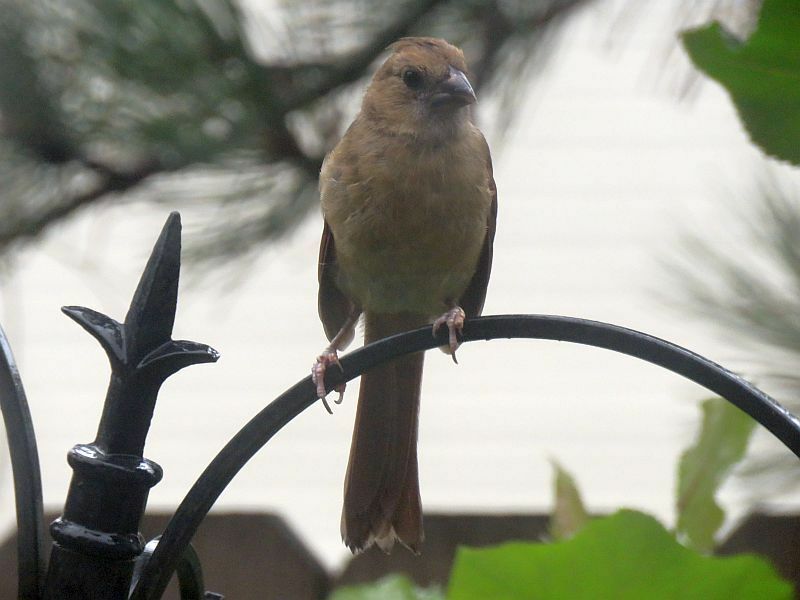 Ohio and Florida are quite different states and far apart, but this particular bird made it clear up here, and stayed a week. 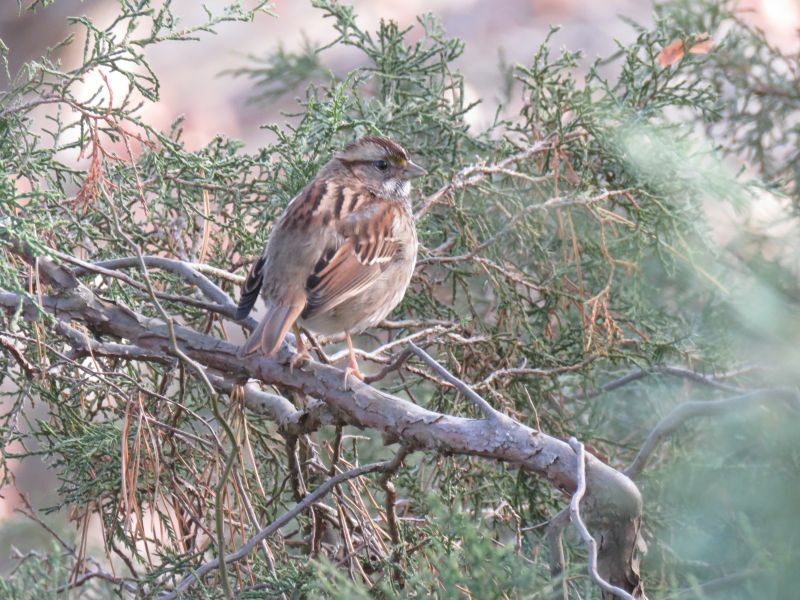 An amazing feat which may have been assisted by Hurricane Michael (hurricanes often bring unusual birds with them, and birders are on the alert). 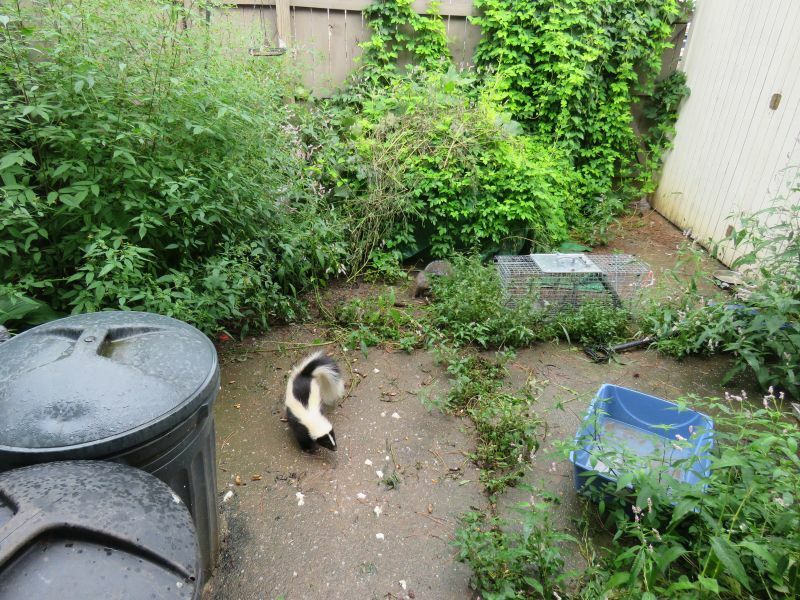 I was quite happy to stumble upon it mere hours after it was reported seen for the first time. 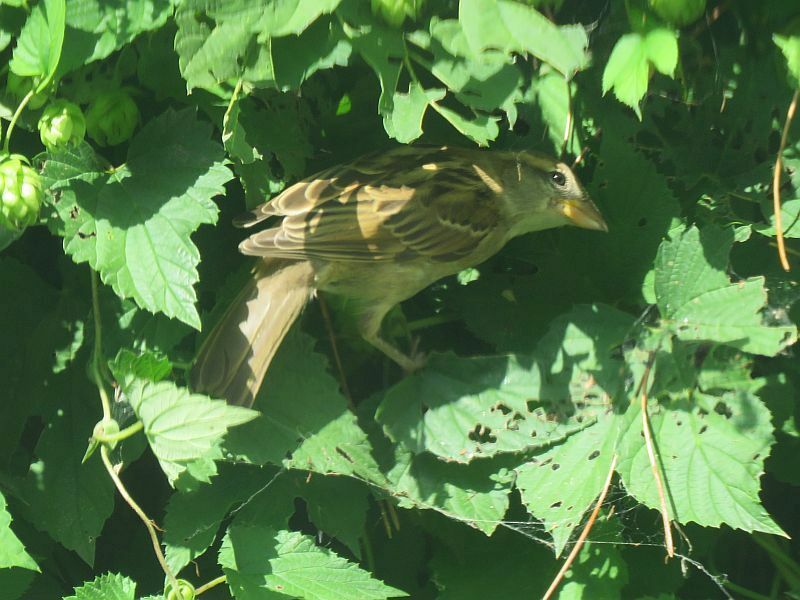 Not all rare bird sightings are so easily duplicated, I can assure you! 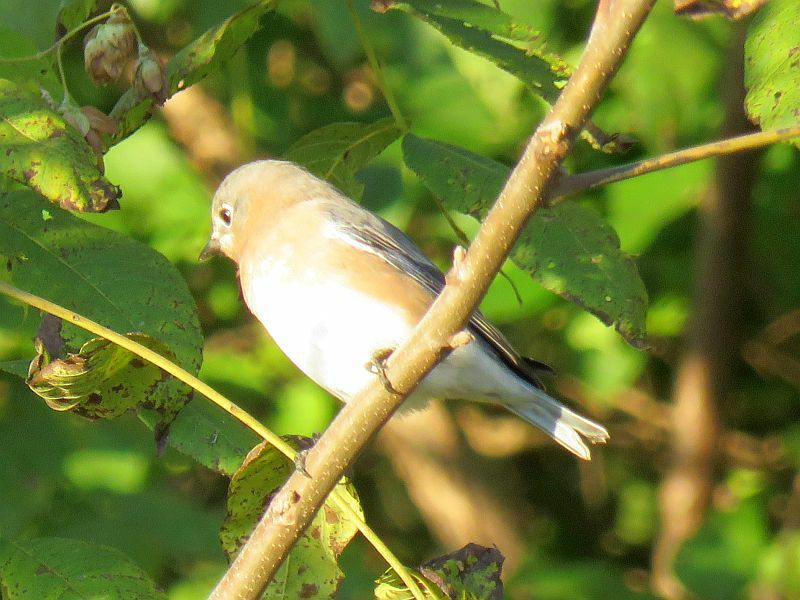 The other rare October bird I saw appeared in Richland County, a farming region north of Mansfield. 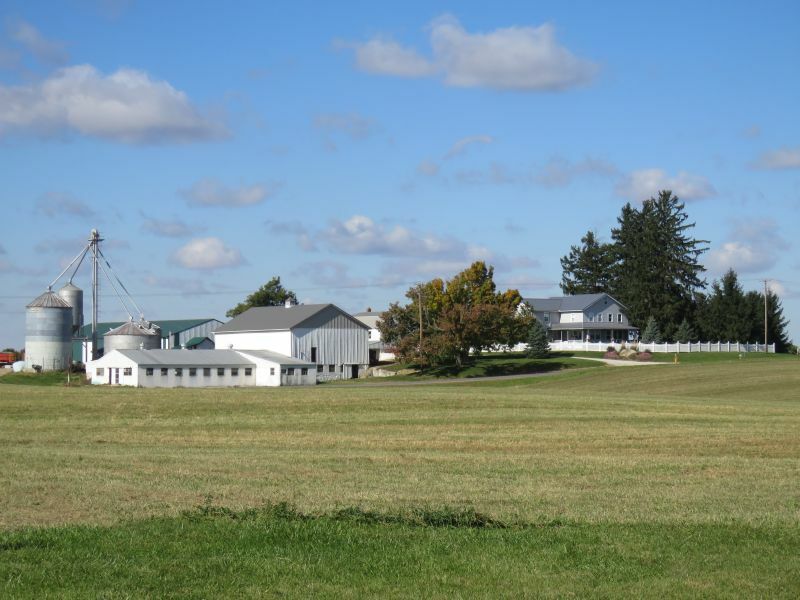 The area has many Mennonite family farms. 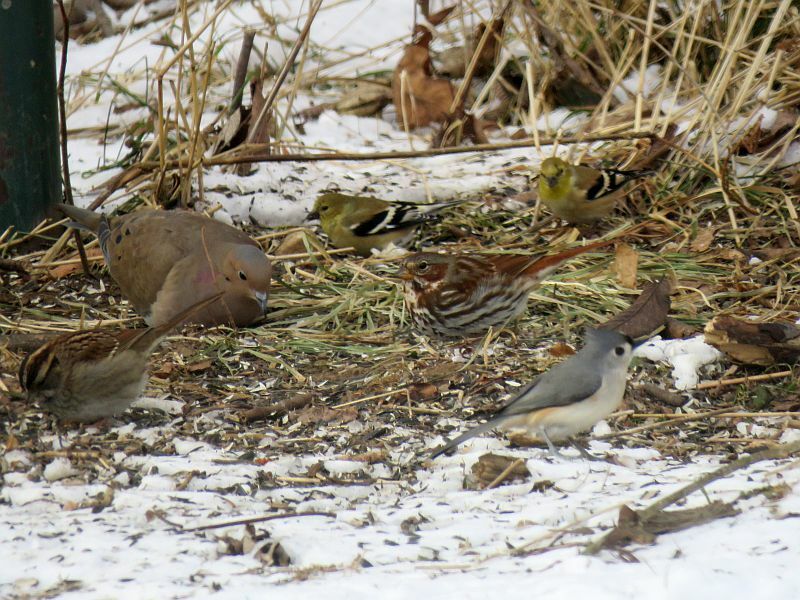 One of these families saw the rare bird and graciously allowed birders onto their farm to see it. 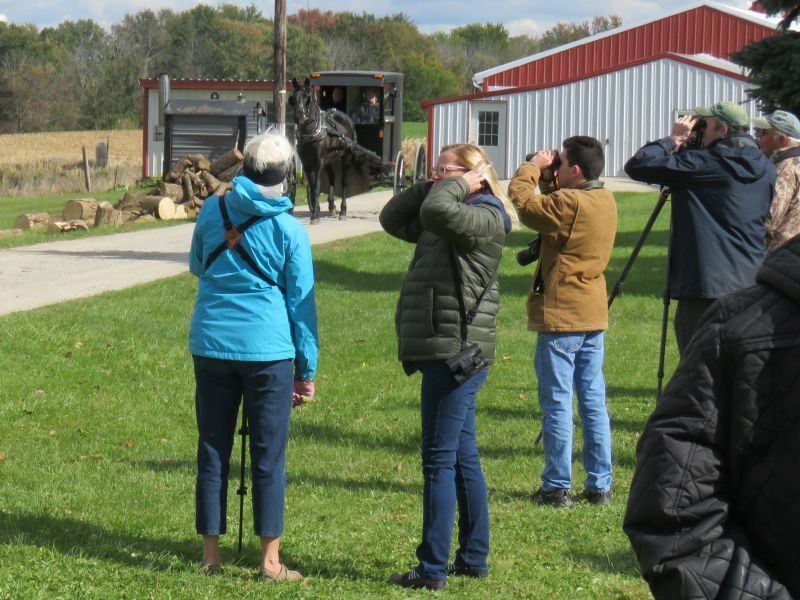 In my experience, Mennonites (a Christian Anabaptist religious group somewhat similar to the Amish) often enjoy birding and nature and are nice people. 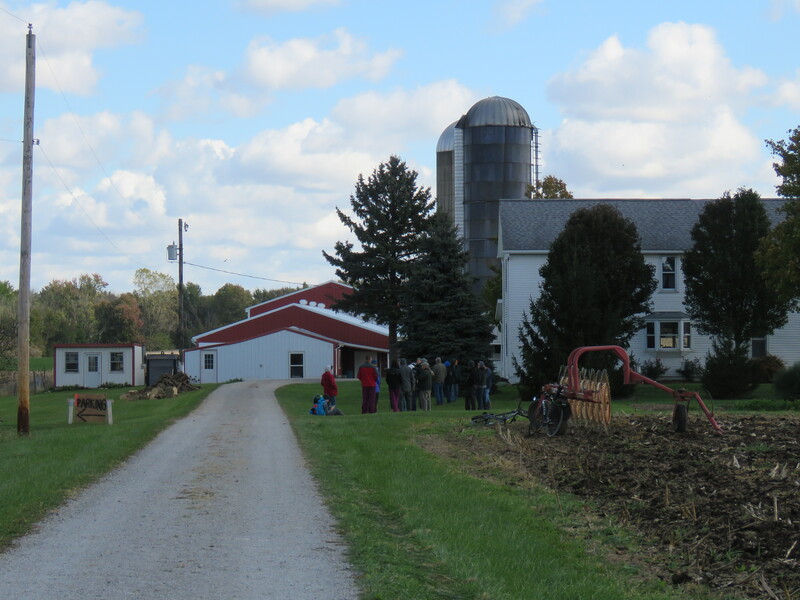 From Columbus, the farm was three-quarters of the way to Lake Erie. 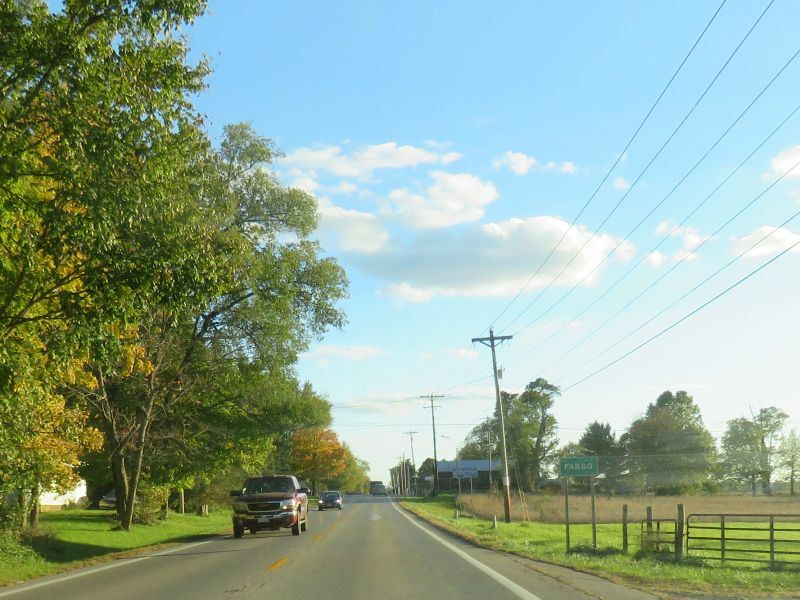 I took a backroads Ohio road trip, one of my favorite things to do. 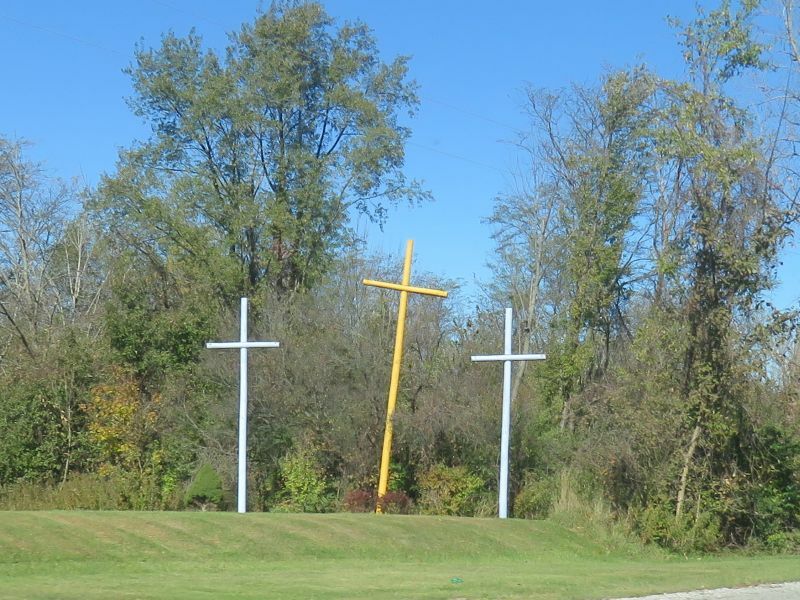 I’ve often seen three tall blue and yellow crosses along roadways- and there is a story behind them. There are always interesting things to see and learn on the road! And then, I arrived at my destination. 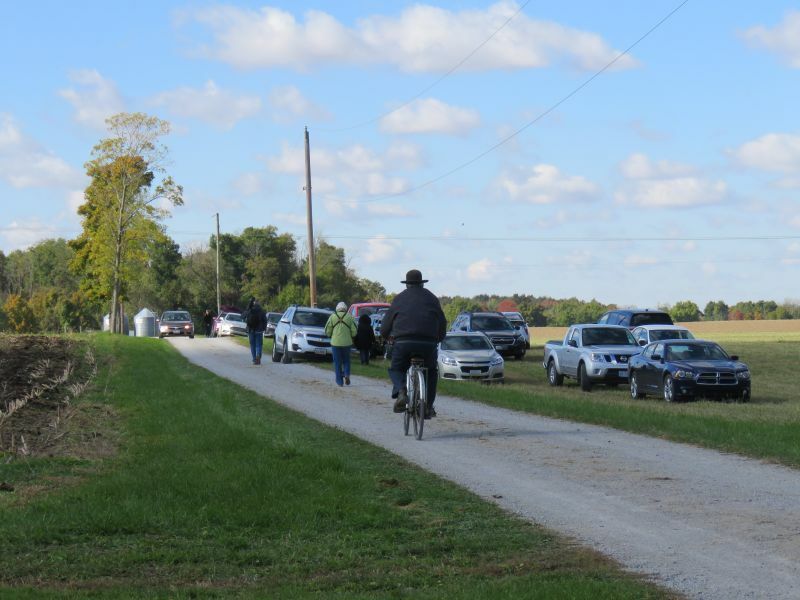 The long driveway onto the farm property. 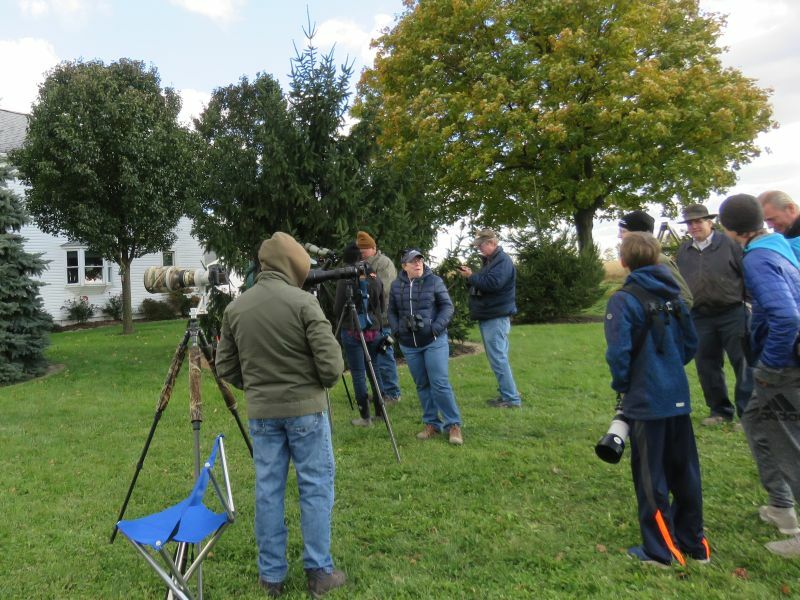 As you can see, birders had ‘flocked’ to the location. 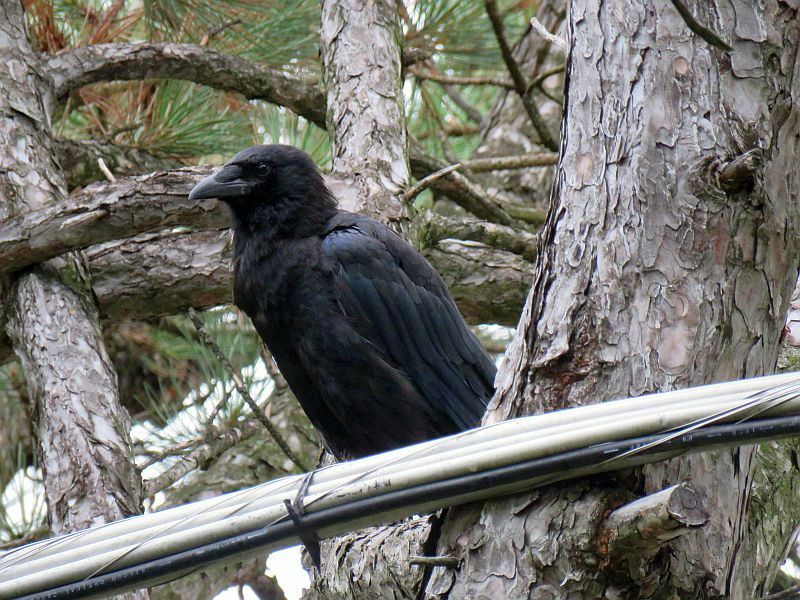 I arrived near noon, but the bird wasn’t in its usual area. Hours passed, birders spending the time looking around or chatting. 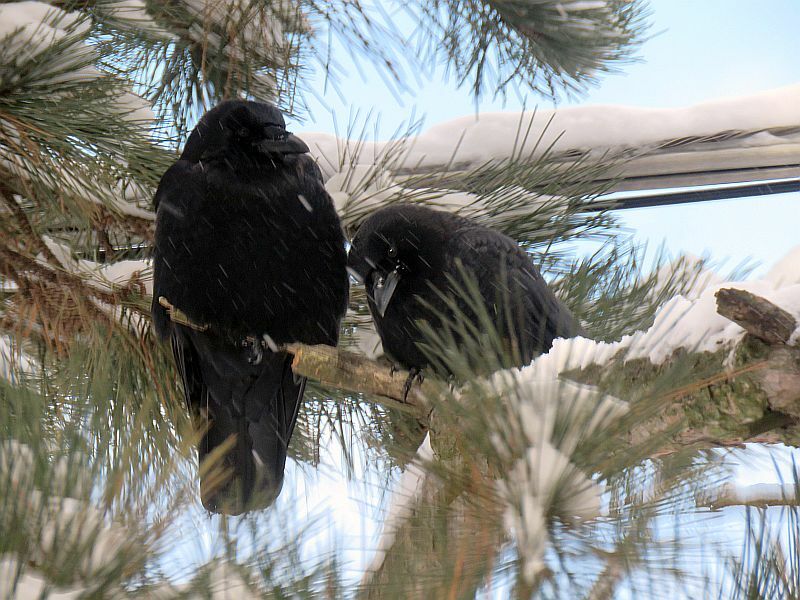 On these rare bird stakeouts, you often see the same people. Stories are swapped. 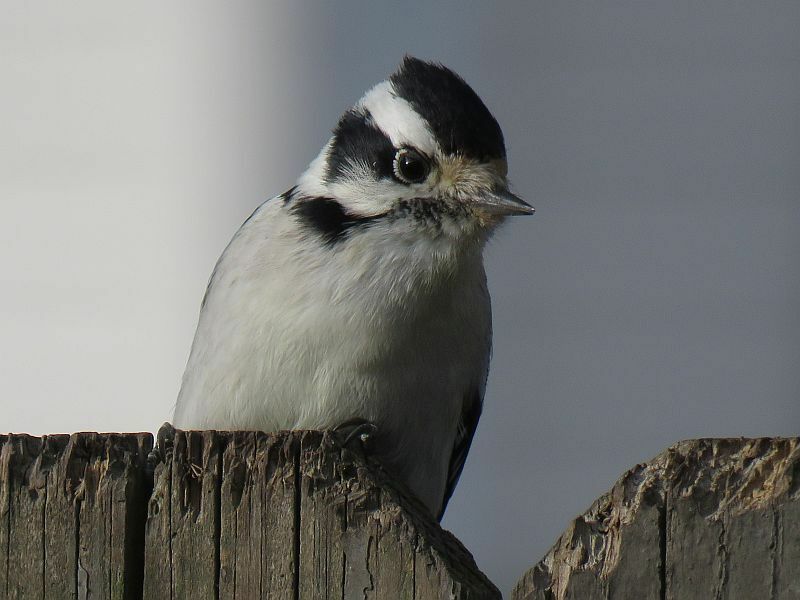 Here’s the woodpile that the bird often perched upon. 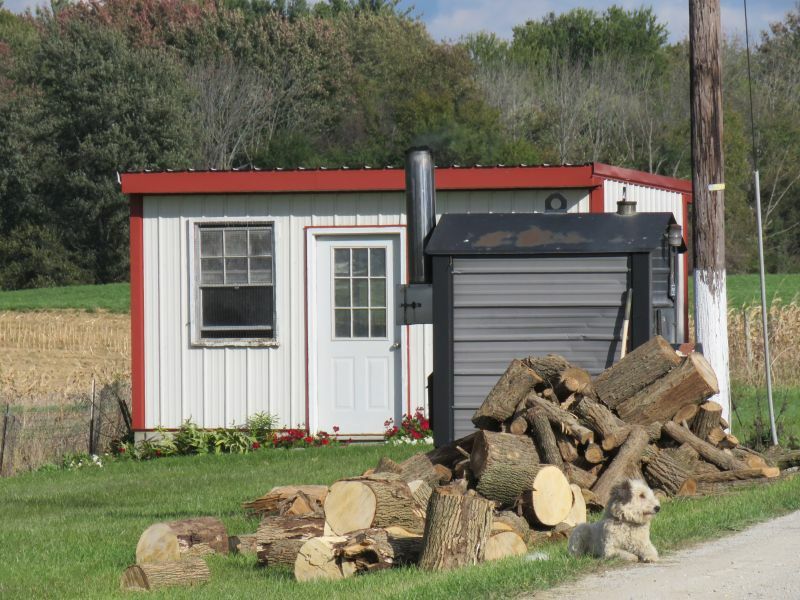 The small gray structure behind the woodpile is an outdoor furnace- wood is burned and the hot water is circulated via pipe to the farmhouse and back, heating the home. 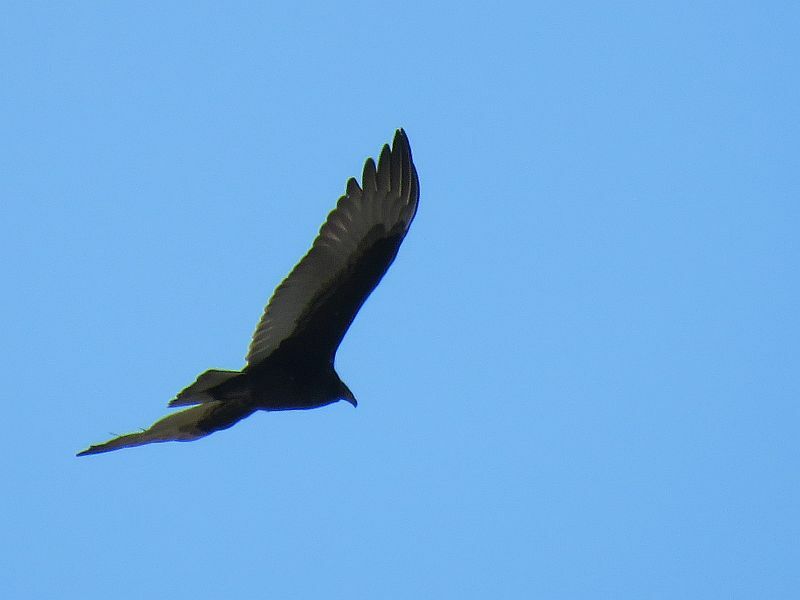 Turkey Vultures occasionally passed overhead, migrating south. And suddenly, after hours of waiting, the bird appeared. 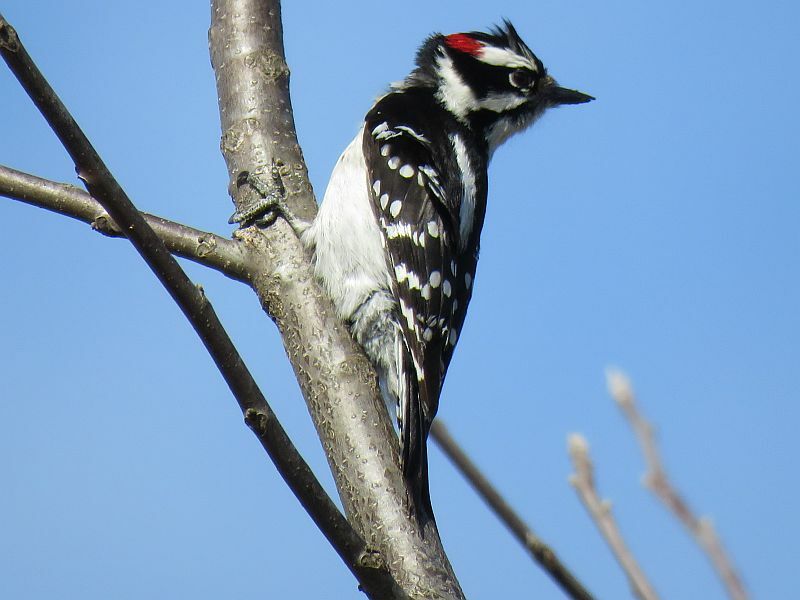 This is Bruce Simpson, Metro Parks naturalist and avid birder, posting via smartphone to the Ohio Birds Listserv that the bird had finally showed up while others frantically took pictures. 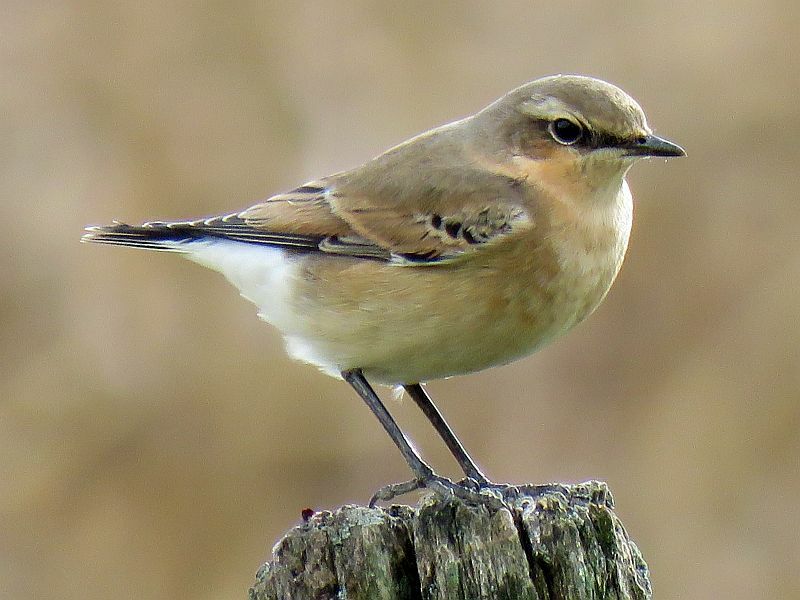 Here is the star of the show- a Northern Wheatear. 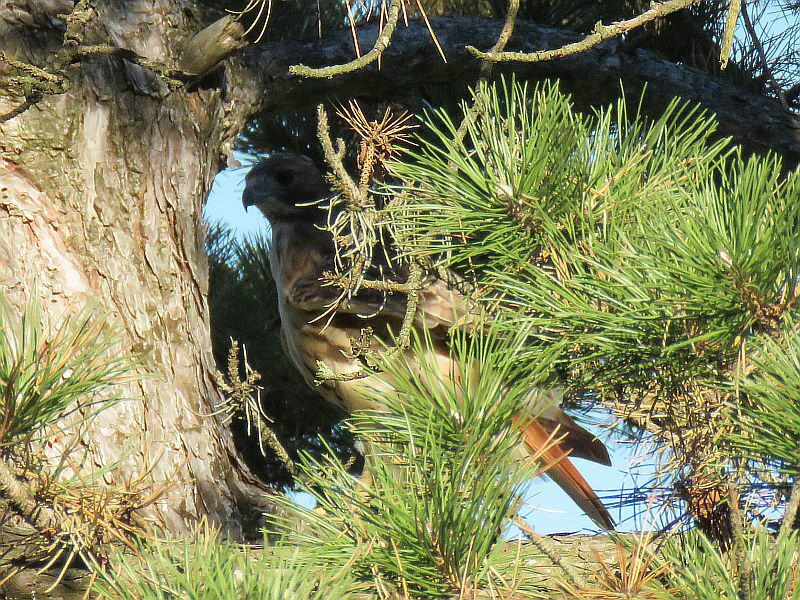 This bird was not shy- it came within 20-30 feet of the group of birders admiring it, seeming to pose for the cameras. 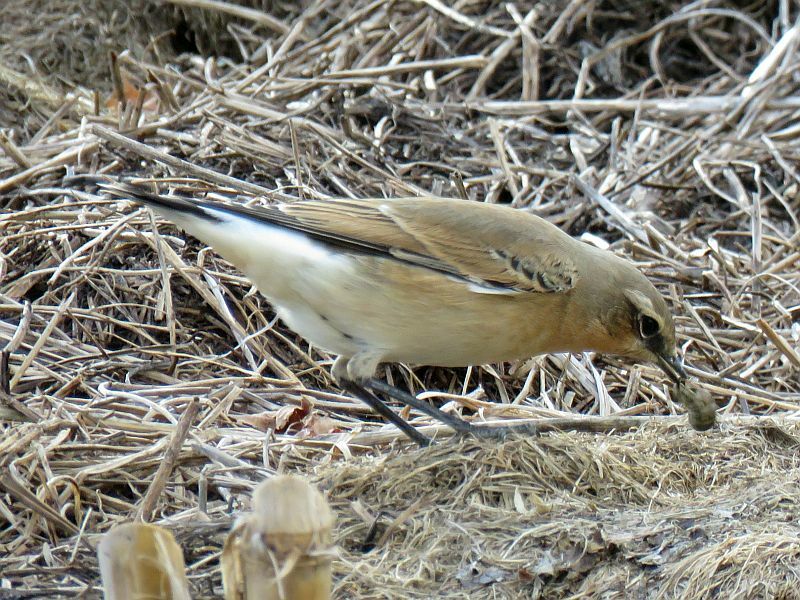 The Wheatear flew to the ground, finding a caterpillar for supper. 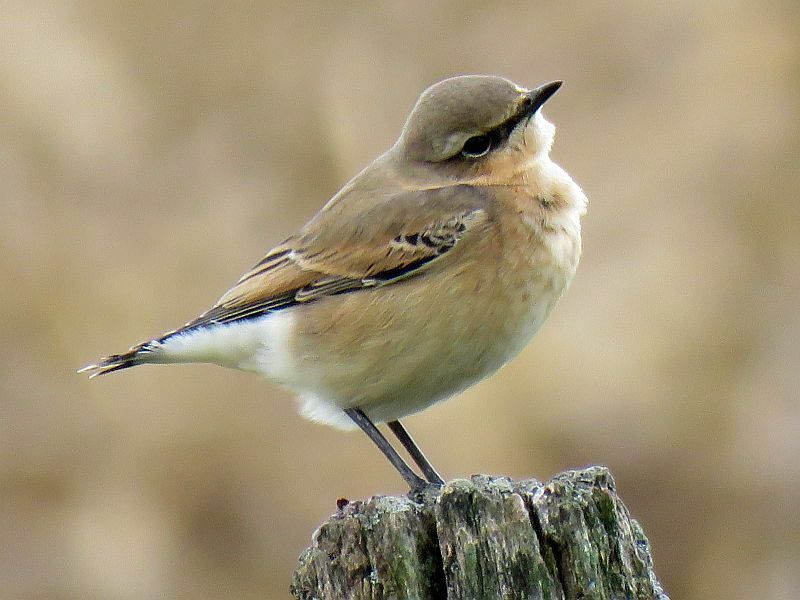 What’s so special about a Northern Wheatear? 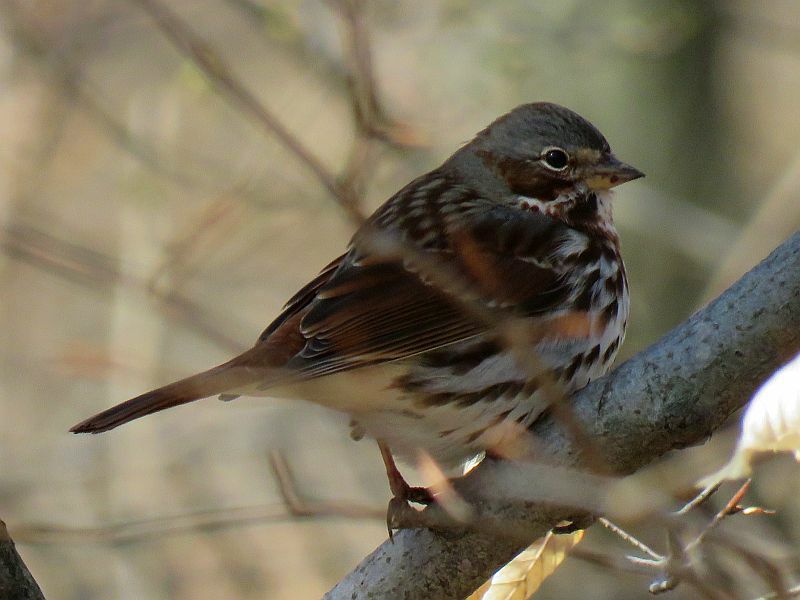 This Old World Thrush moves back and forth from the northern tundras of Alaska and northern Canada to and from its wintering grounds in Africa! 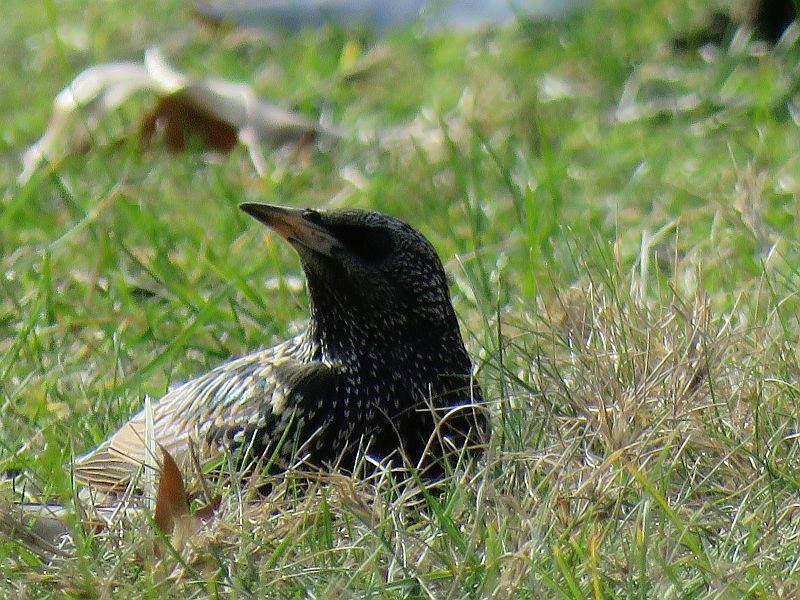 I’ll quote from the All About Birds article, Migrating Northern Wheatears Go the Distance—and Pack Accordingly. 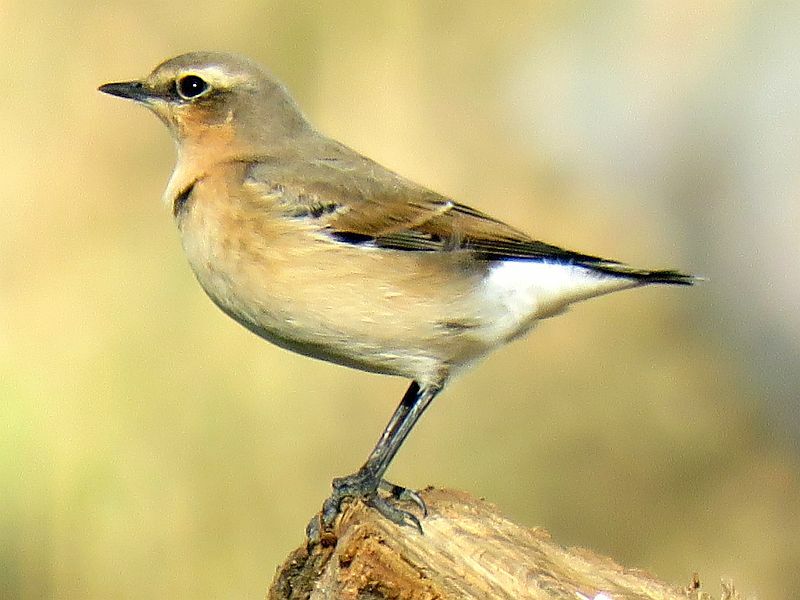 From the eastern arctic of Canada, Wheatears traveled through Greenland to northwestern Europe before flying south to western Africa. Their western arctic compatriots went the other way around the globe: they flew westward to Siberia and then diagonally across Asia to wind up in eastern Africa. 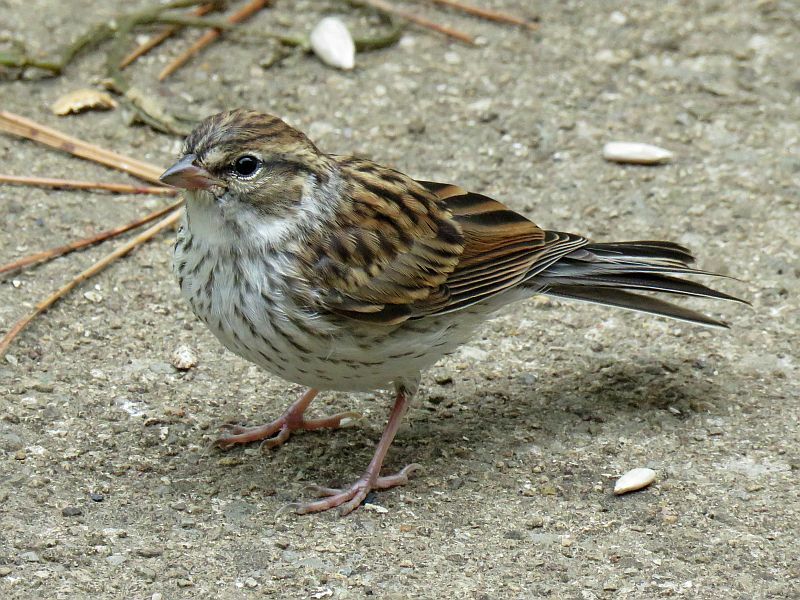 The migration distances are astonishing, particularly the Alaskan birds’ journeys, which added up to roughly 15,000 km. 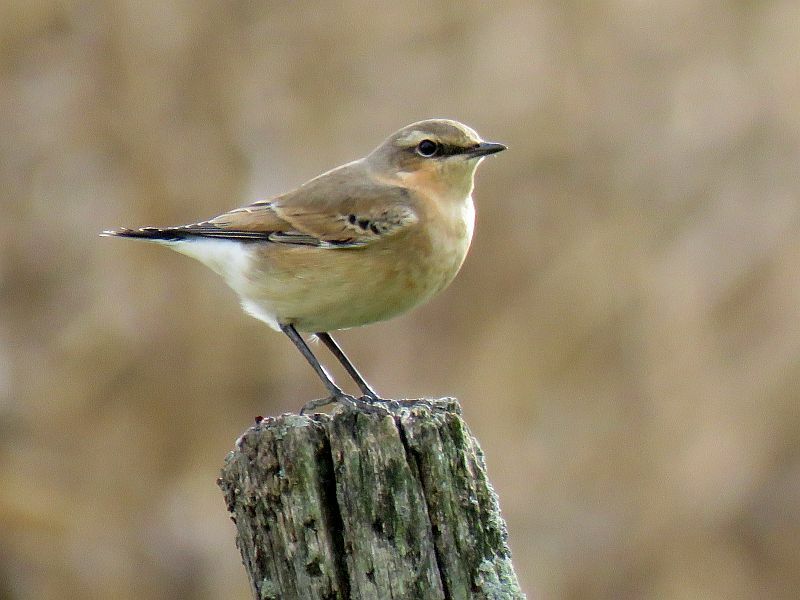 Wheatears from the eastern Canadian arctic traveled a mere 7,500 km, although the first leg of their journey was a 3,500 km trans-Atlantic crossing to Europe with only one possible resting point, Greenland, en route. 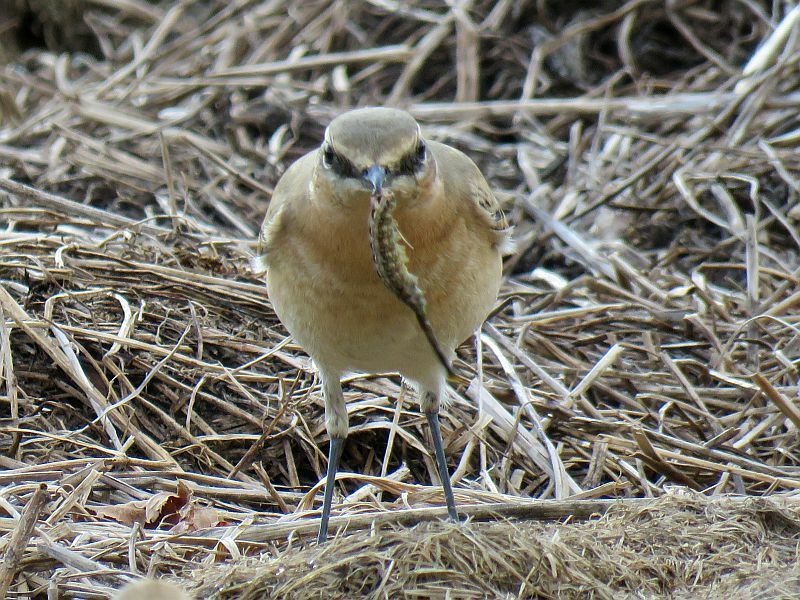 The time that wheatears spend on these migrations was what I found most surprising: birds traveling across Asia took roughly 3 months to reach Africa and two and a half months to return to North America. 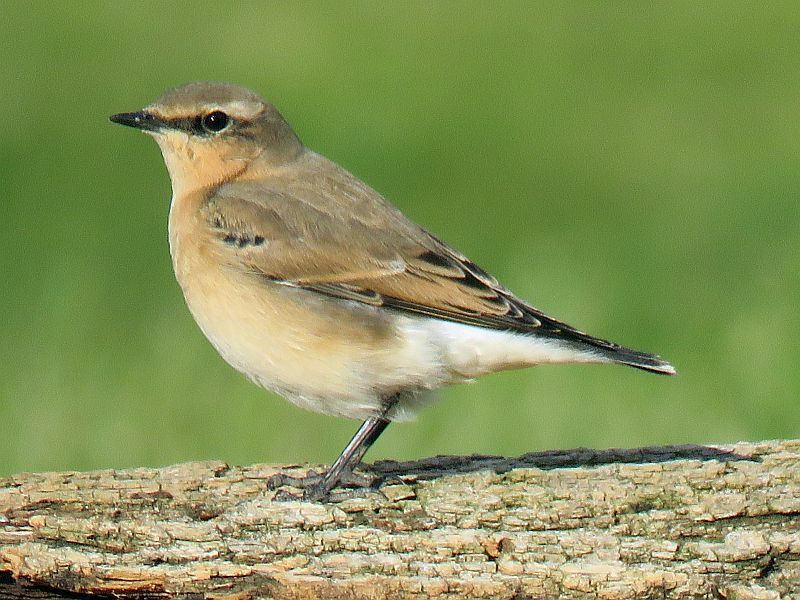 That’s comparable to the roughly 3 months that North America’s wheatears spend on their nesting grounds, and is only marginally less than they spend on their wintering grounds (4 or 5 months for western and eastern American arctic, respectively). 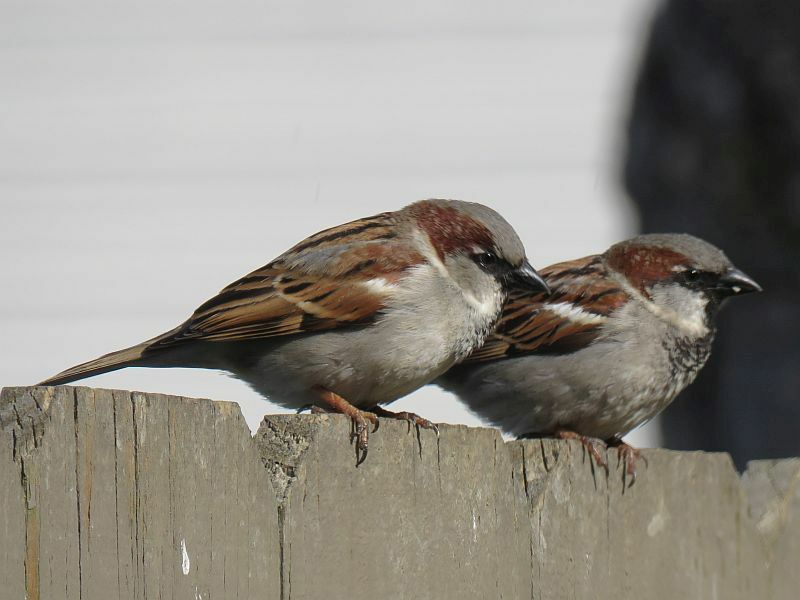 These birds were spending so little time in any one location that, if they were humans, they possibly would not be considered legal residents of any nation on earth! 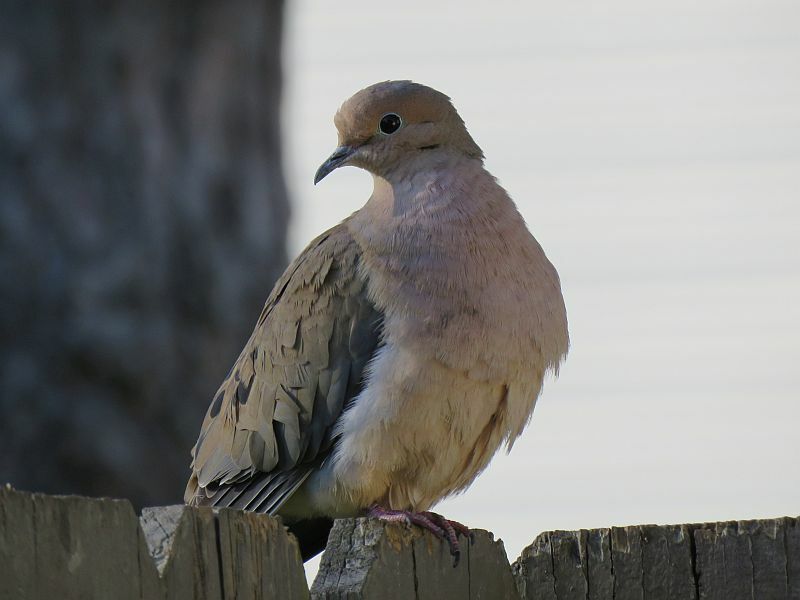 This bird gets huge respect from me, traveling for a living. They’ve only been recorded in Ohio six times. 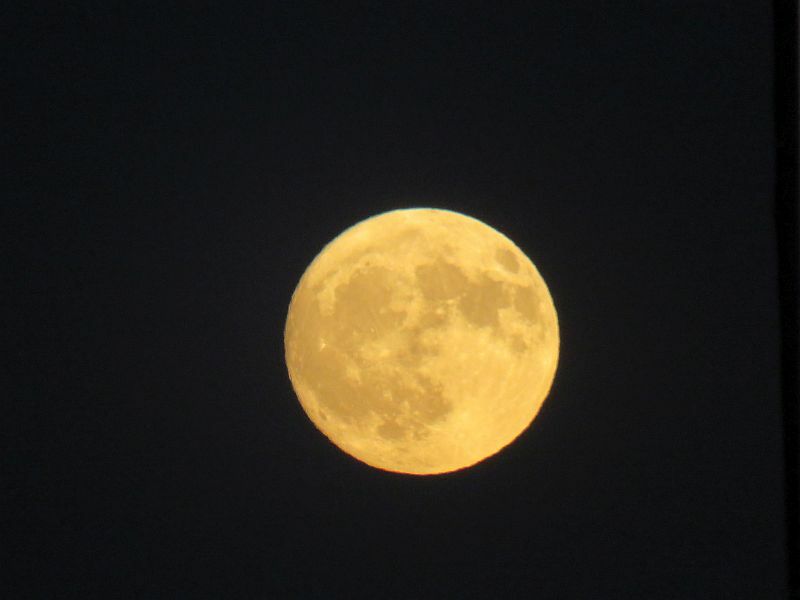 I made it home just as the crisp autumn sky turned dark. A very worthwhile trip- who knows when the next will happen?